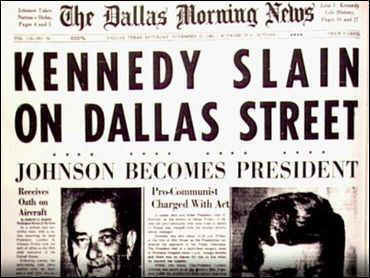 A day which will live in infamy. 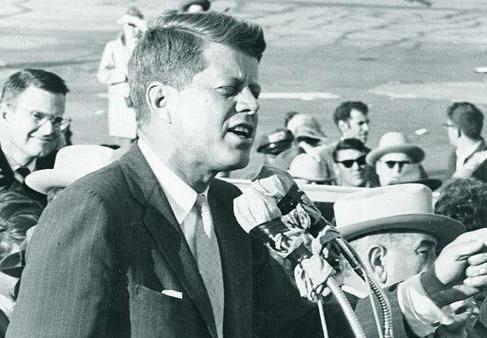 John F. Kennedy spoke at English Field in 1960 while on the campaign trail. 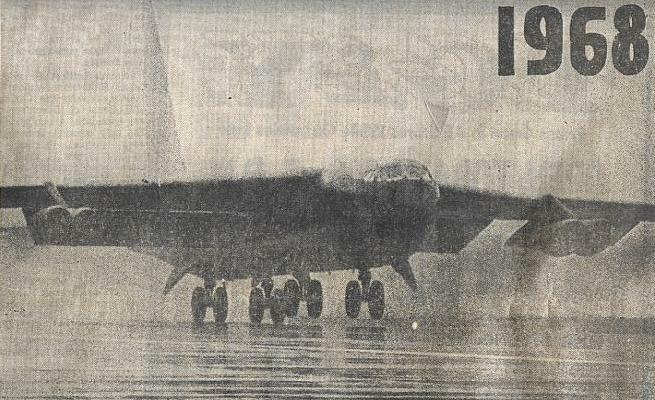 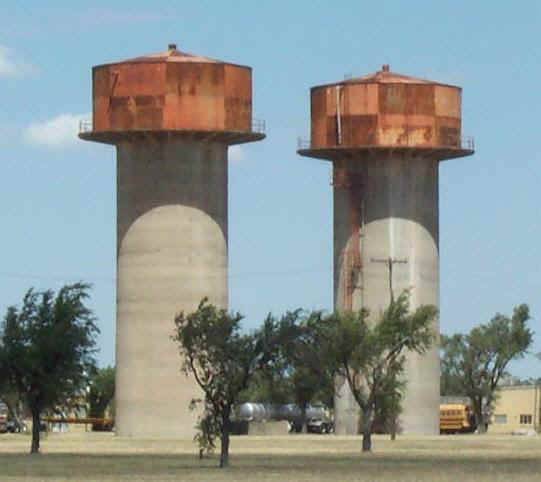 But roaring aircraft engines nearby made it difficult to hear. 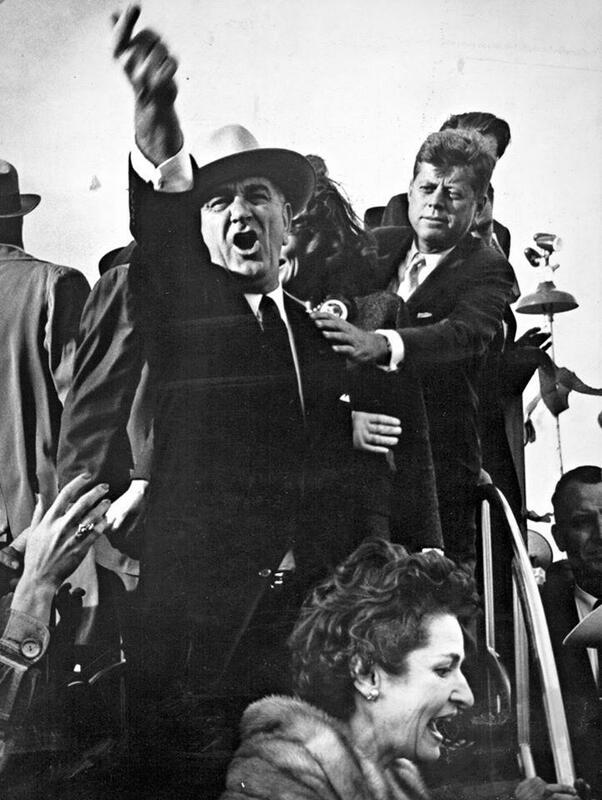 Running mate Lyndon B. Johnson was not pleased. 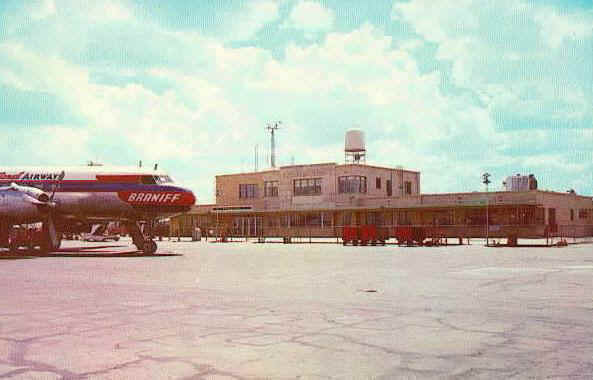 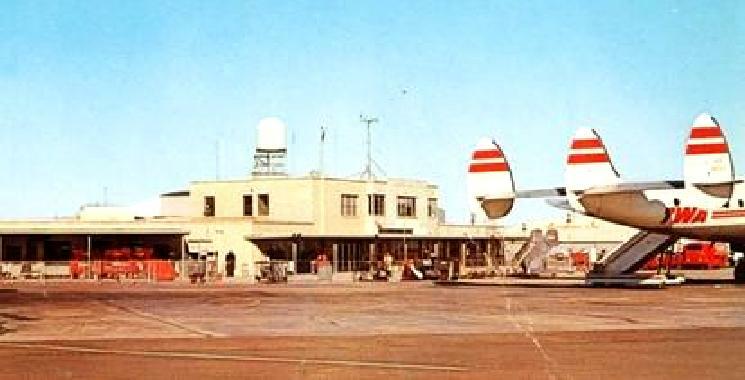 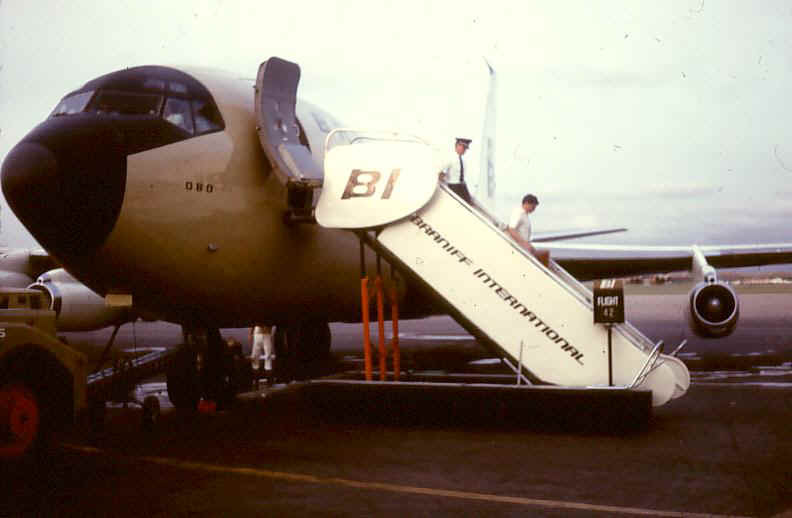 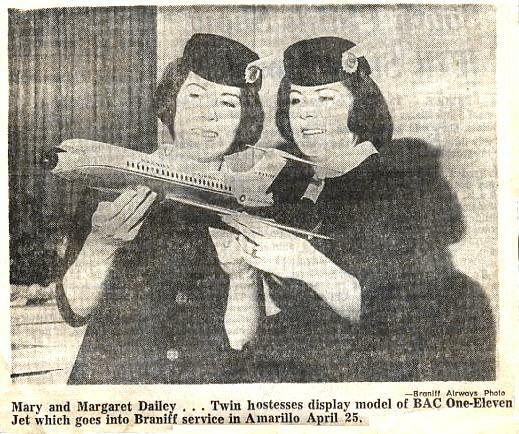 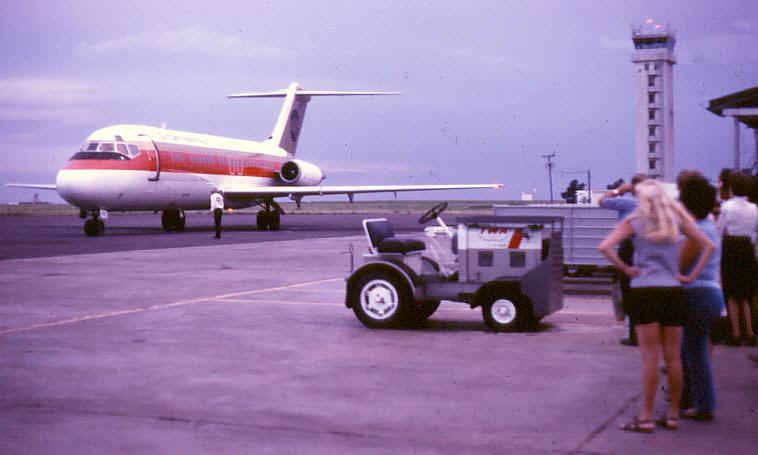 Braniff jet service began April 25, 1965.
then later using BOEING 727 airliners. 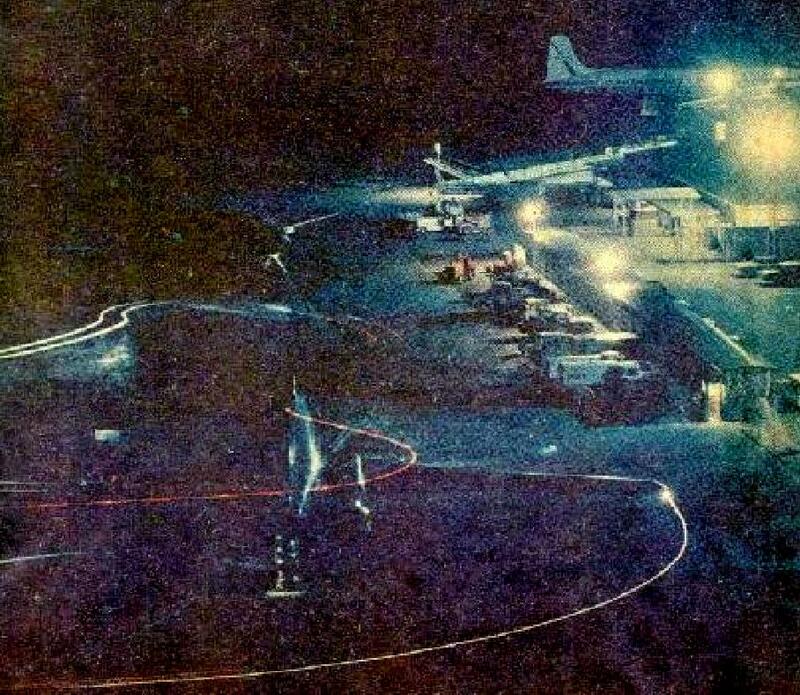 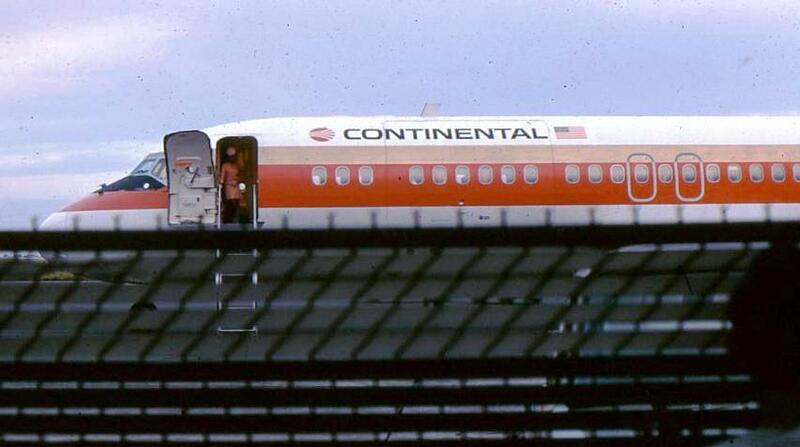 You walked out of the terminal, across the tarmac, and climbed stairs to board the plane. 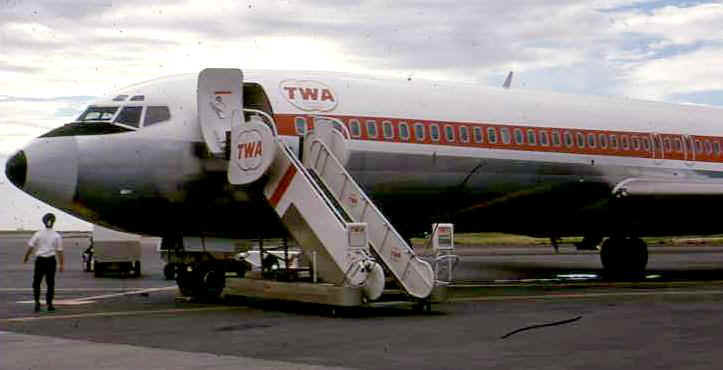 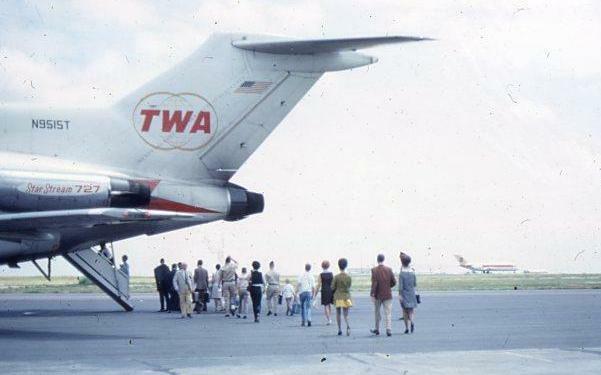 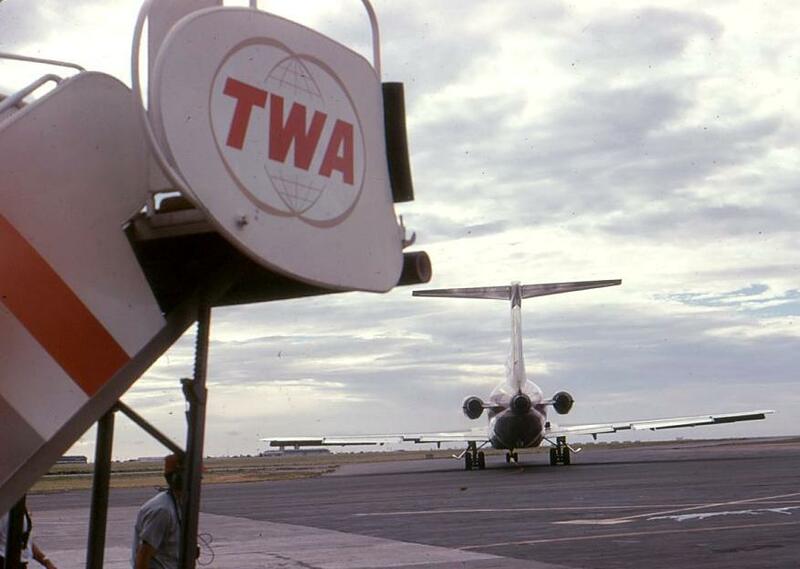 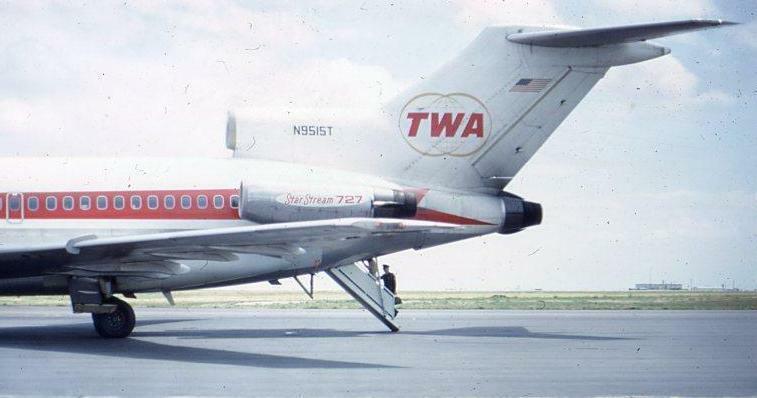 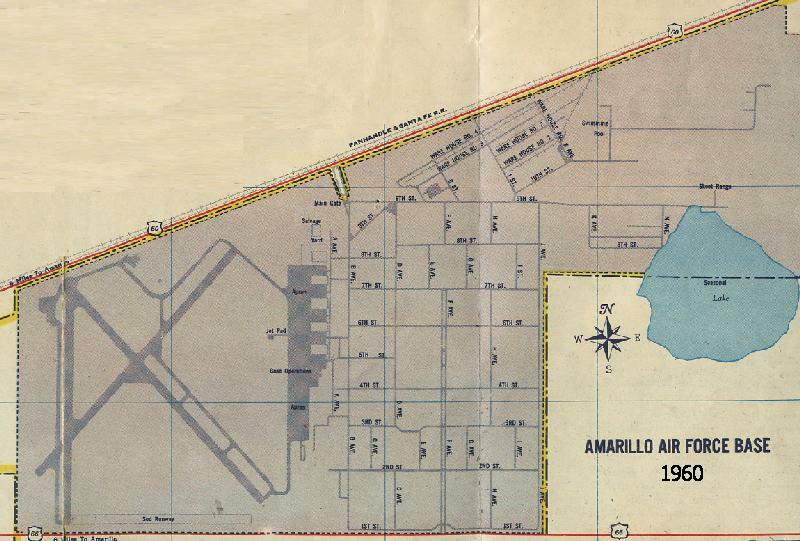 TWA's World Route Map included only Amarillo in the state of Texas. 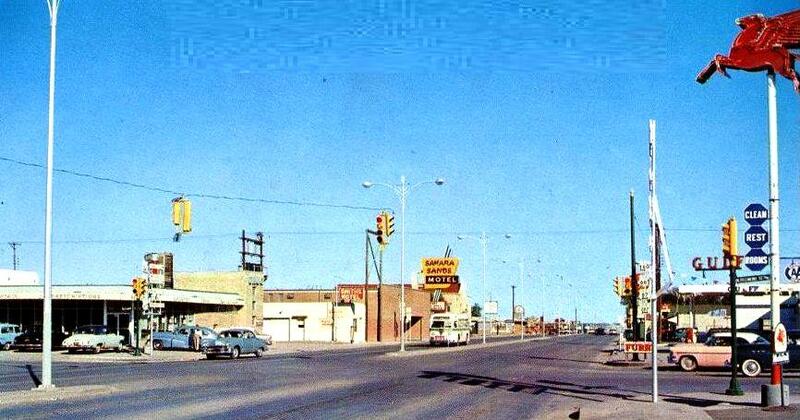 The corndog was invented in Amarillo on Route 66 in 1952 <><><><> It was first called a "Cozy Dog"
The busy boulevard in 1965, six lanes wide with abundant centered street lights. 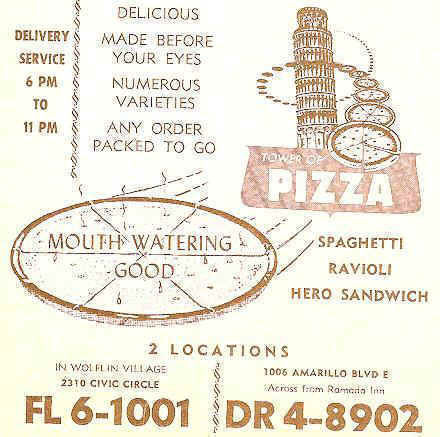 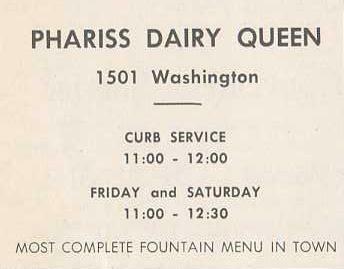 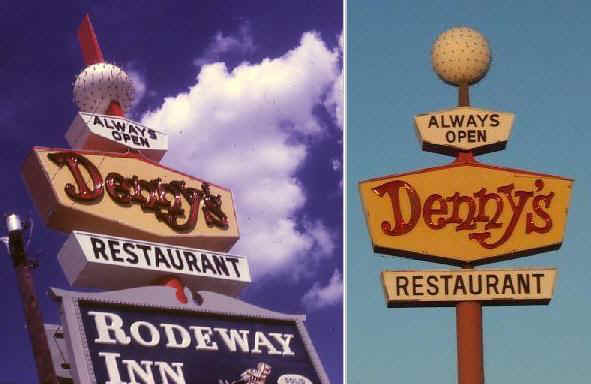 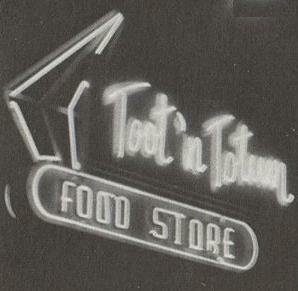 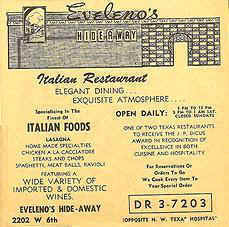 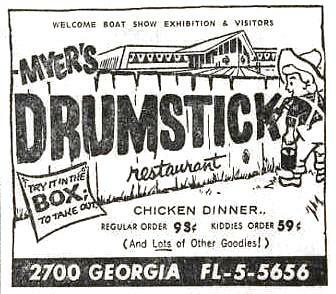 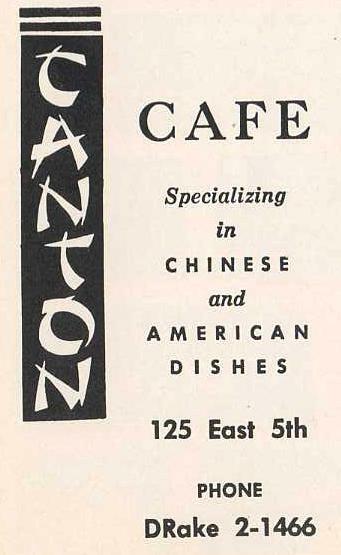 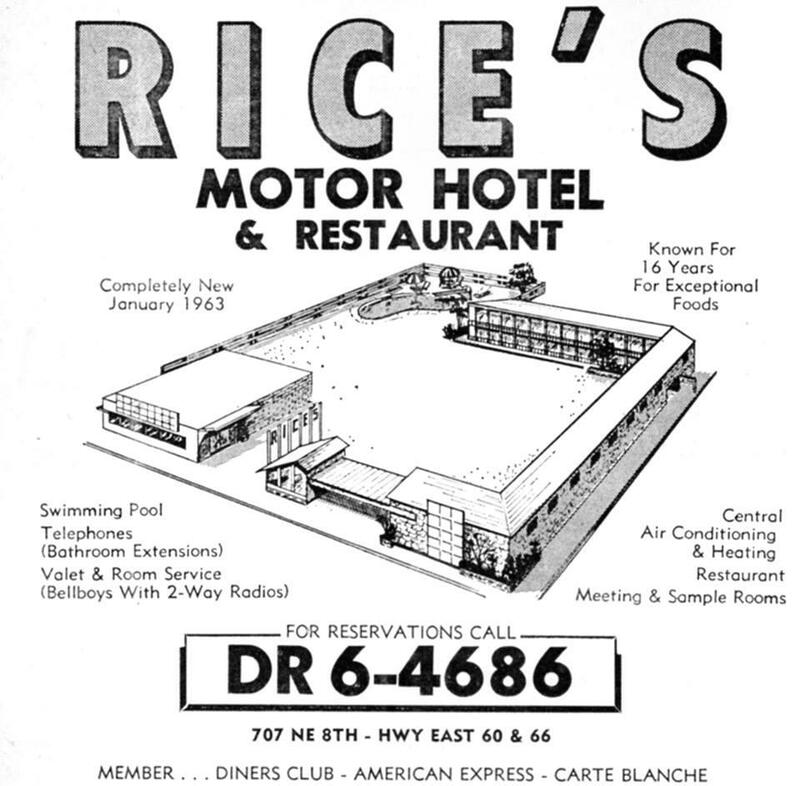 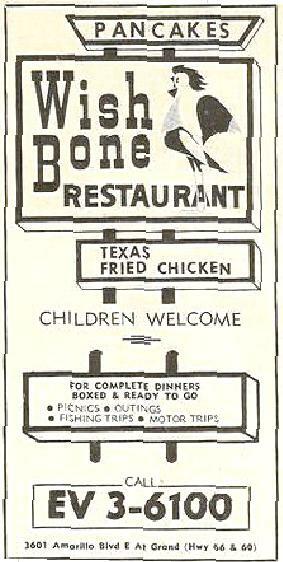 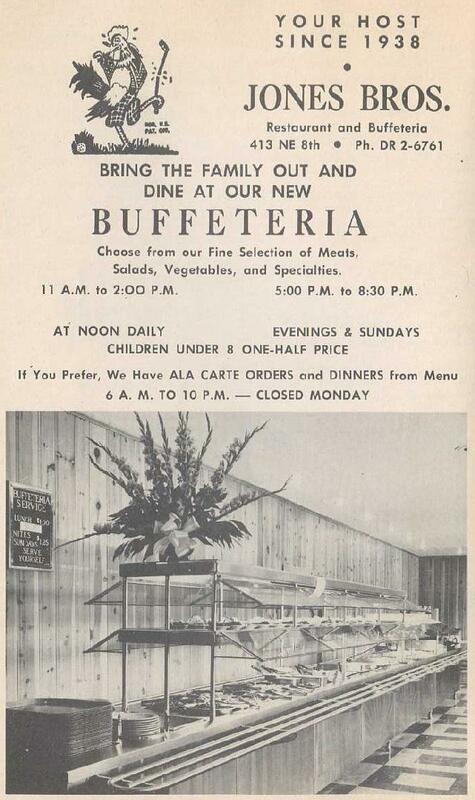 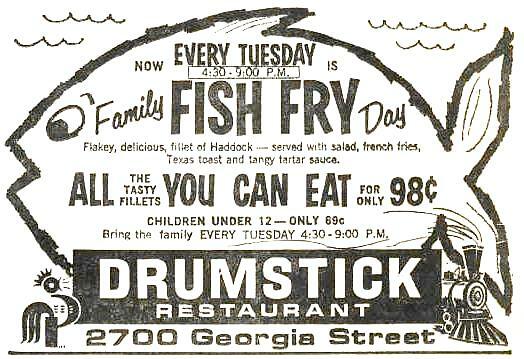 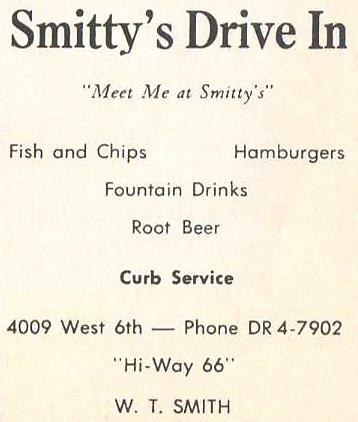 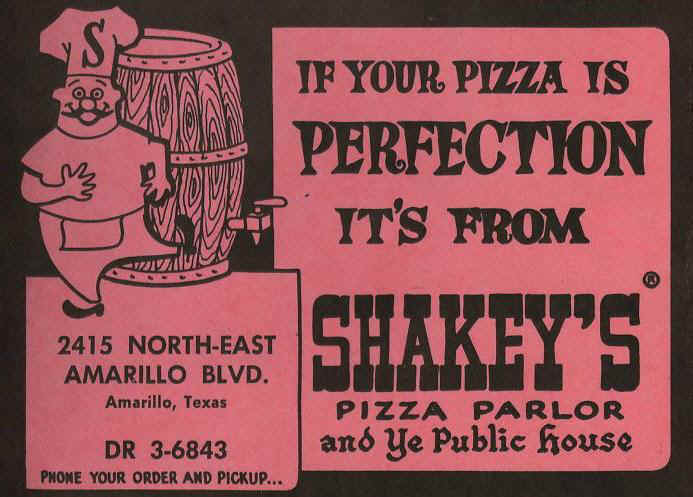 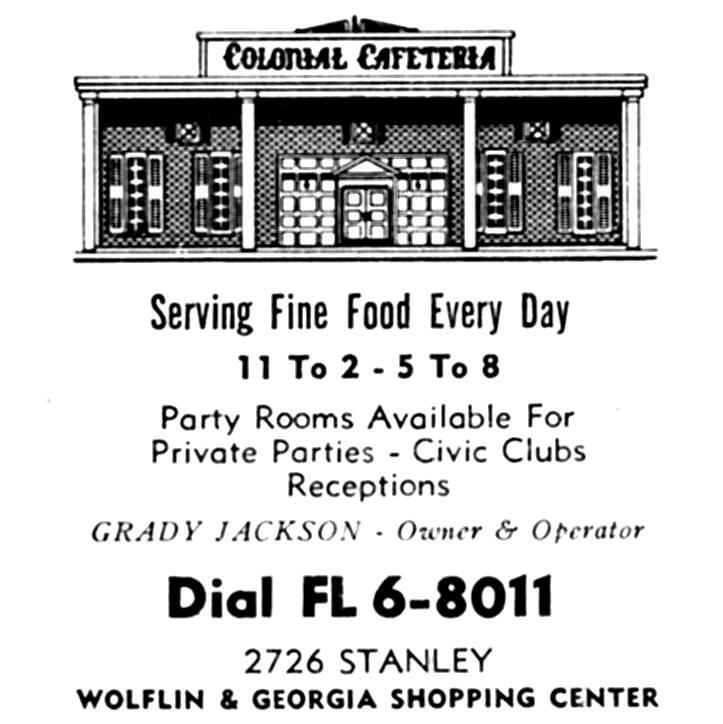 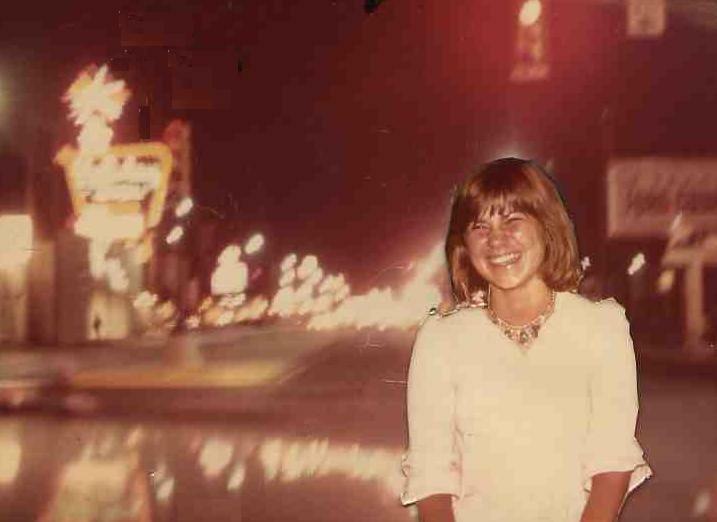 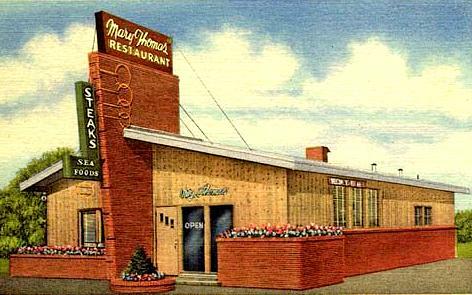 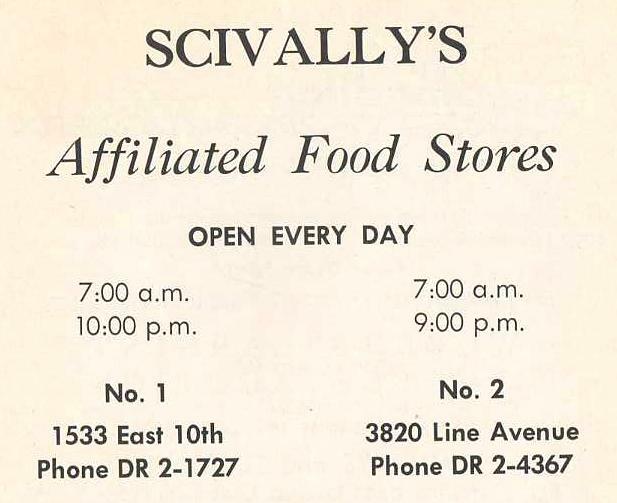 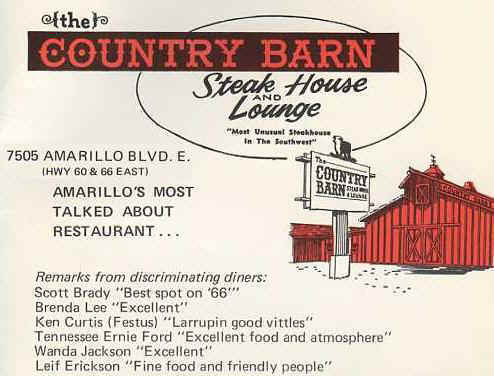 The best restaurants in town were located along "The Main Street of America" in the '60s. 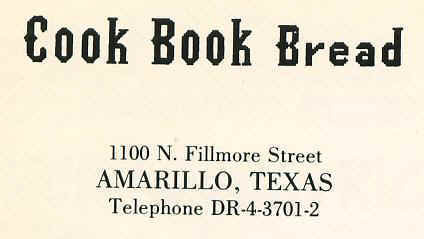 N. E. 8th (Amarillo Blvd.) 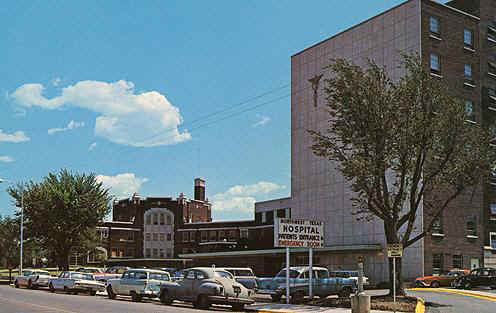 from atop St. Anthony's Hospital about 1960. 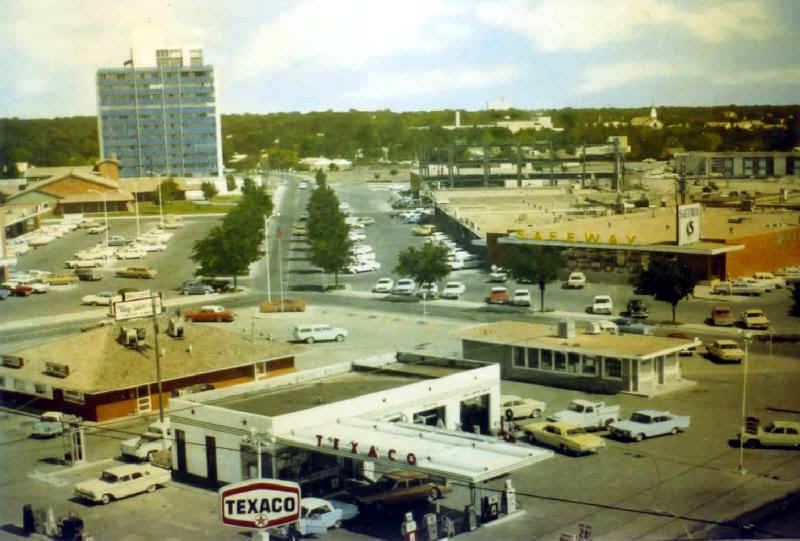 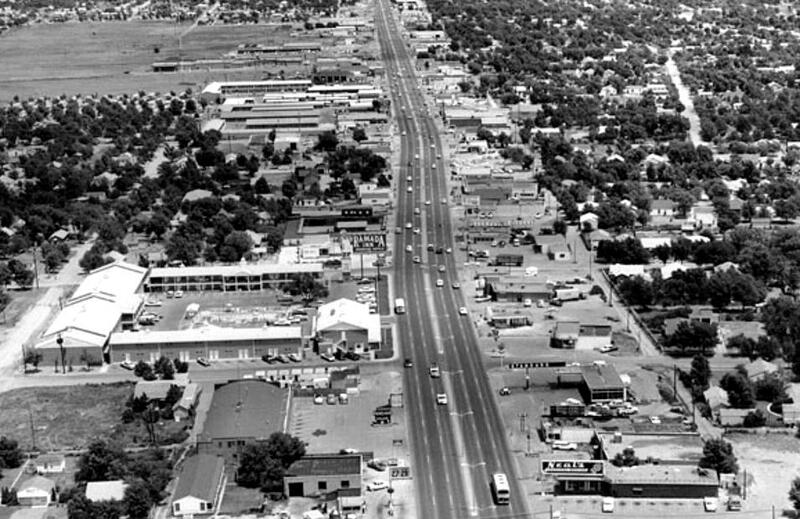 ABOVE: N. E. 8th at Fillmore St. BELOW: N. E. 8th near Ridgemere St.
About a hundred motels and just as many gas stations were on Amarillo's Route 66. 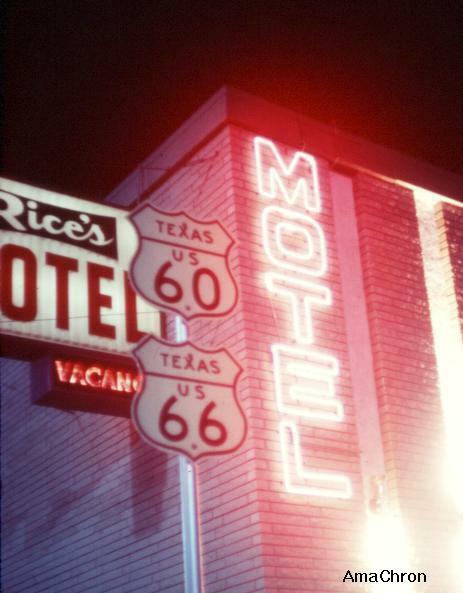 Motels installed 3, 4, and 5 story signs, Las Vegas-like, along the six lane route. 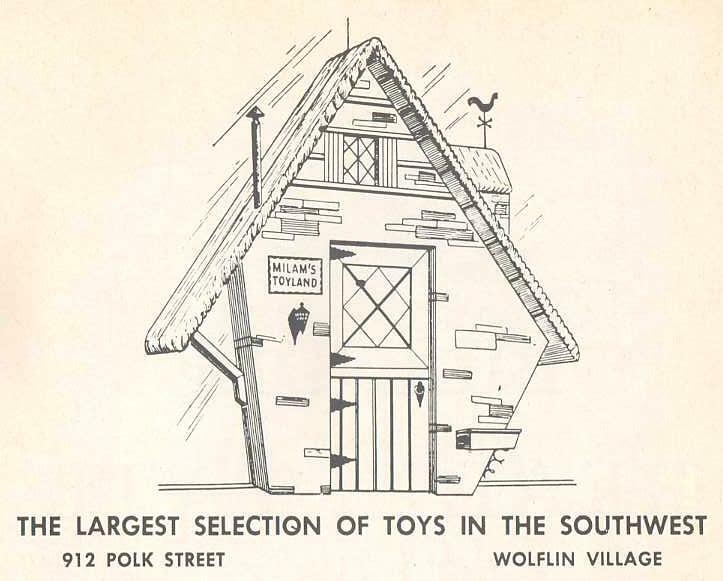 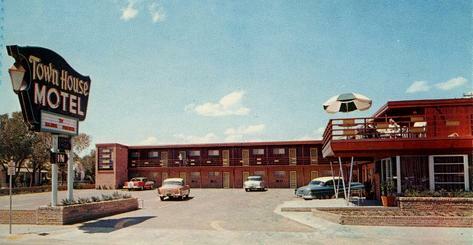 BELOW: The Toddle House on Route 66 at Park Plaza. 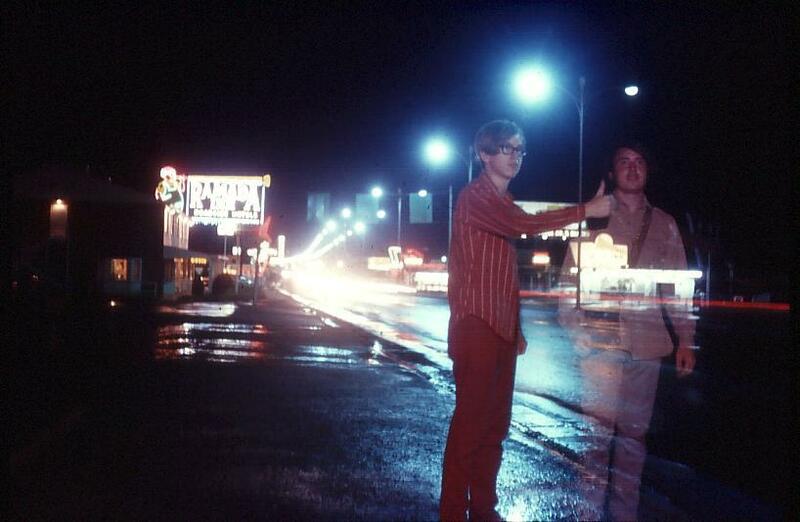 Jerry Young is the magician making David Anderson appear on a rainy Amarillo Blvd. 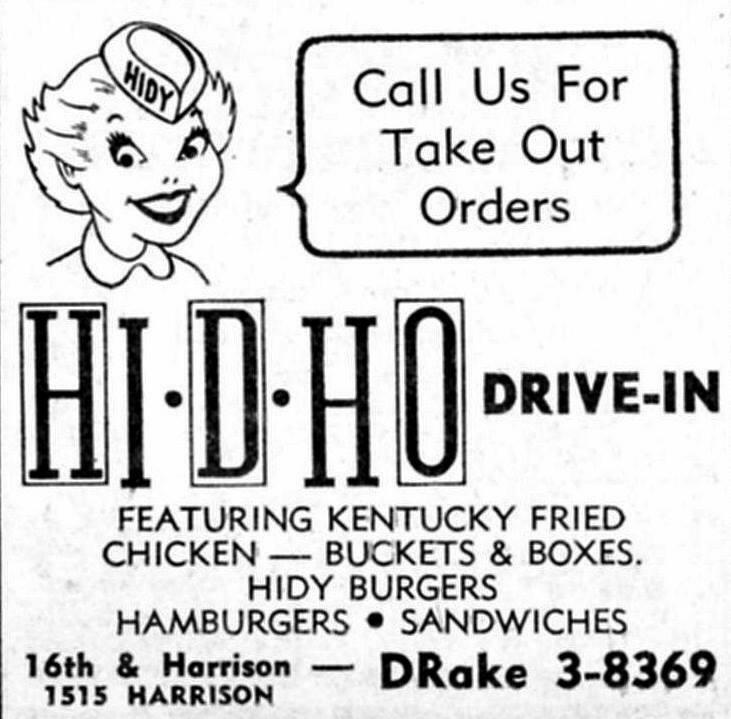 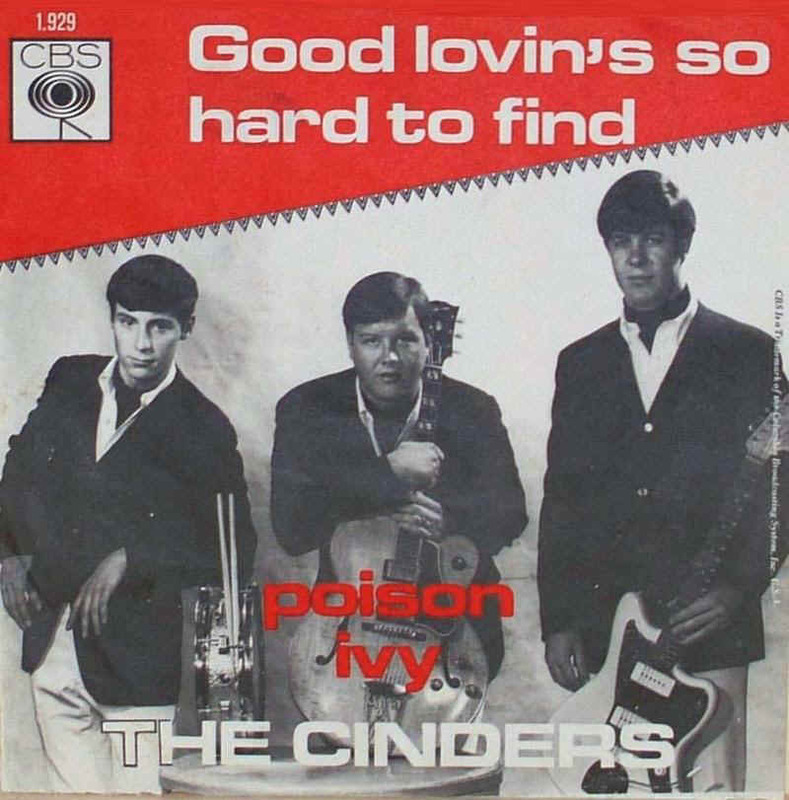 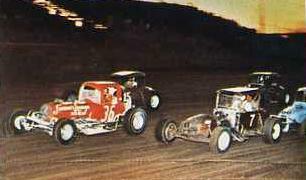 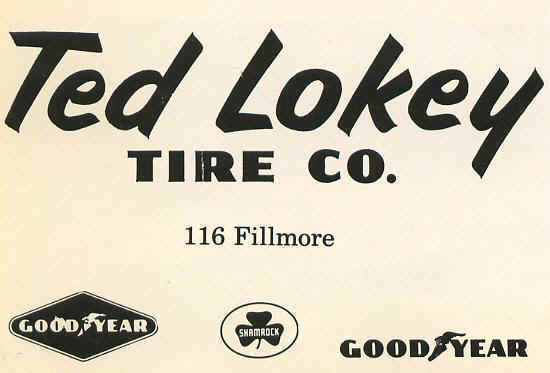 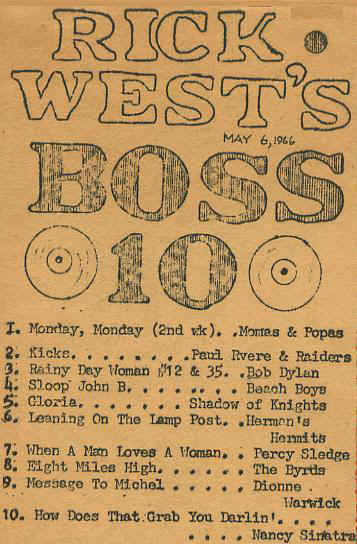 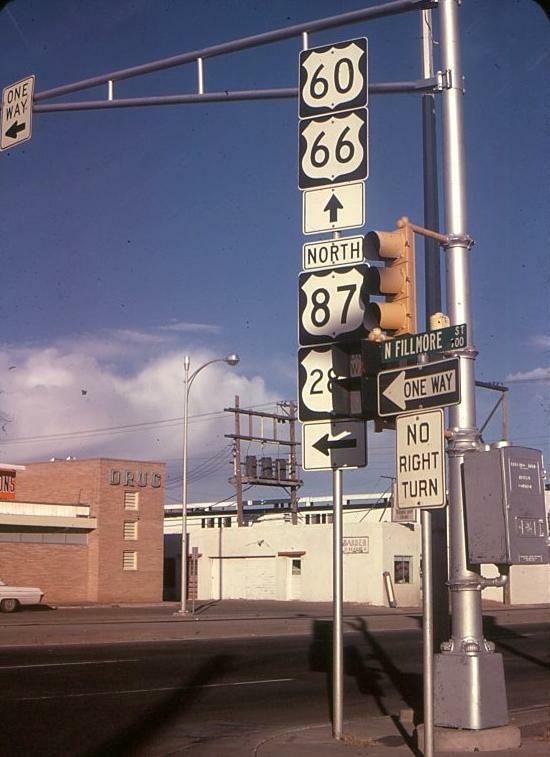 (1967). 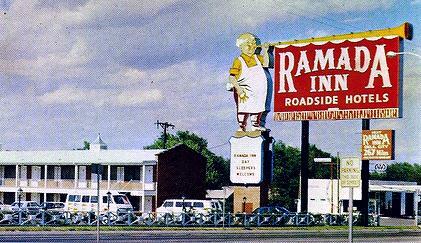 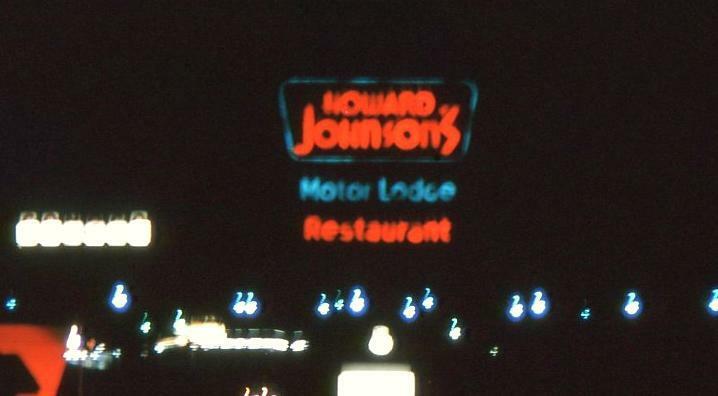 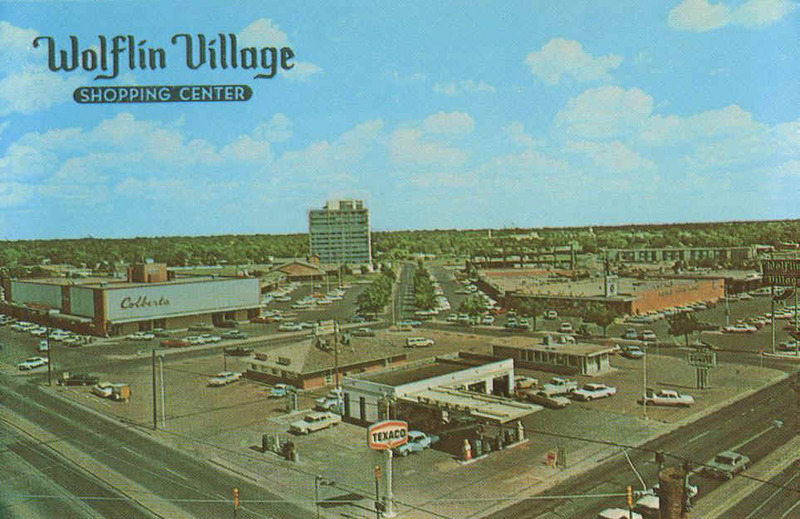 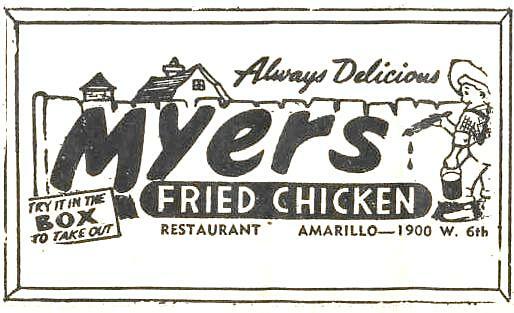 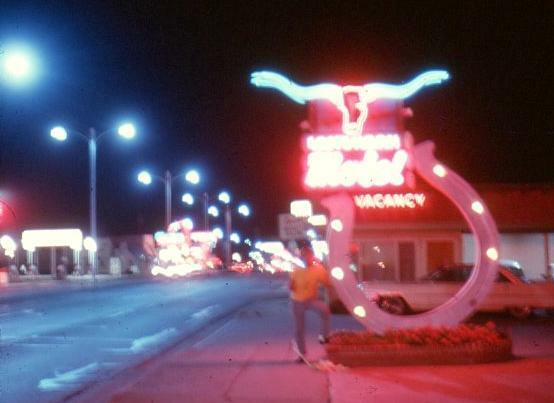 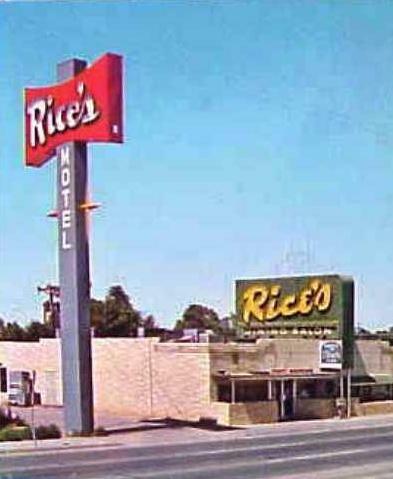 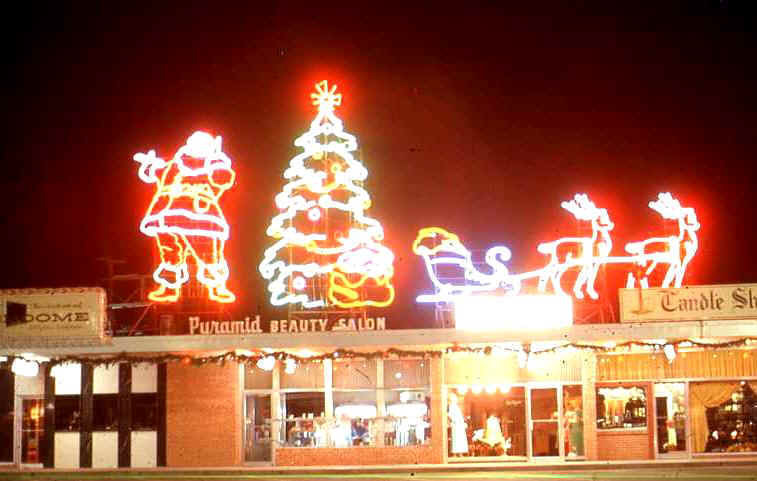 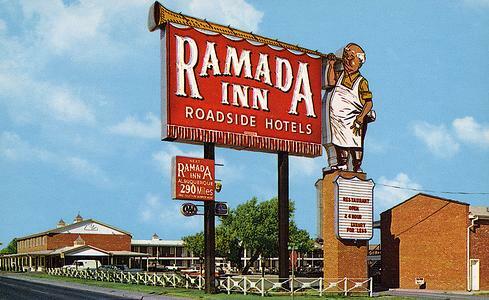 There were three Holiday Inns on Amarillo Blvd, each with it's own 60 foot tall sign. 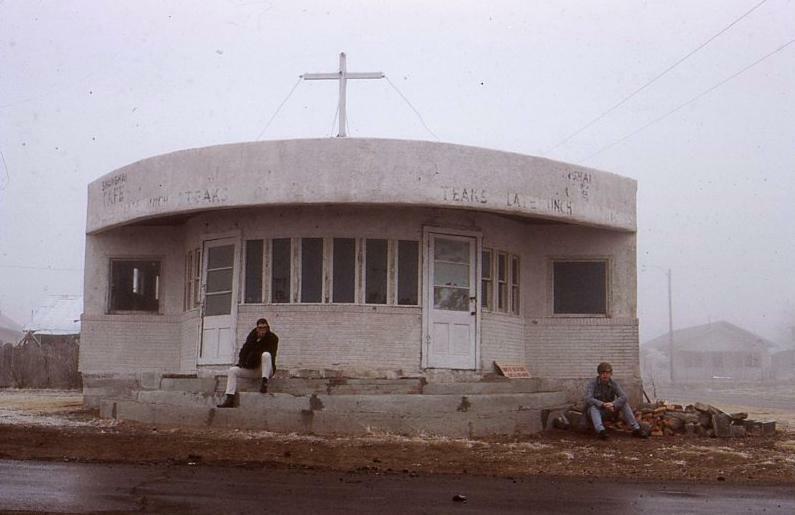 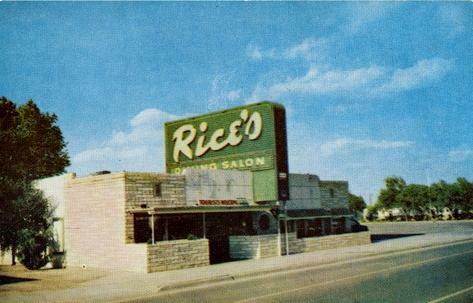 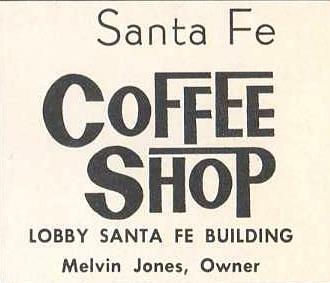 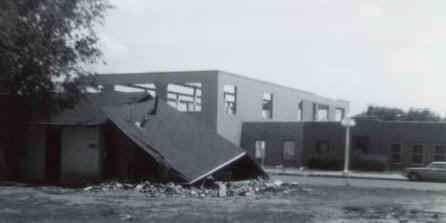 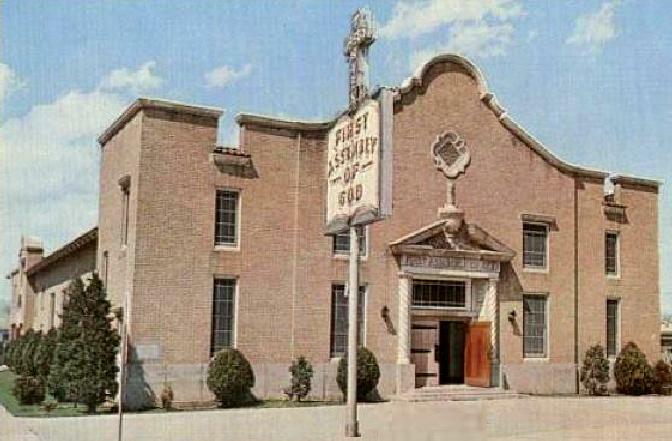 This unique building housed a cafe on E. Amarillo Blvd (NE 8th) before being moved west to near Hughes to become a church. 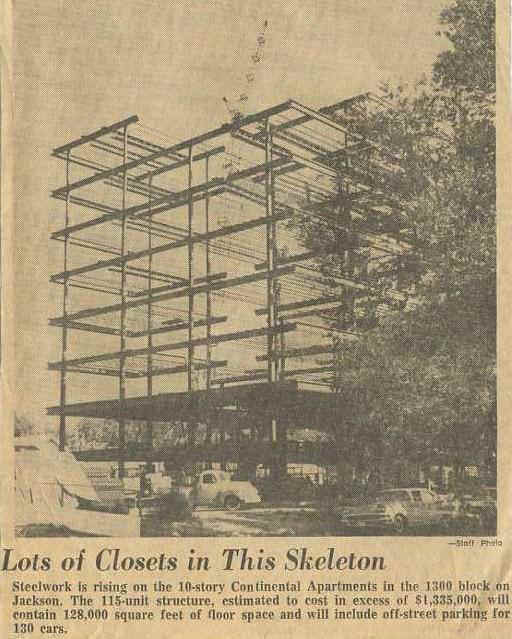 Many of these buildings are still standing. . .many are not. 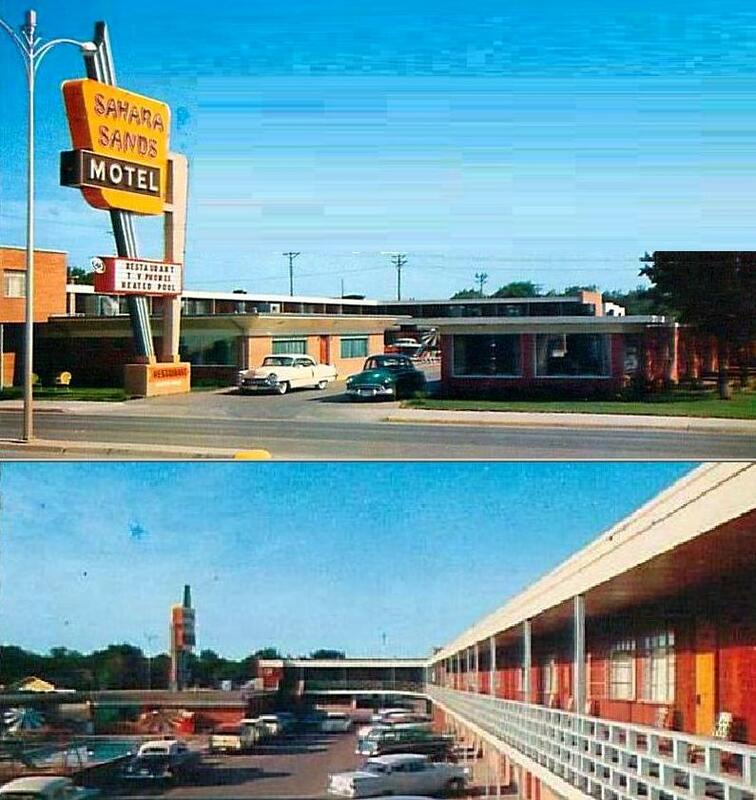 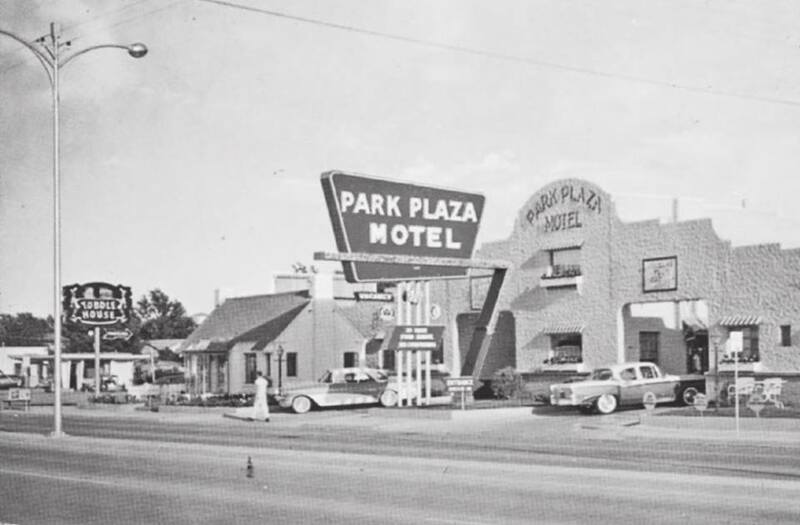 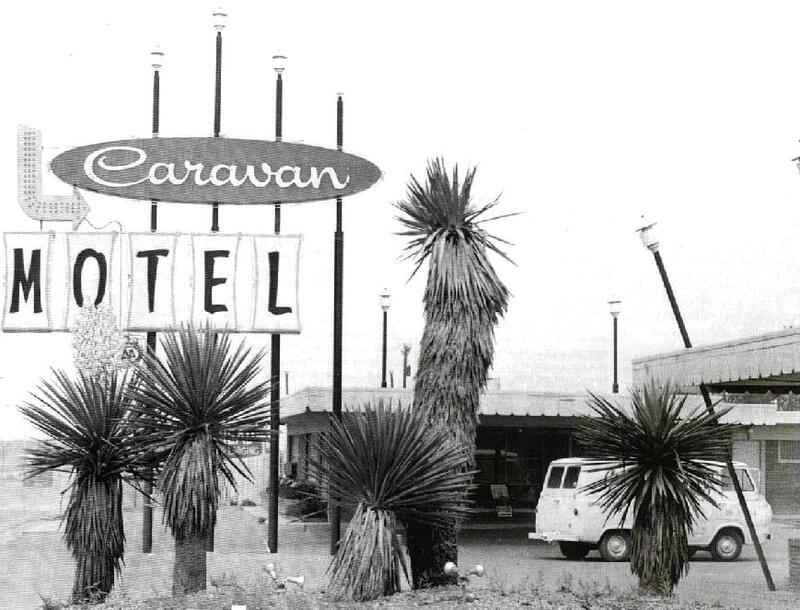 (1960) The Sahara Sands Motel was located at Amarillo Blvd and Pierce St. 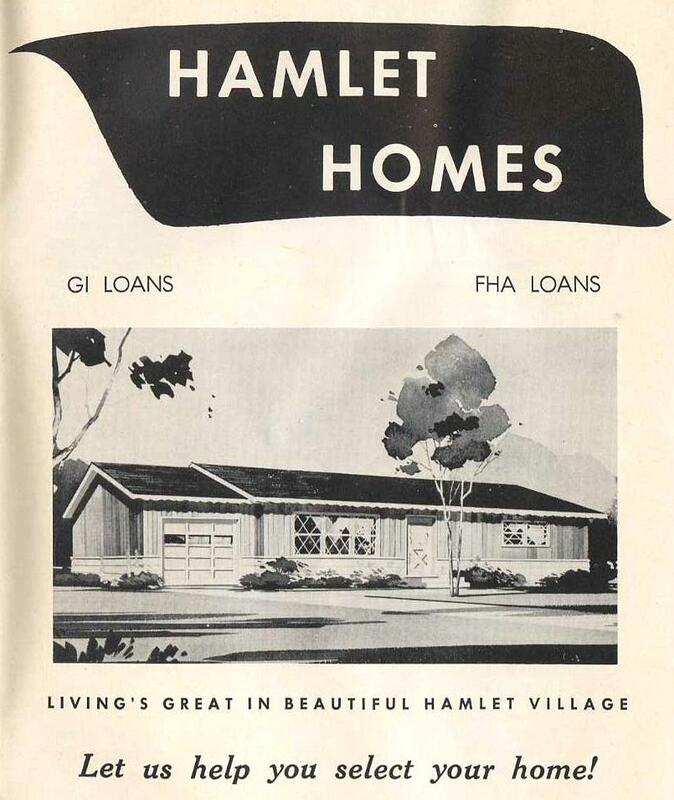 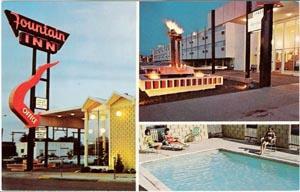 It later became a Holiday Inn. 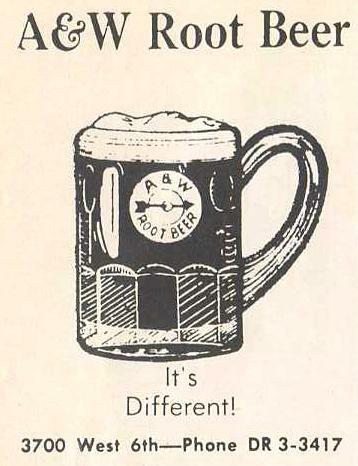 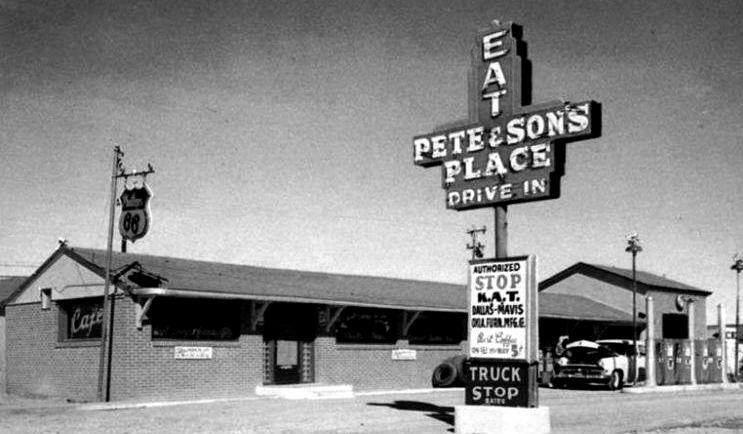 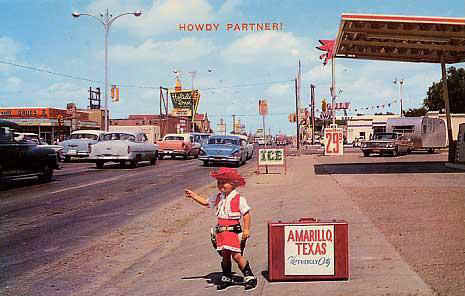 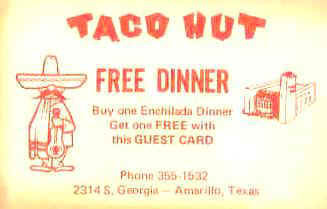 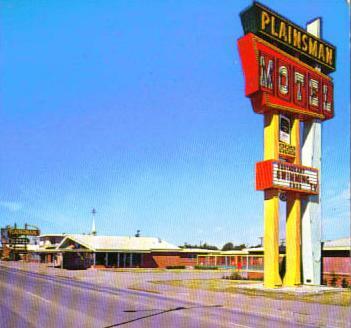 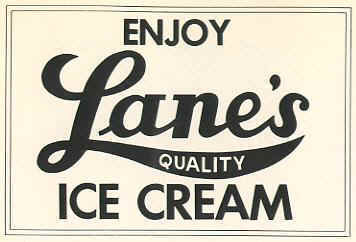 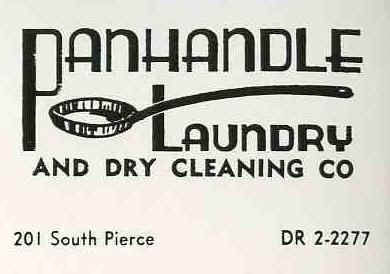 The Towne House Motel is still in business at Amarillo Blvd and Tyler St.
Bill's Truck Stop was at I-40 And Pullman Rd. 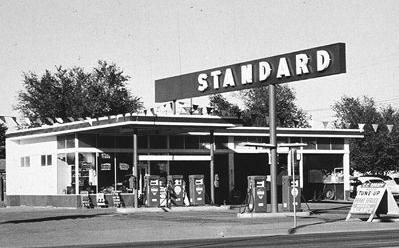 Standard Station on N. E. 8th at Johnson St. 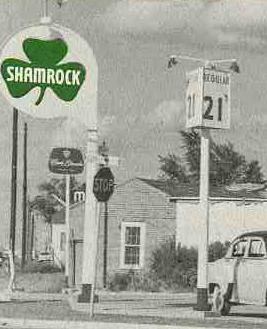 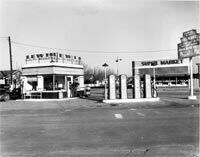 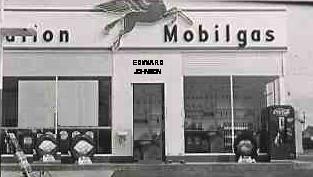 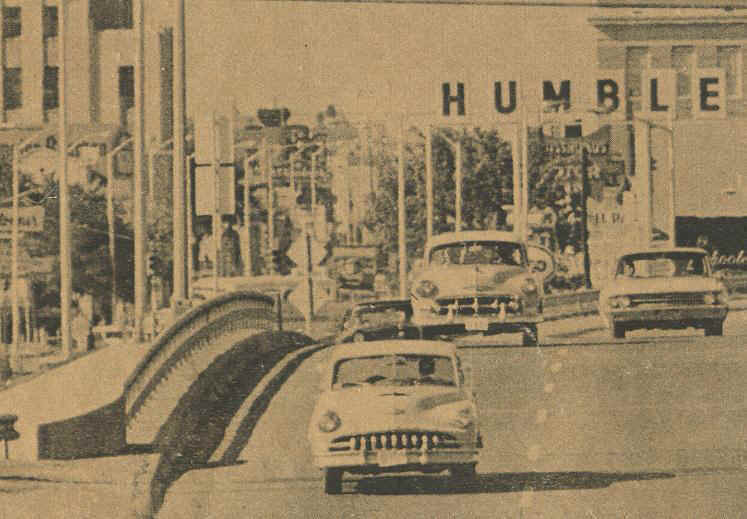 The Hudson Station at N. E. 8th and Lincoln sold gas for 21¢ (regular) / 23¢ (ethyl) a gallon about 1960. 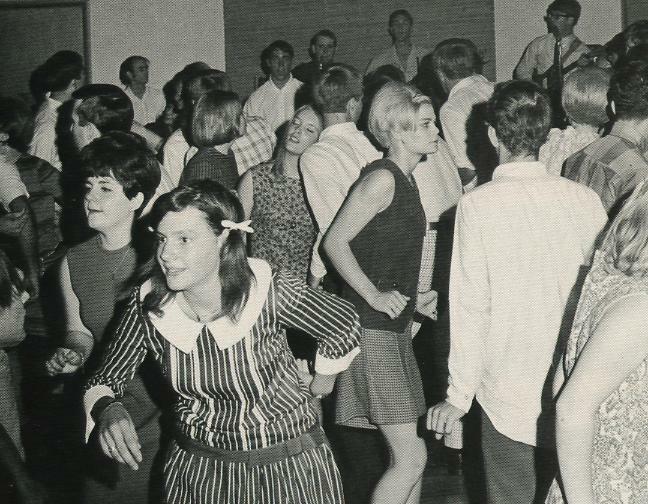 A Palo Duro High School dance in the early 60's. 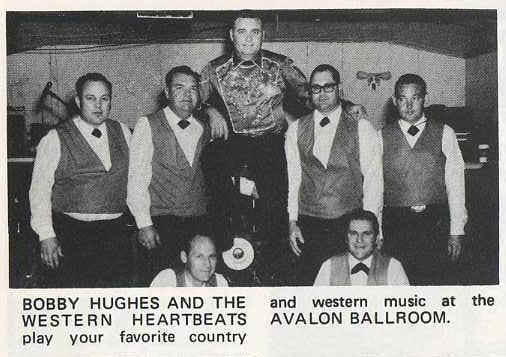 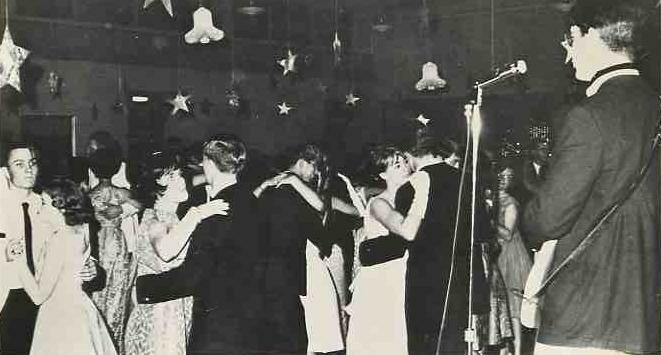 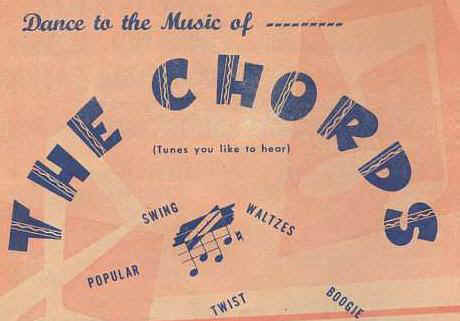 The Chords entertain at a high school dance in 1965. 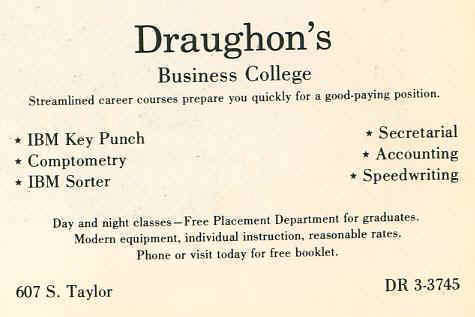 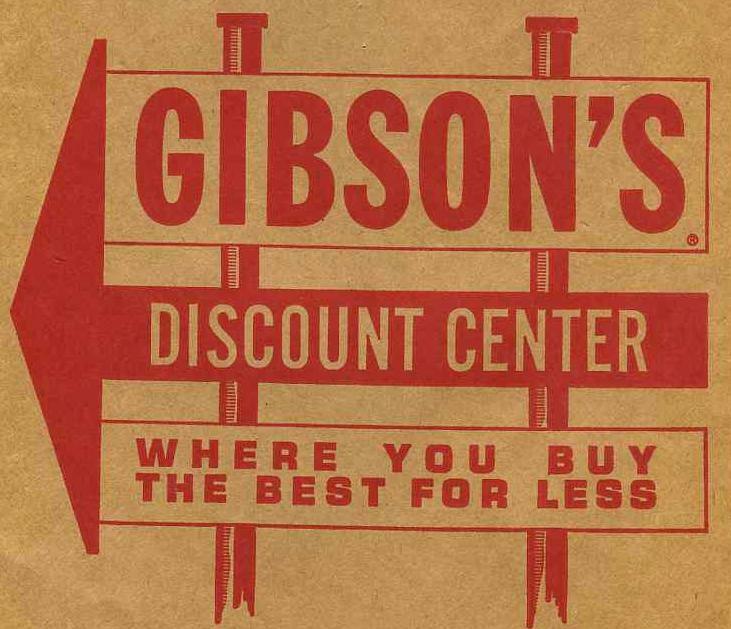 Draughon's Business College was located Downtown above the Russell Stationary store. 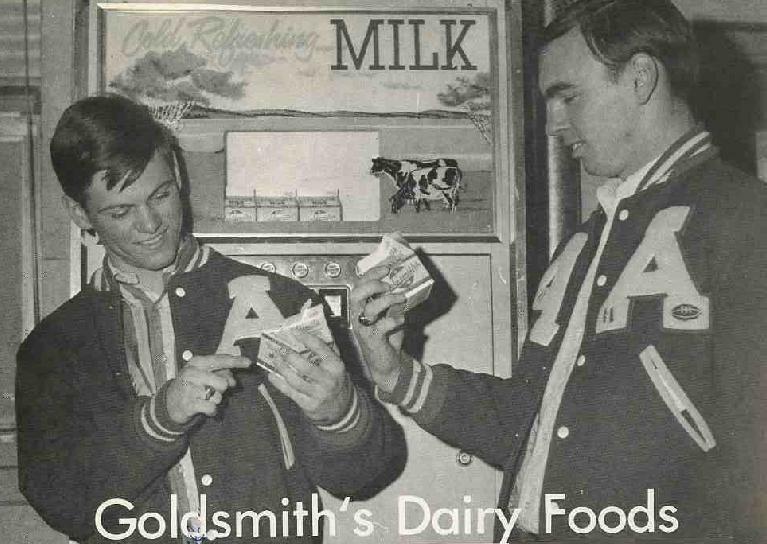 Johnny Thompson and David May try a mini-carton of Goldsmith's Milk (1965). 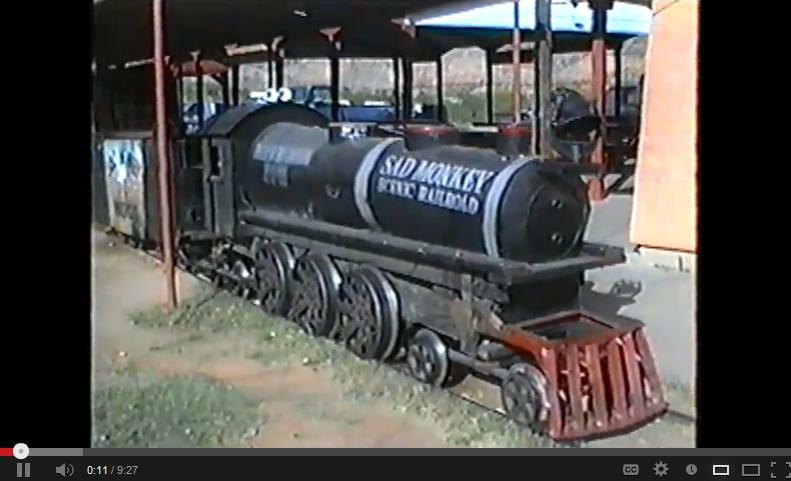 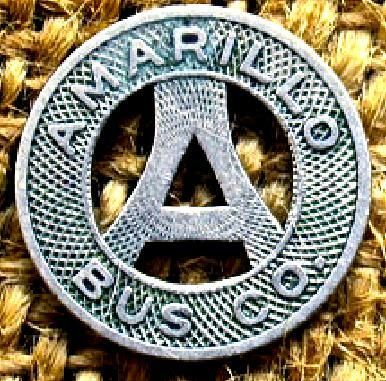 with a dozen tracks in the Amarillo area. 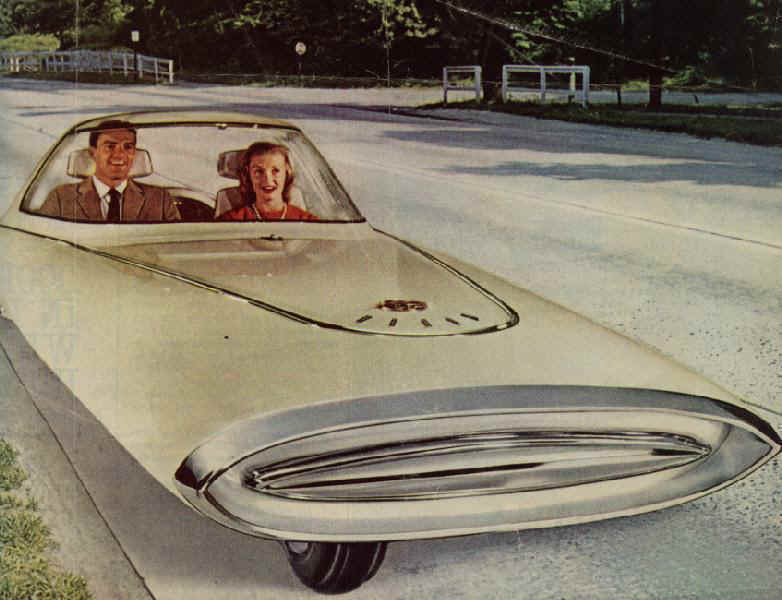 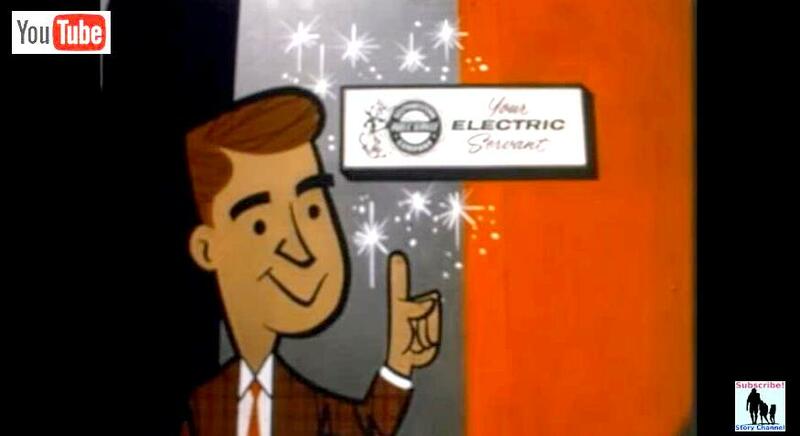 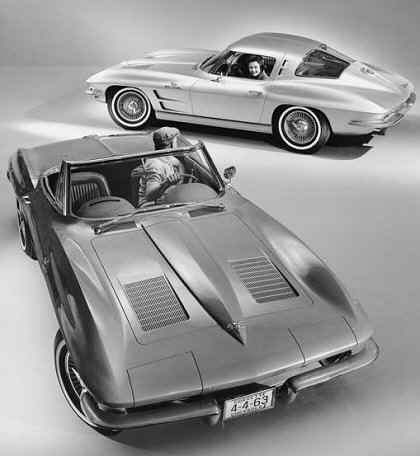 But the concept had almost ceased to exit by the end of the decade. 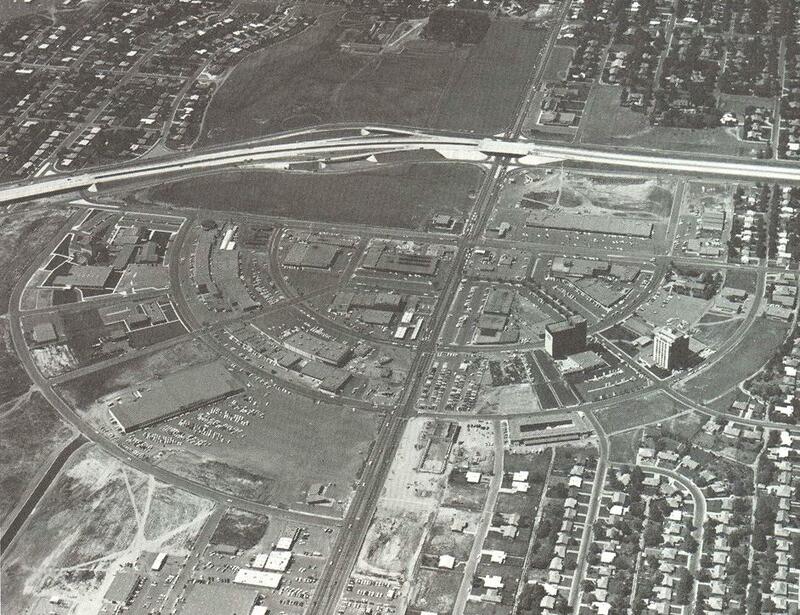 just west of where the UA-14 IMAX Cinema is now located. 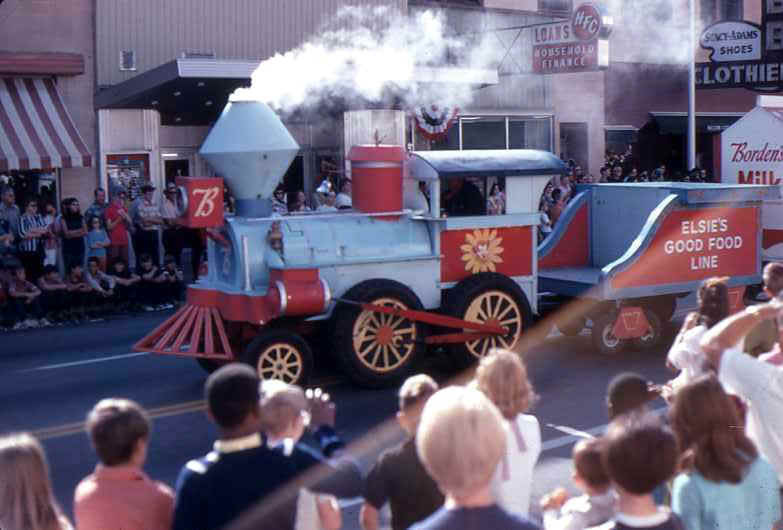 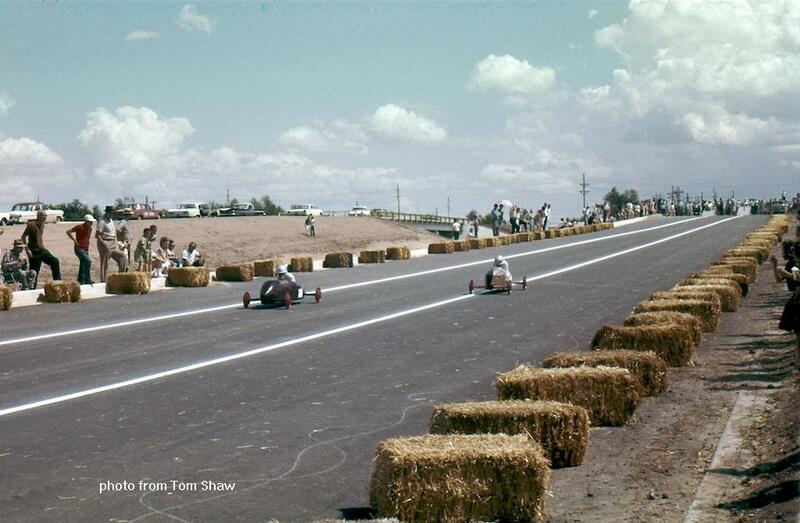 The 1963 SOAP BOX DERBY at NW 24th Ave and Polk Street. 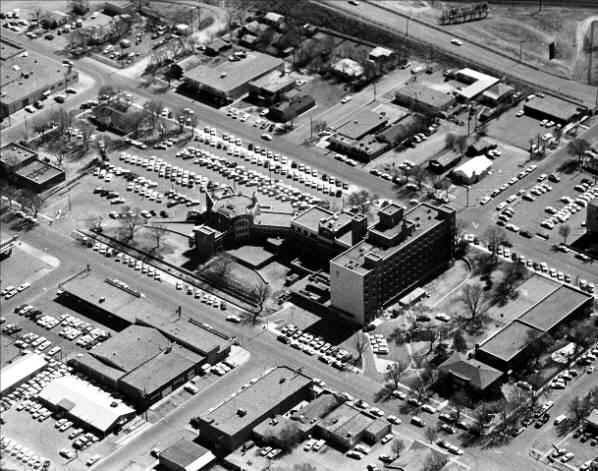 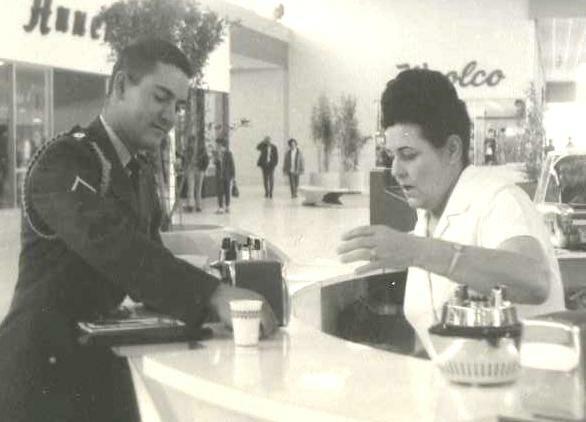 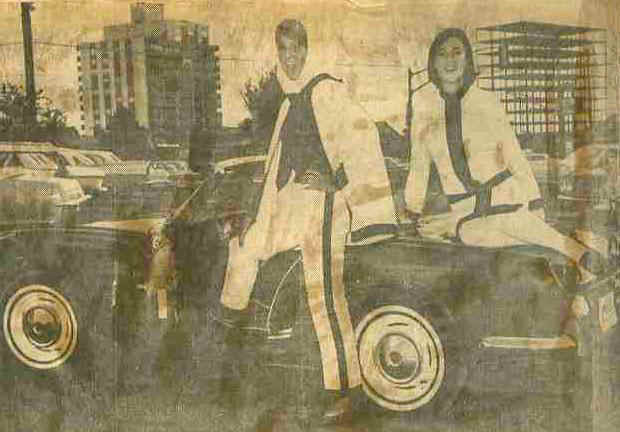 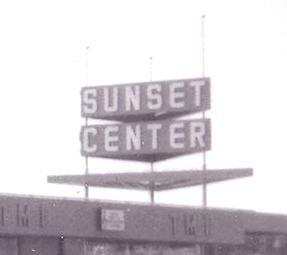 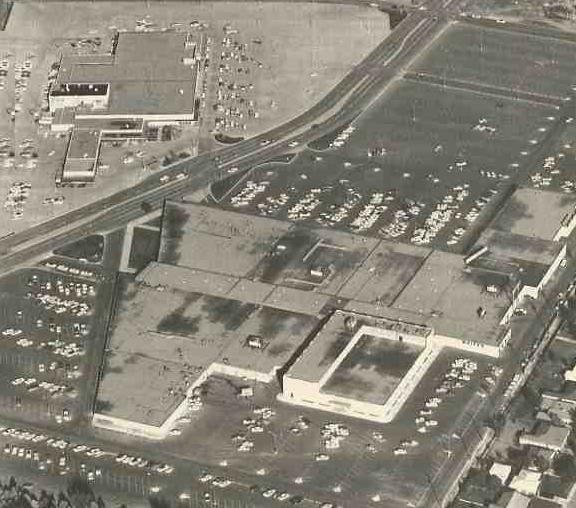 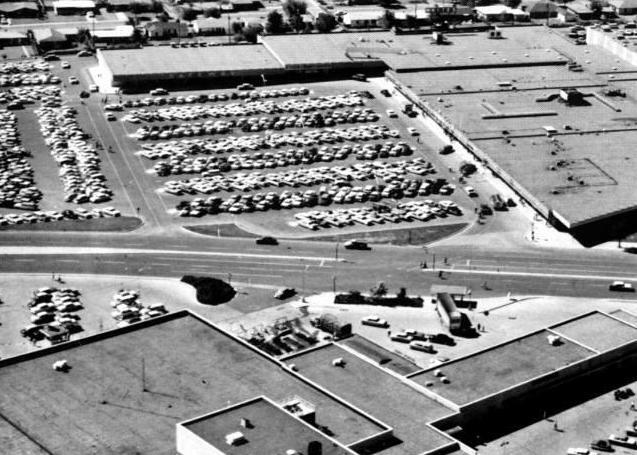 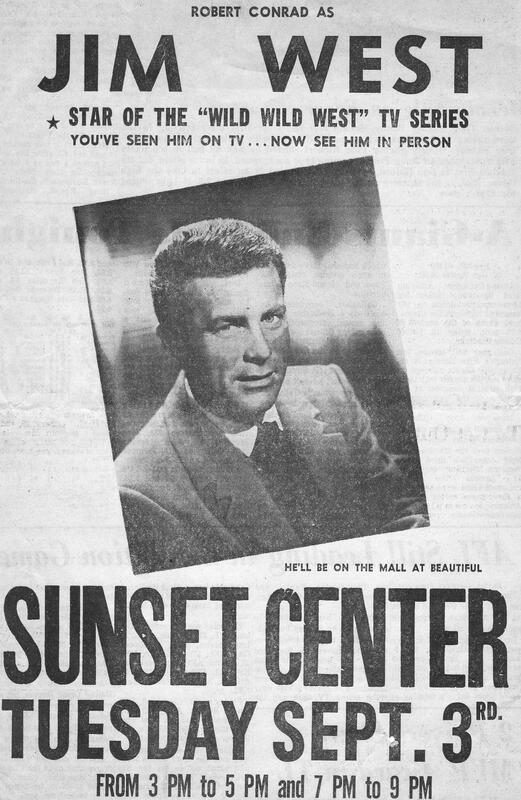 When Sunset Center Mall opened September 15, 1960 there was not a parking space to be found. 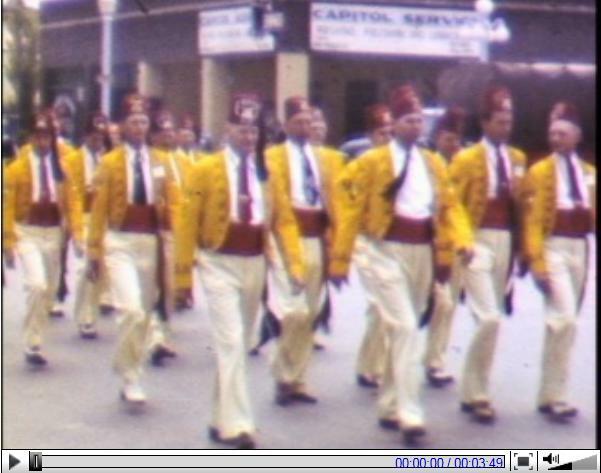 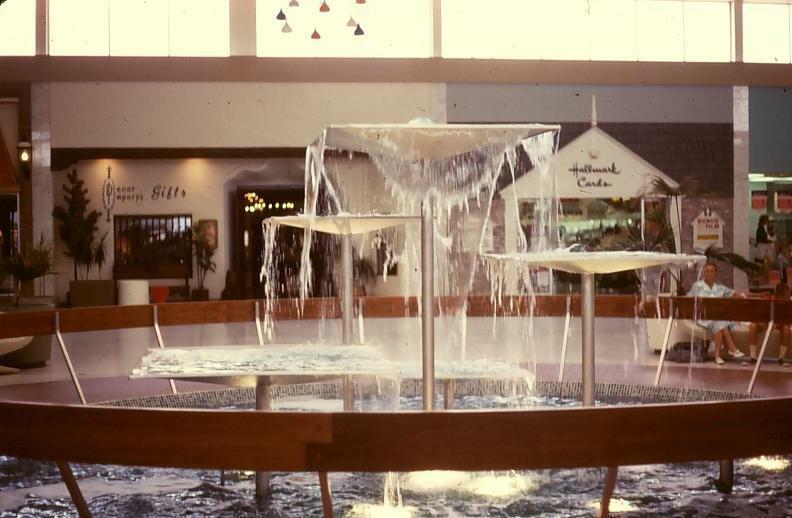 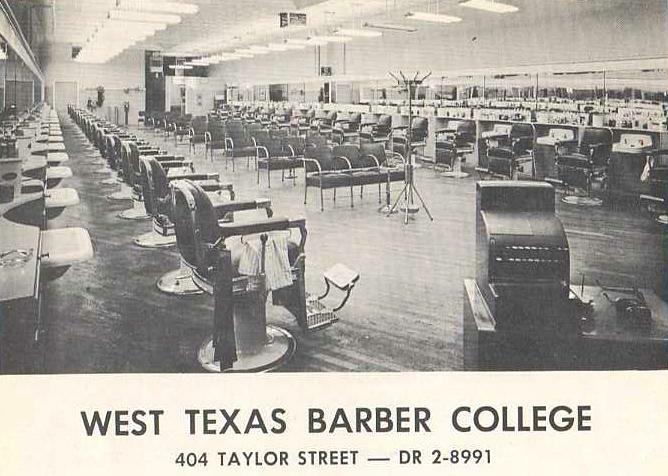 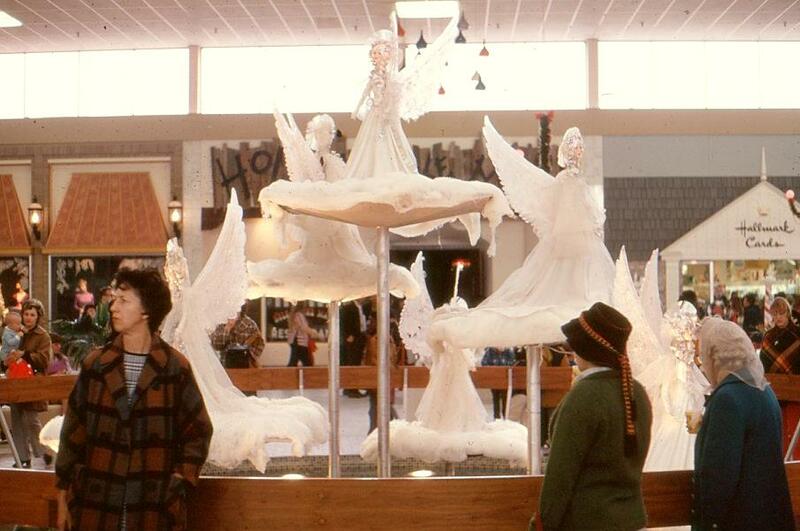 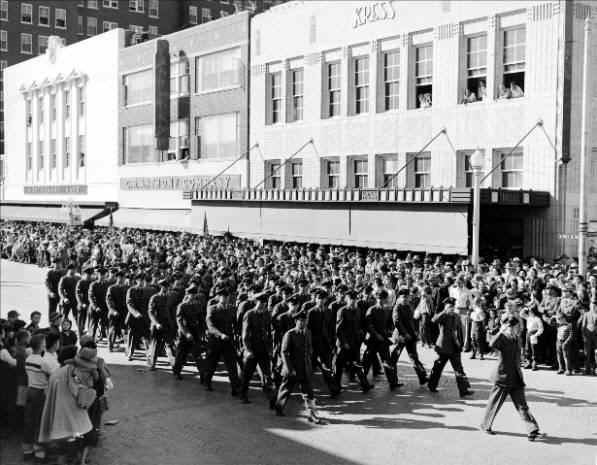 It was one of the first malls in Texas. 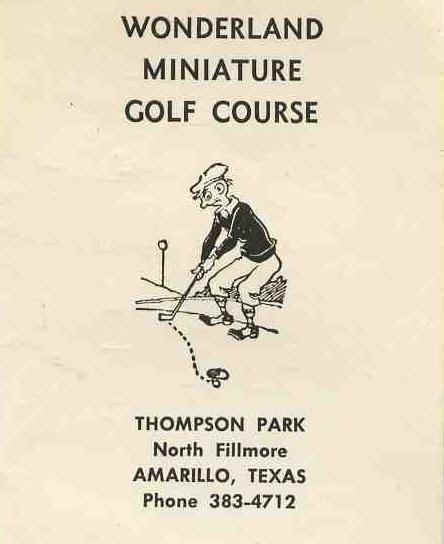 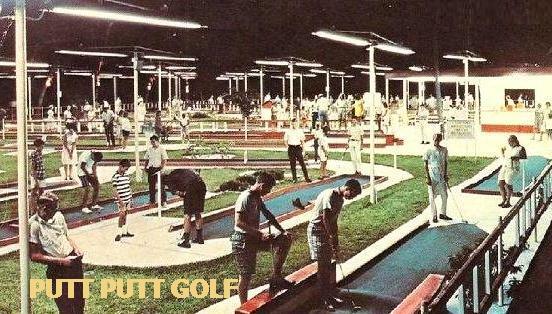 The site on which the mall was built was originally the 9 hole Sunset Golf Course. 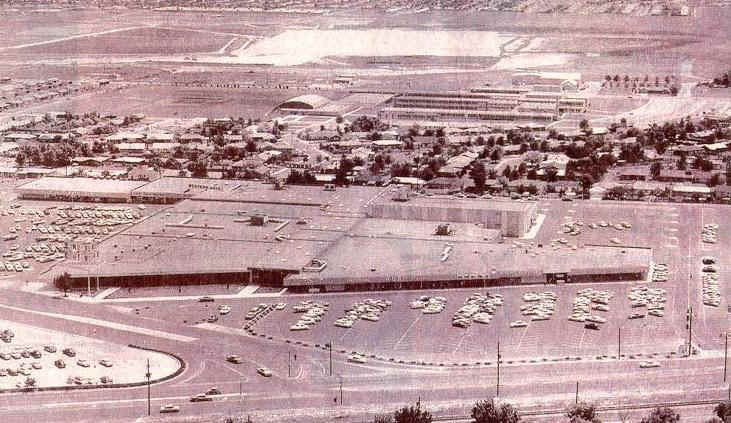 That's Tascosa High School is just beyond the residential area and beyond that is Duniven Lake where Western Plaza would rise in 1967. 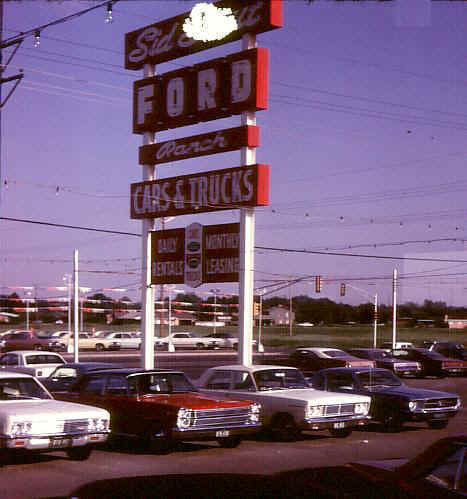 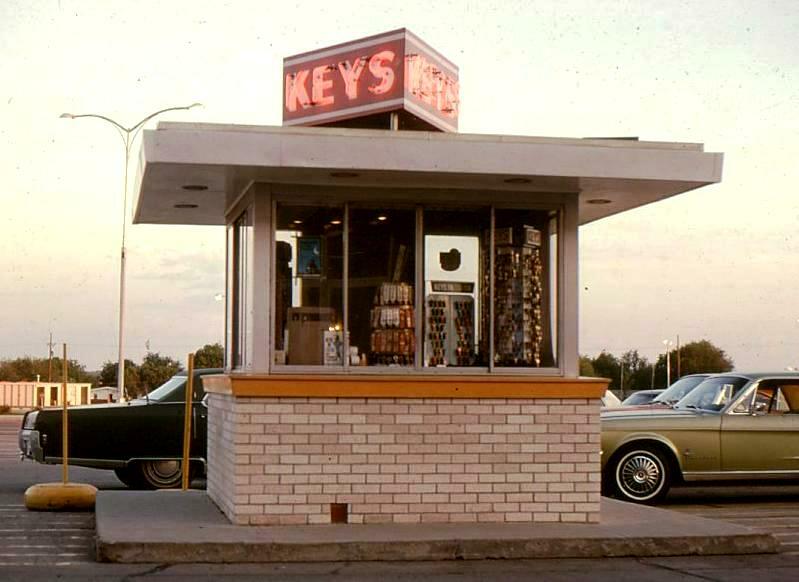 The Sears Key Shop was on the parking lot just outside the store. 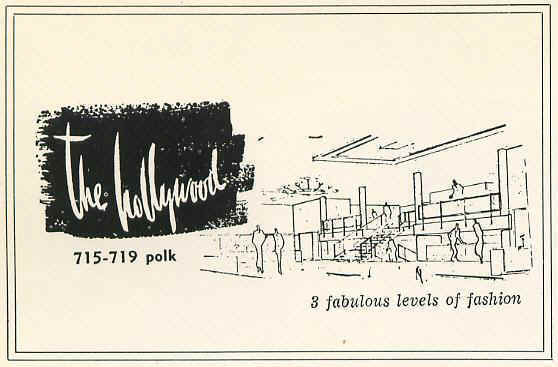 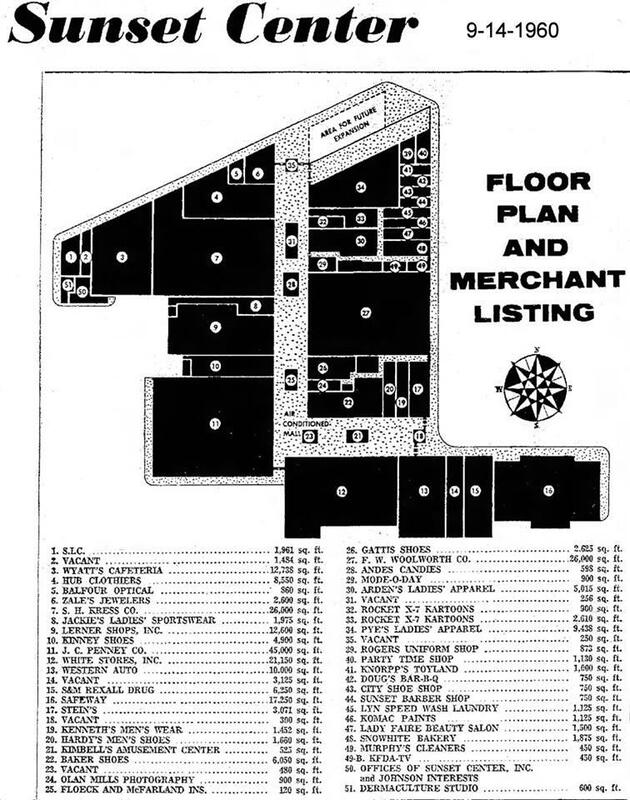 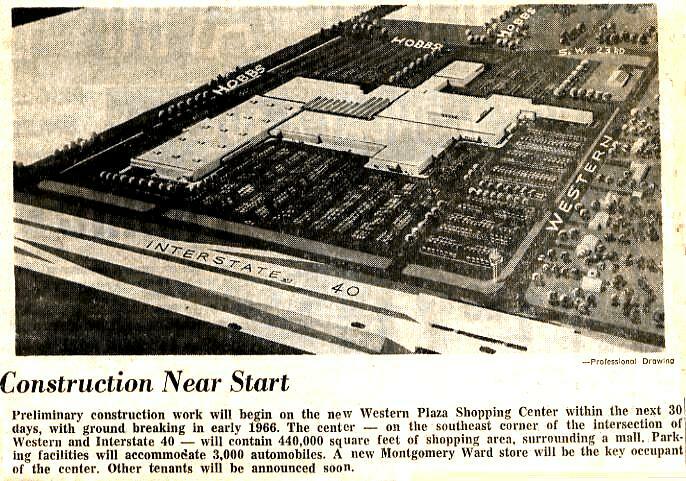 Western Plaza Mall was announced in 1966. 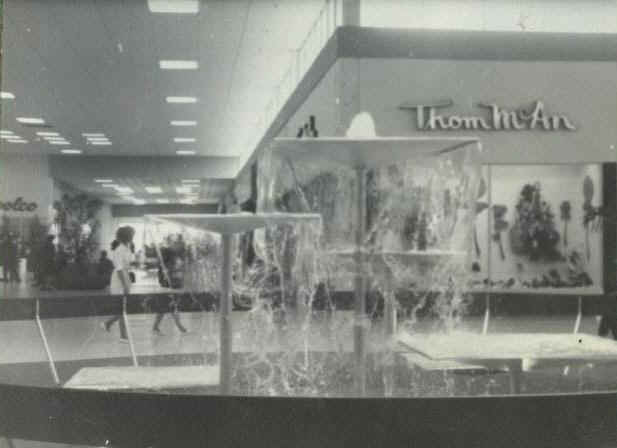 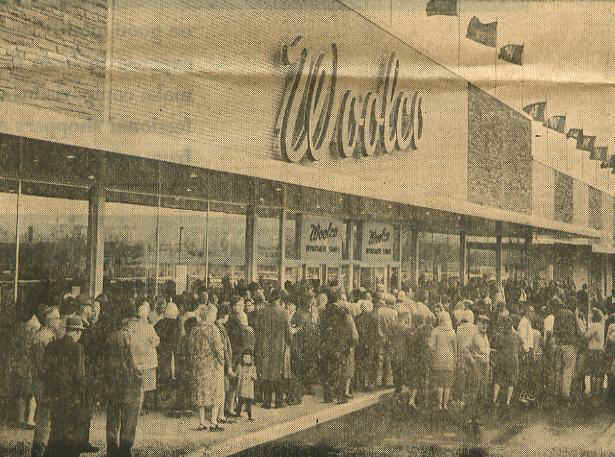 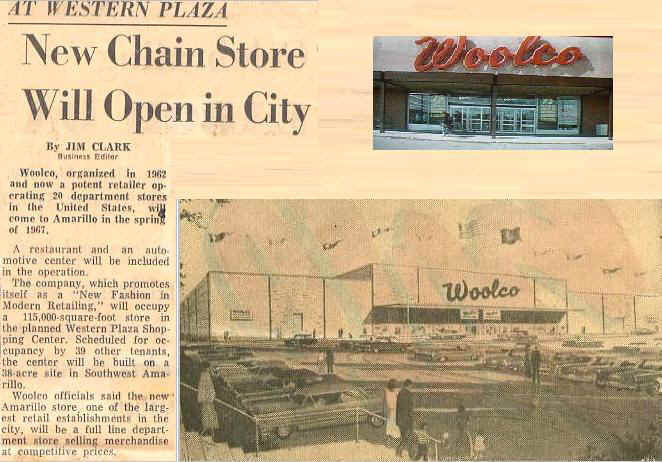 HASTINGS very first store was located in Western Plaza. 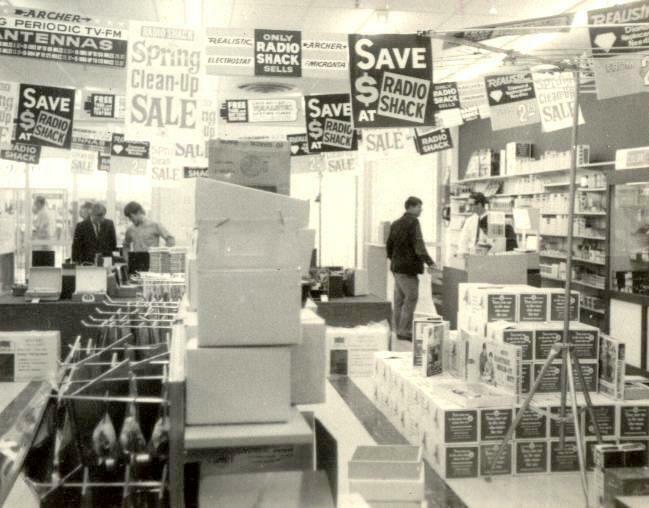 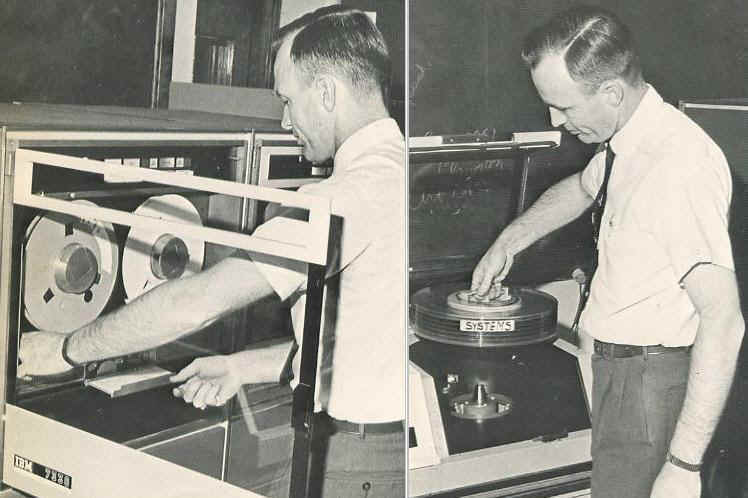 Bob Rankin, manager of the Western Plaza Radio Shack demonstrates a stereo system. 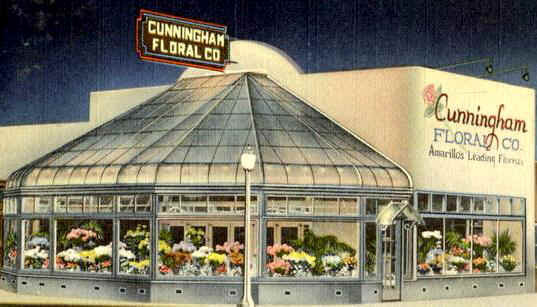 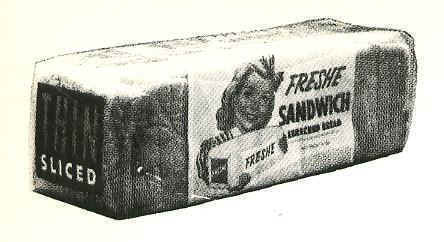 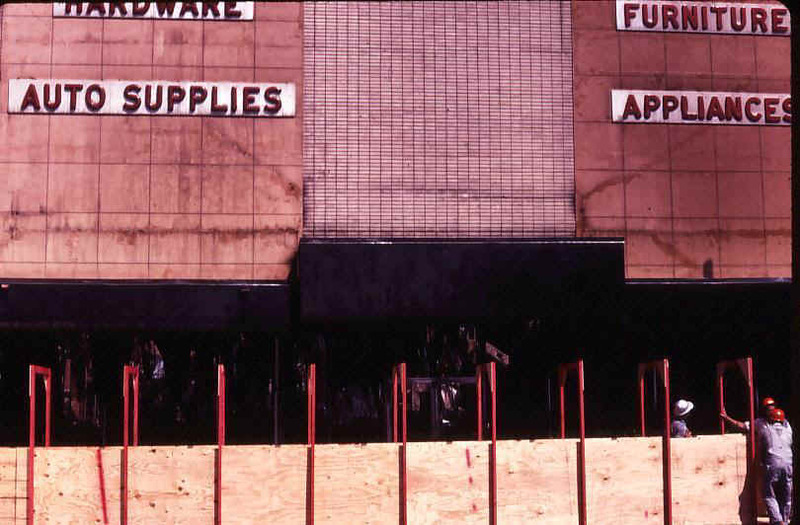 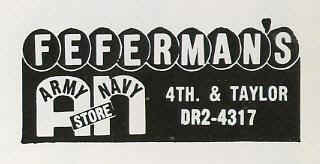 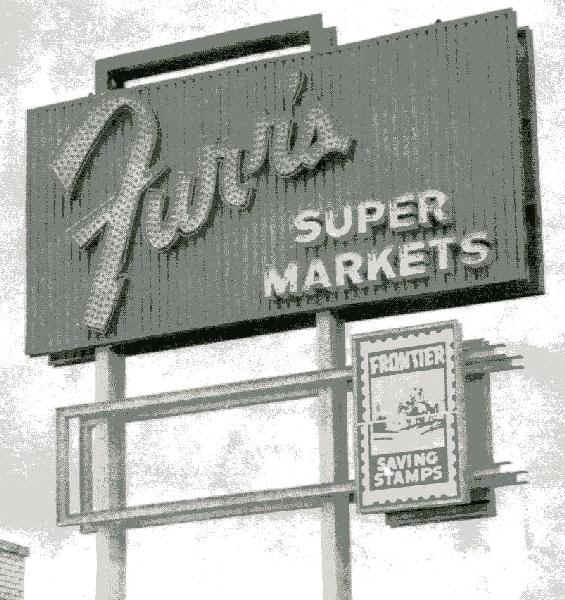 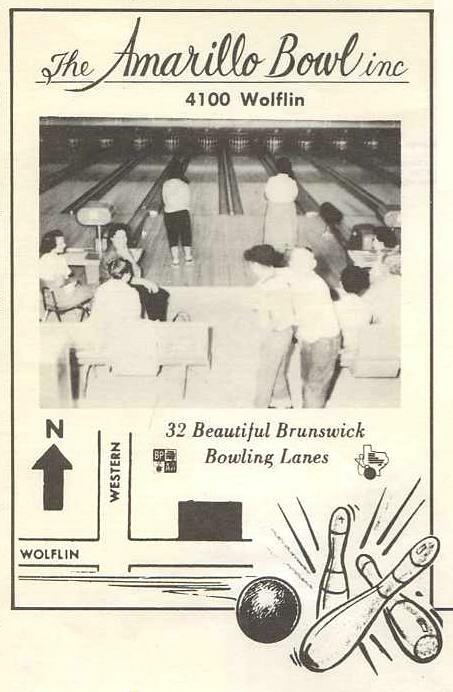 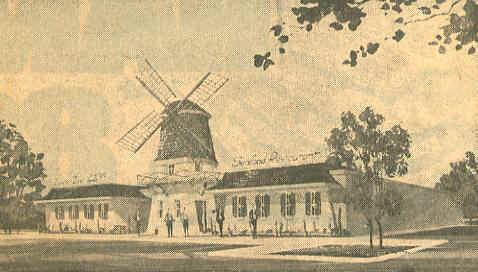 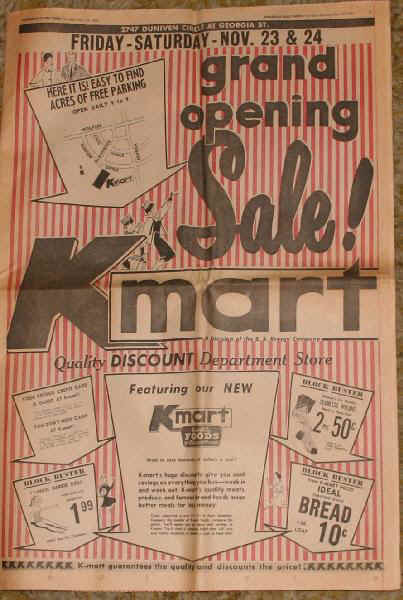 The Mall originally included a Furr's Supermarket outside on the south end. 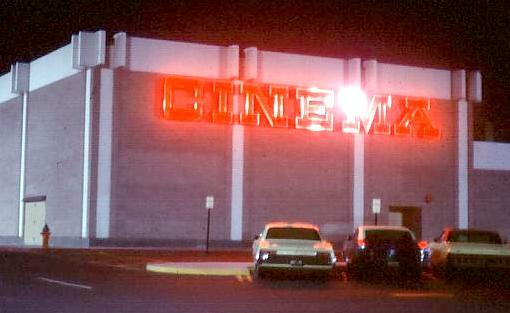 General Cinema opened a 1000 seat theater in Western Plaza. 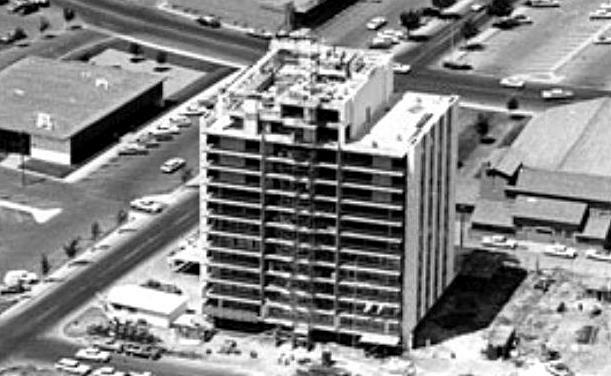 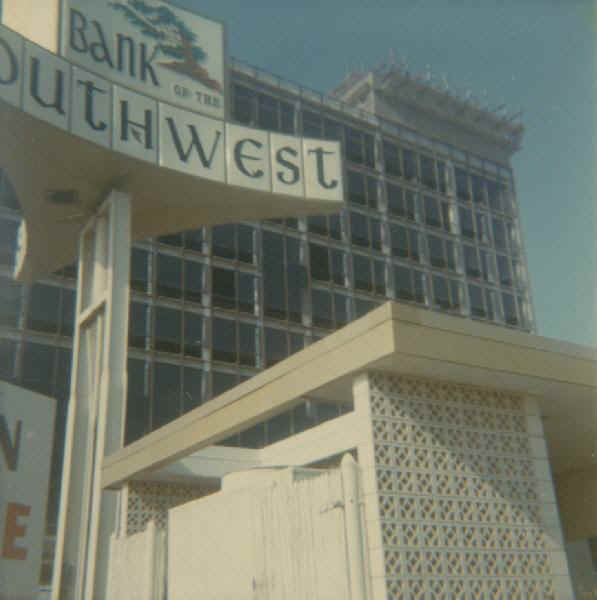 Bank of the Southwest Tower construction 1966 (Wolflin Village). 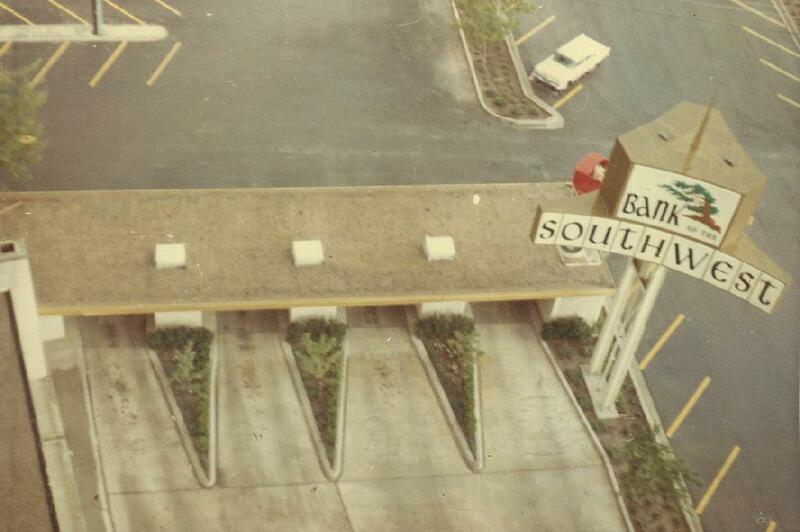 View from the Gold Tree Restaurant on the top floor of Bank Of The Southwest. 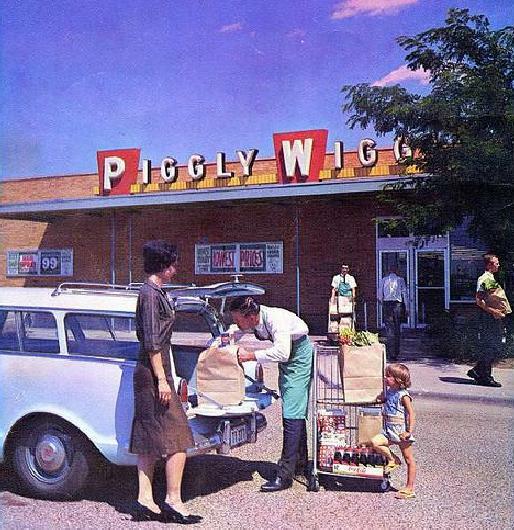 This Piggly Wiggly was on Amarillo Blvd. 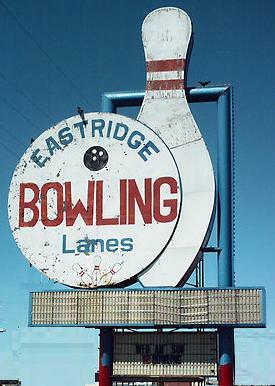 E. just east of Grand. 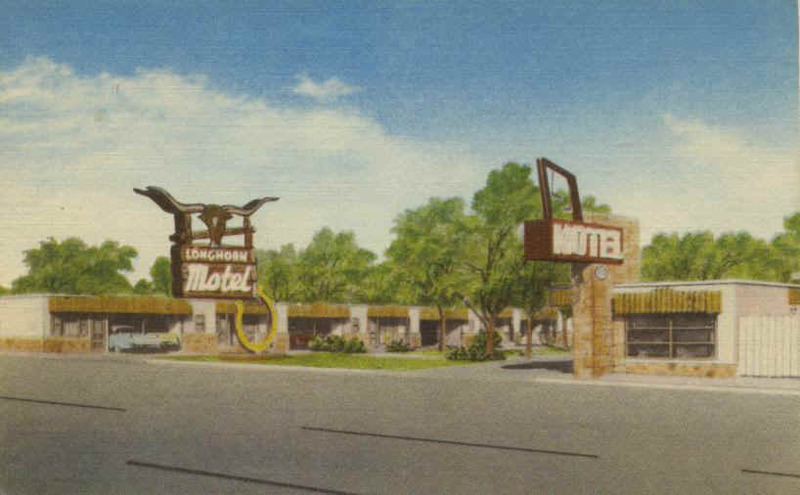 The Downtown Travel Lodge opened in 1965. 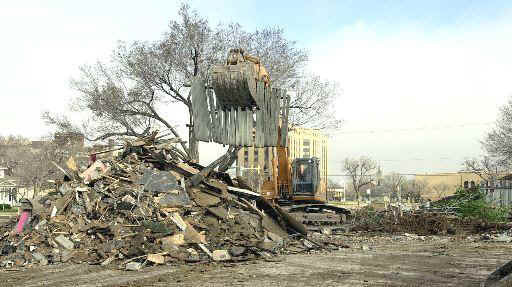 It was demolished in 2019 to make way for another ugly parking lot. 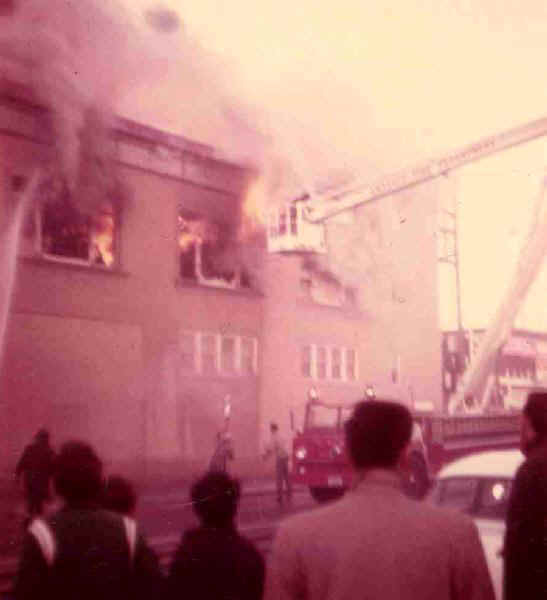 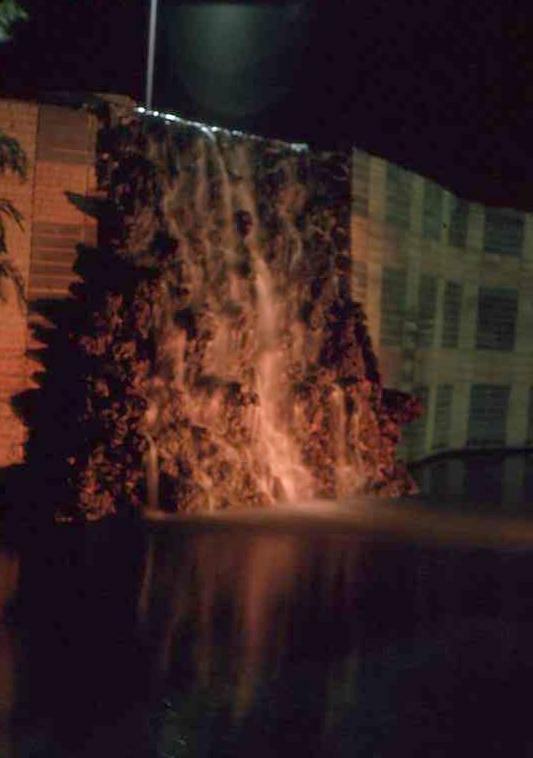 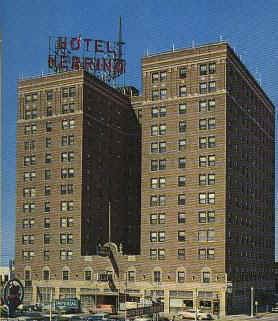 The Fountain Inn was Downtown at 7th and Fillmore Streets. 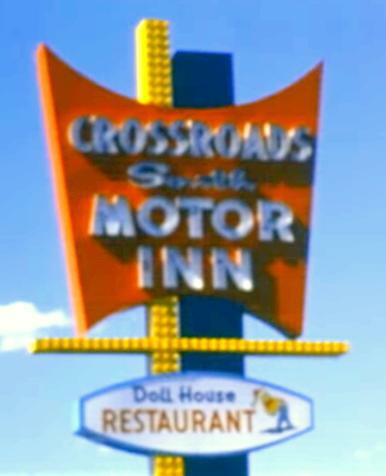 The CROSSROADS Motel was Downtown between 5th & 6th on Fillmore Street. 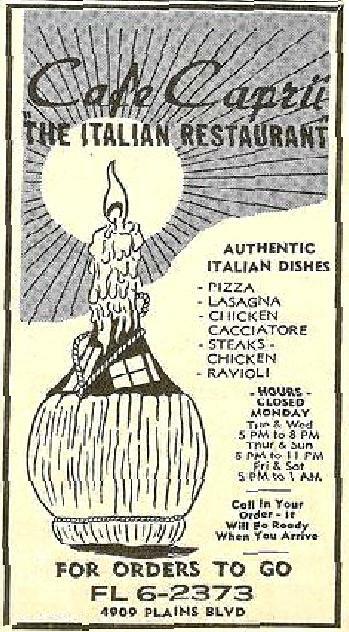 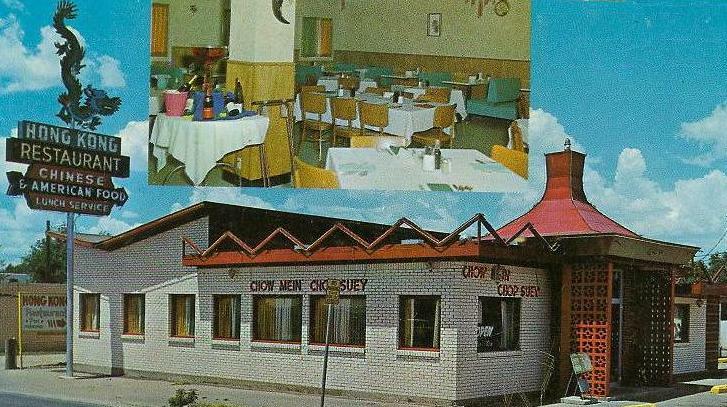 The 24 hour restaurant was a very popular eatery. 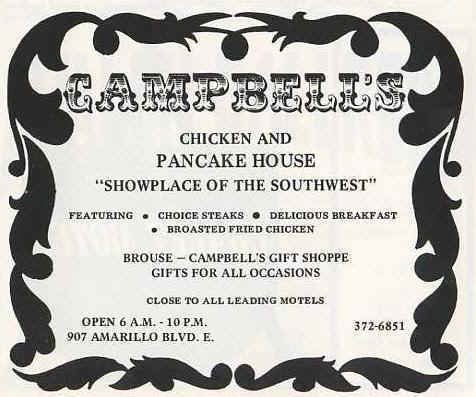 just about the best chicken fried steak on the planet. 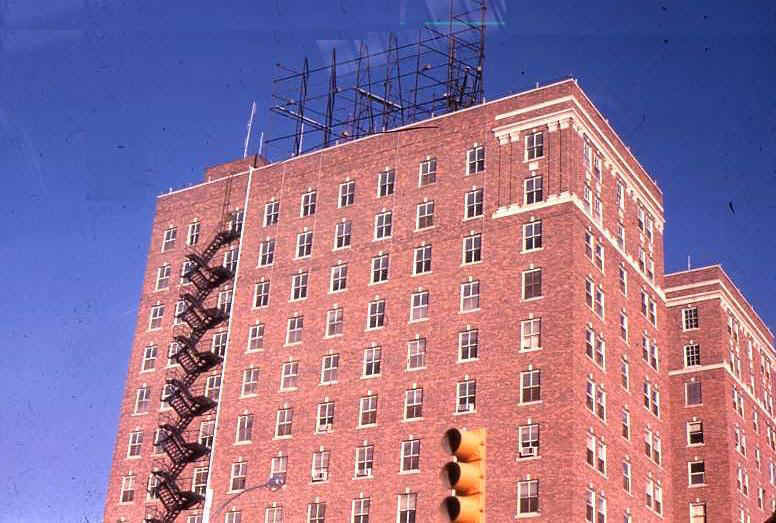 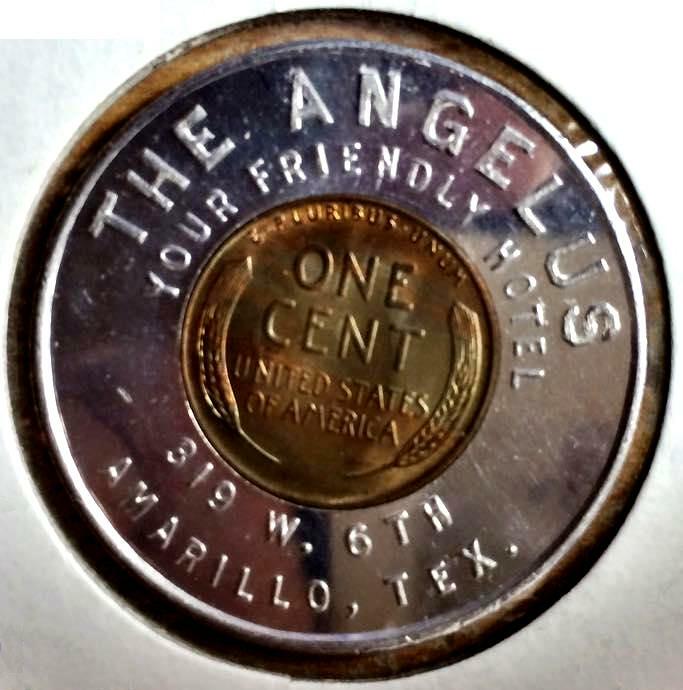 The Angelus Hotel Downtown at 319 W. 6th (Old Route 66) survived until the mid '60s. 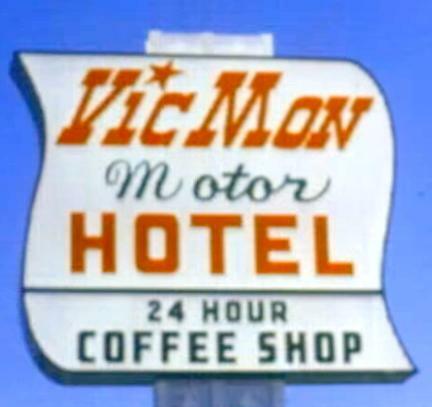 The Vic Mon Motor Hotel on Amarillo Blvd. 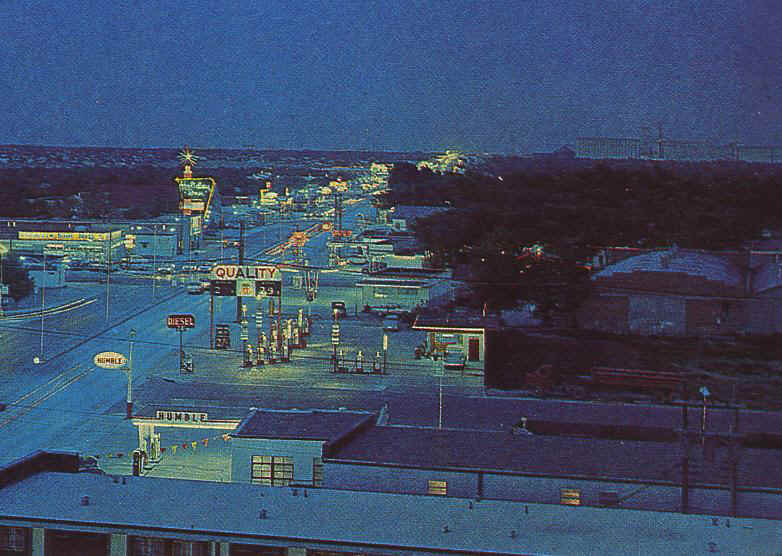 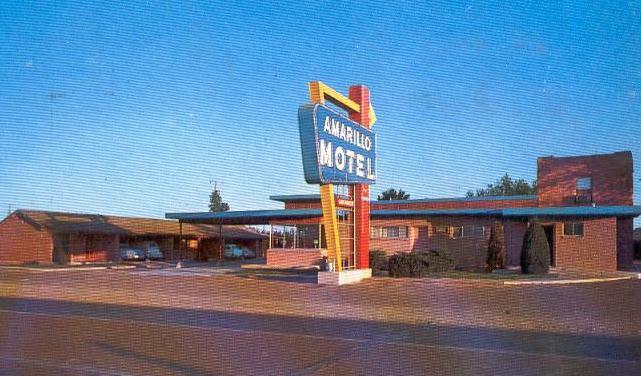 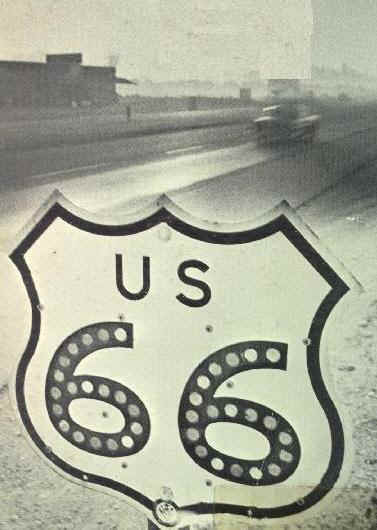 West later became the 3rd Holiday Inn on Amarillo's Route 66. 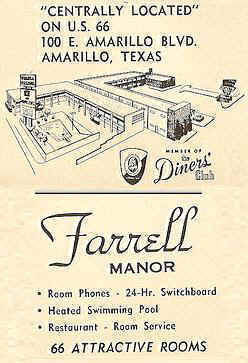 The Downtown Motel was on N. Fillmore St. near Amarillo Blvd. 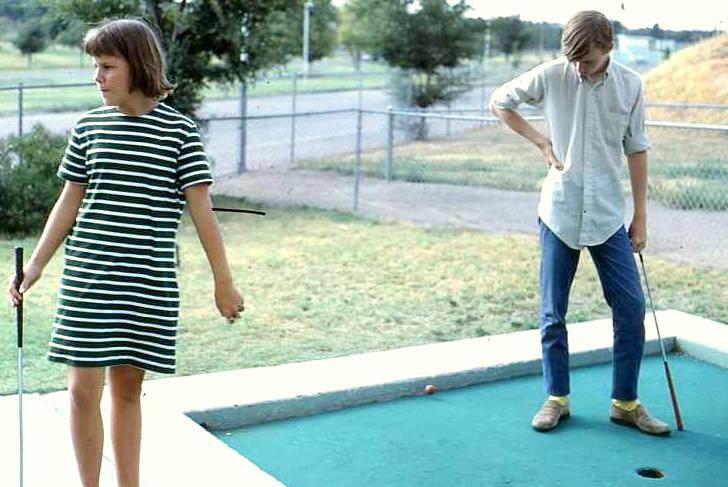 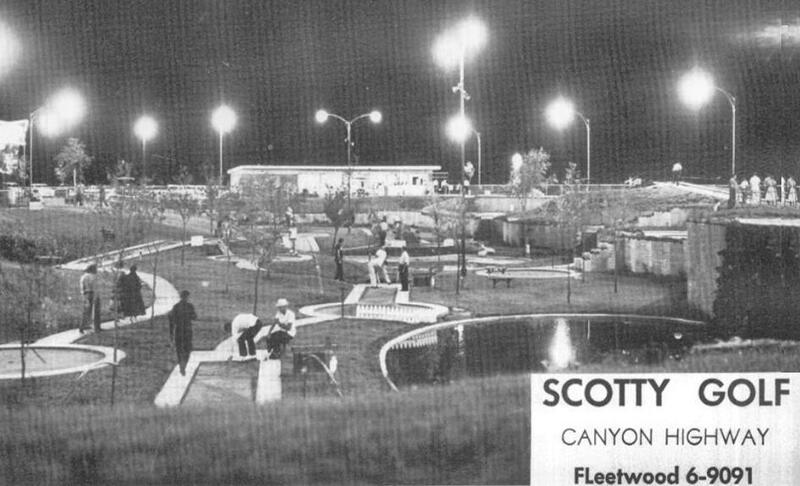 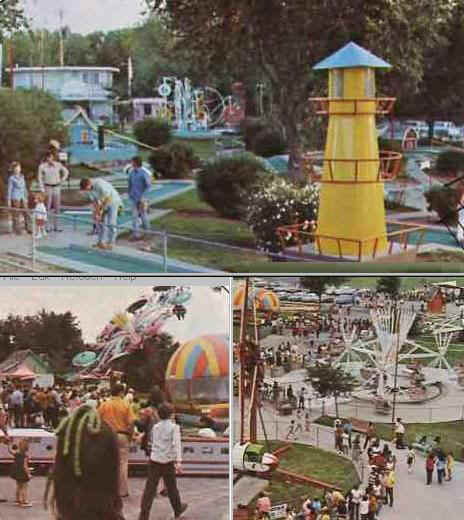 This popular PUTT PUTT course was on SW 33rd just off Western St.
Wonderland's miniature golf course opened in the early '60s and is still in operation today. 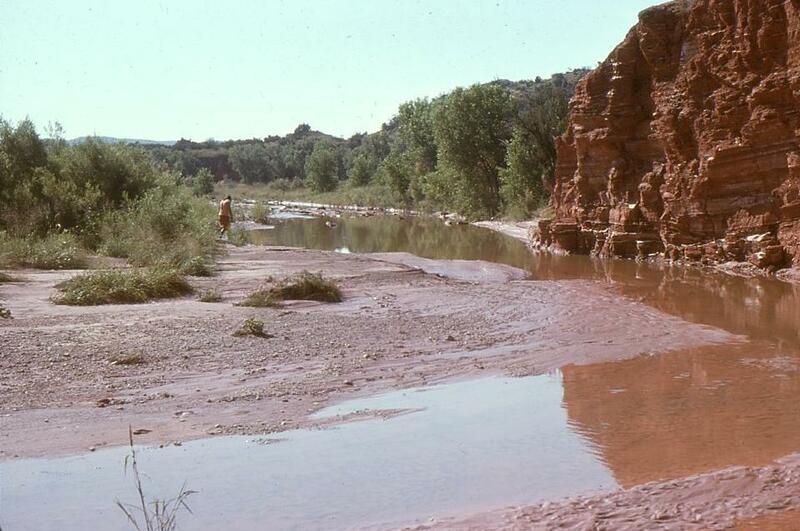 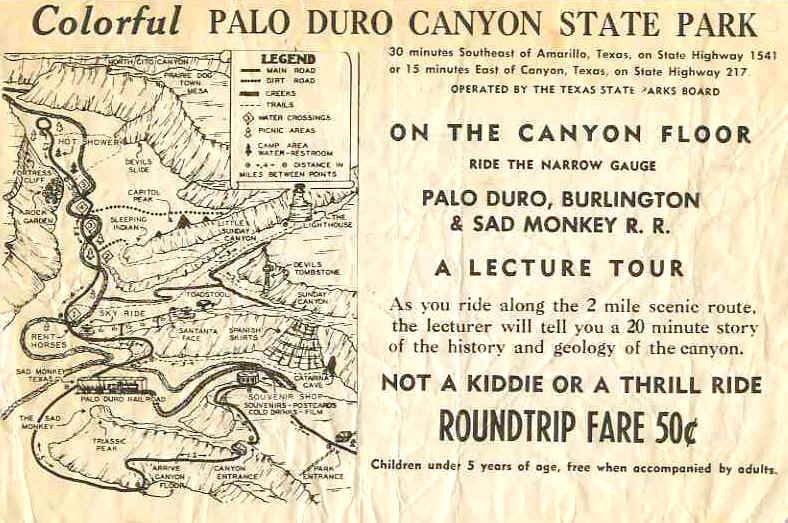 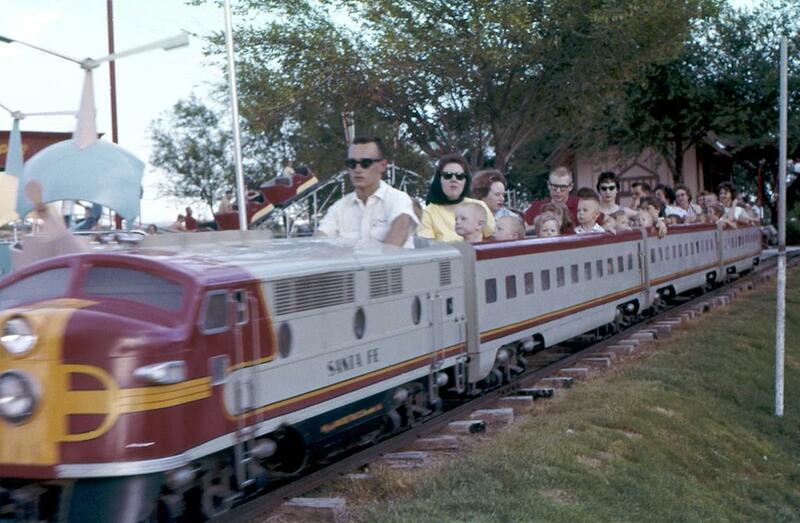 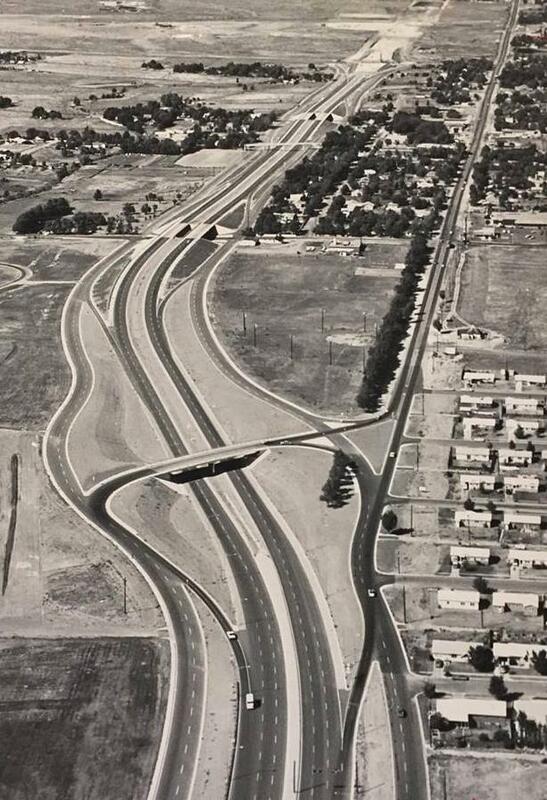 Canyon E-way to downtown 1962. 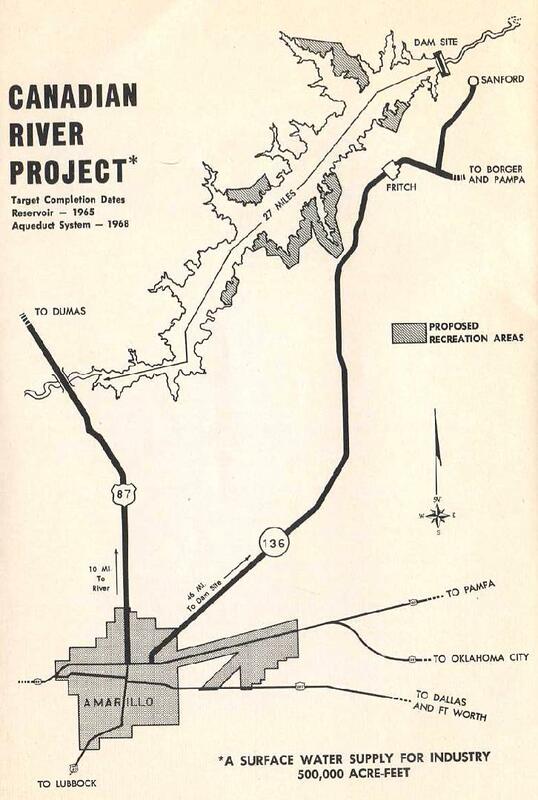 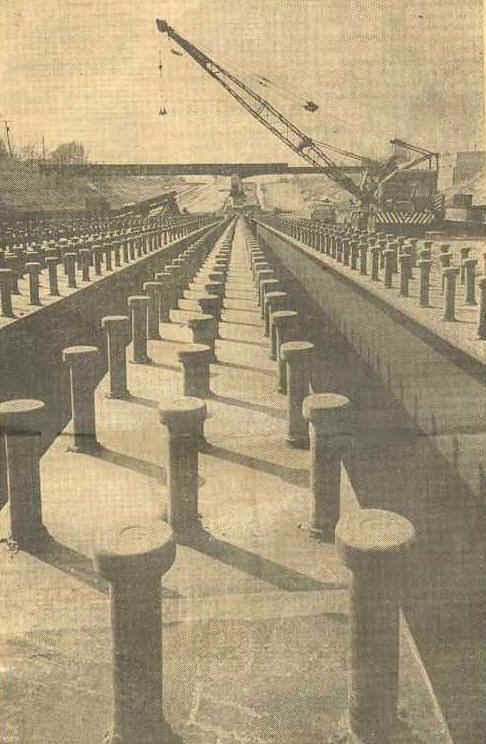 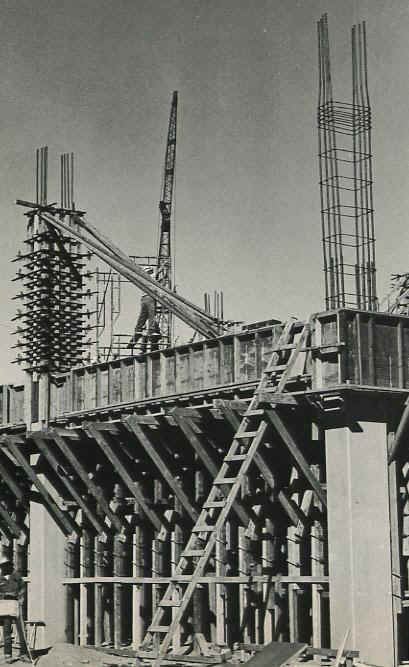 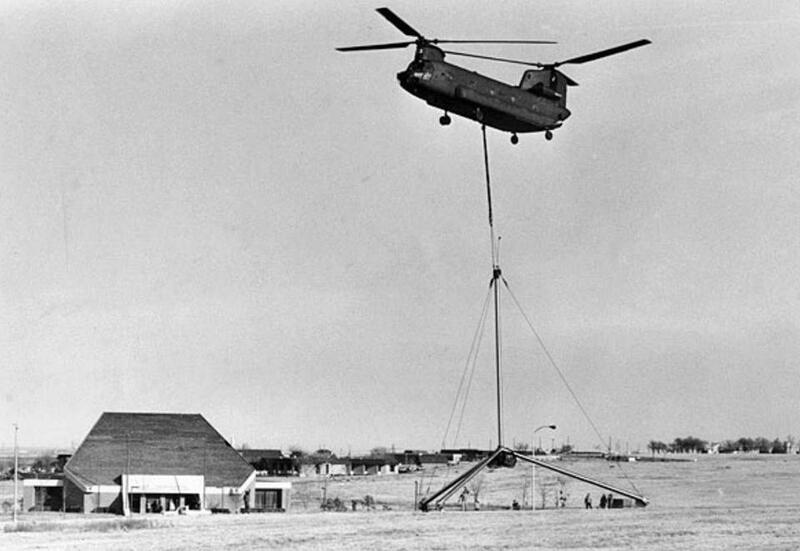 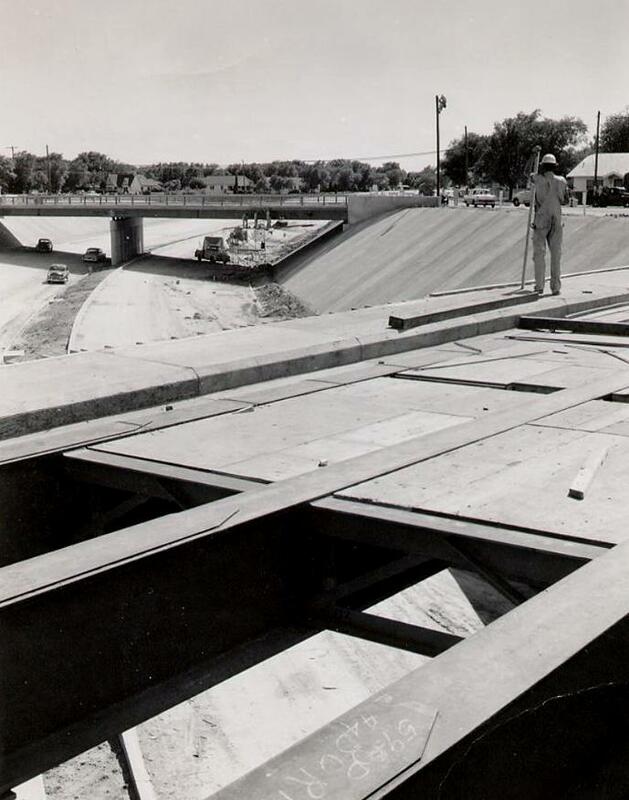 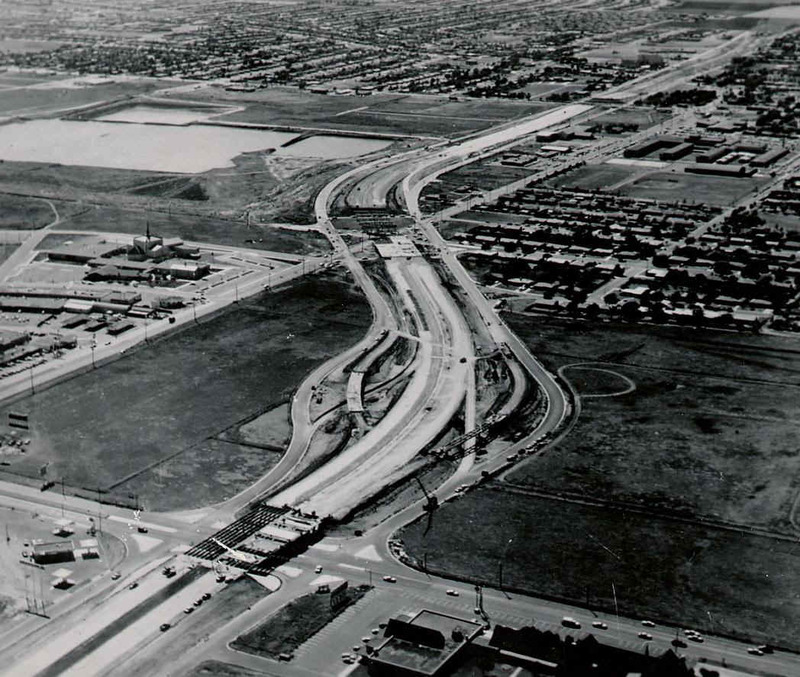 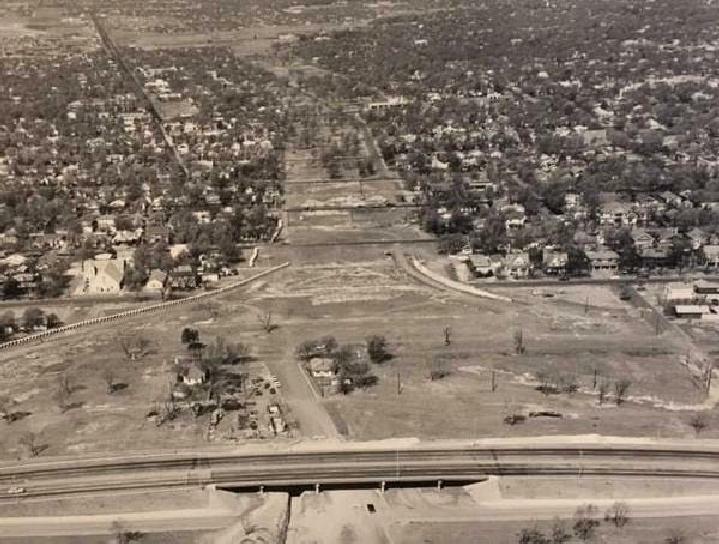 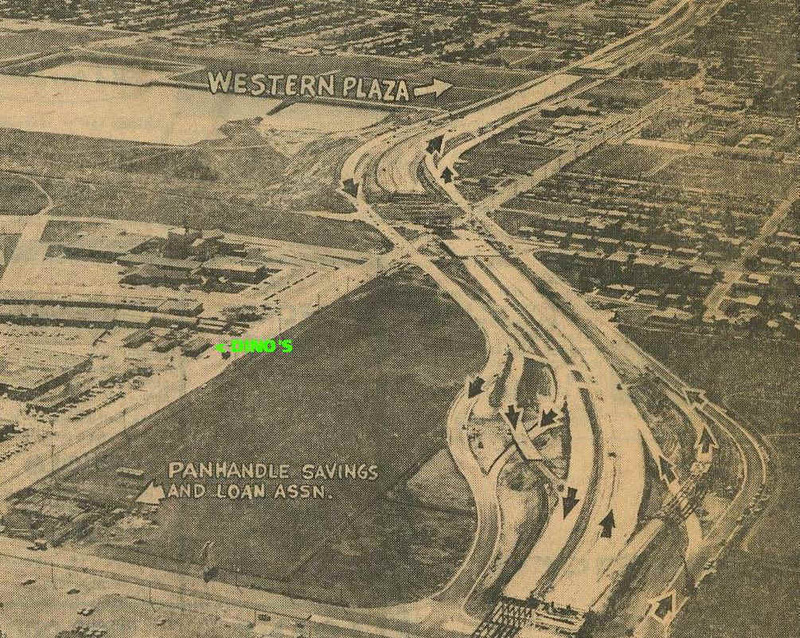 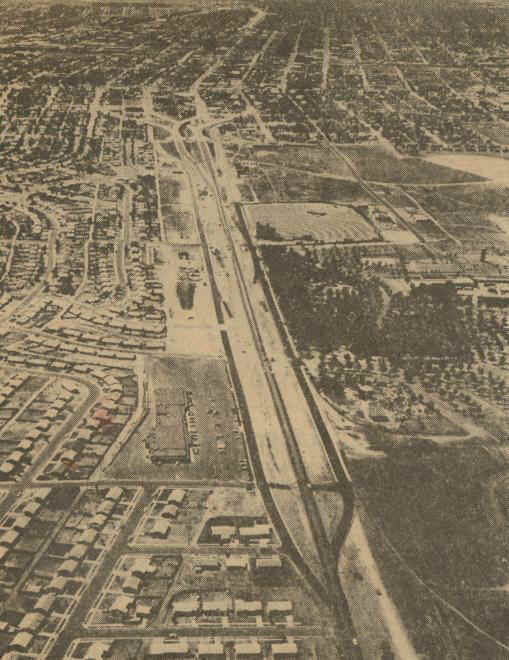 ABOVE: Dumas E-way construction 1962. 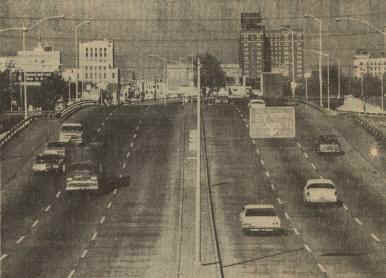 I-40 construction west of Georgia St. 1967. 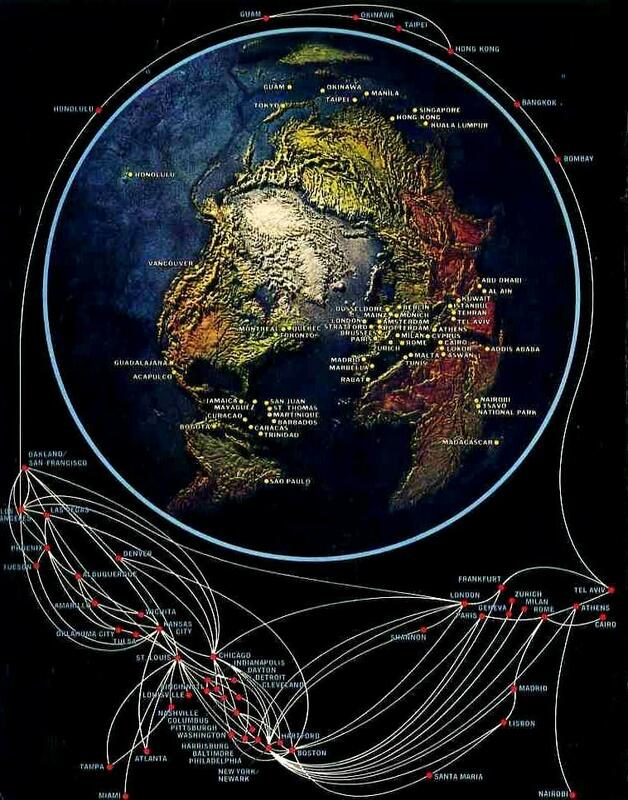 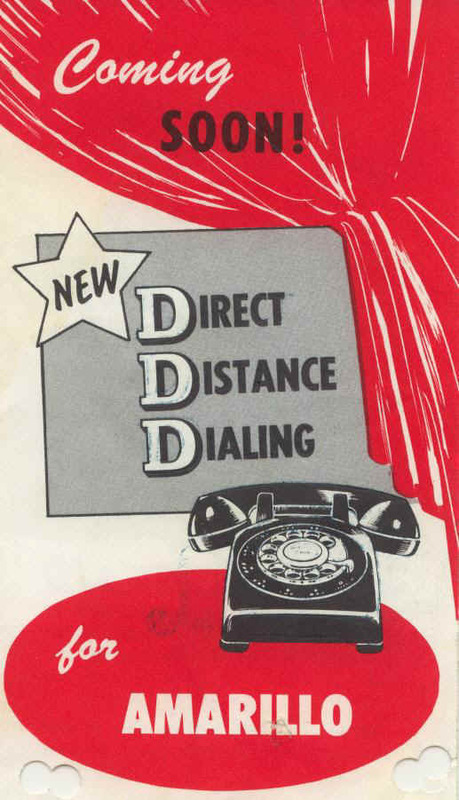 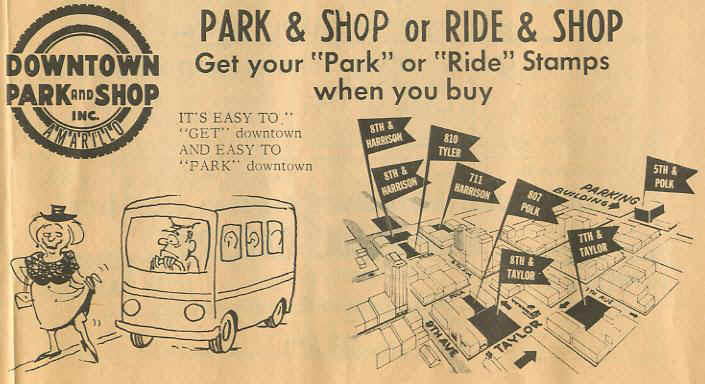 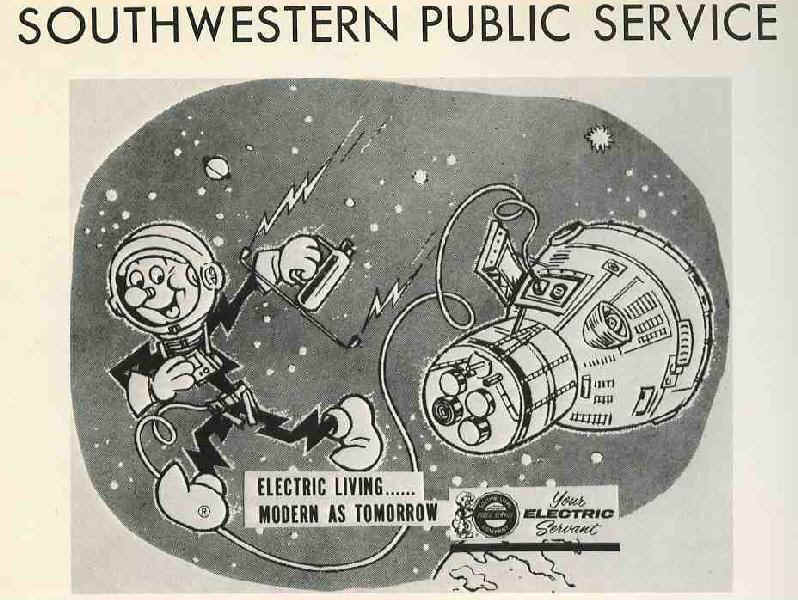 E-way downtown dispersal system 1963. 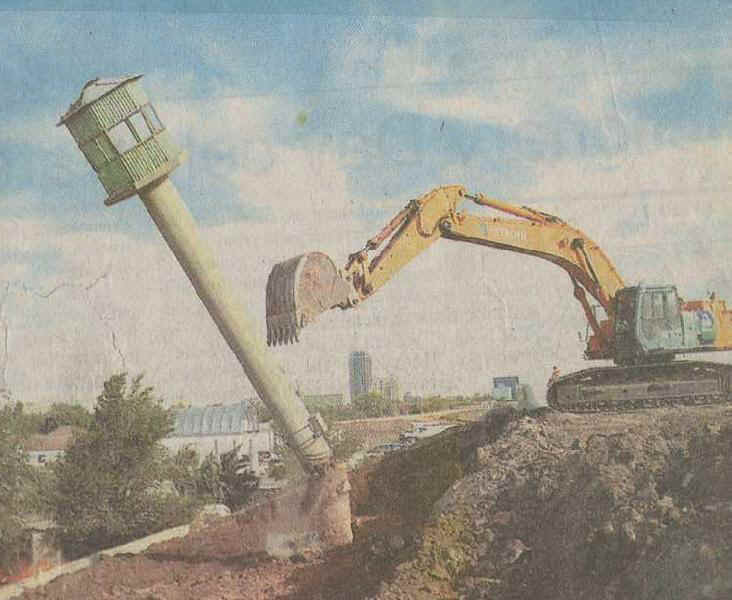 Remember that green tower at the I-40 / Canyon E-way Interchange? 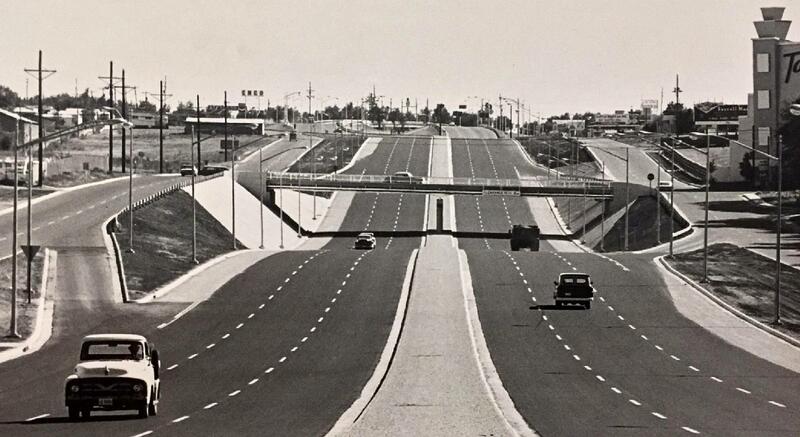 I-40 East opens from Canyon E-way 1966. 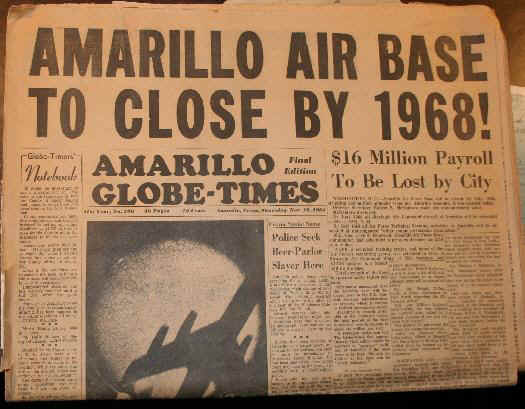 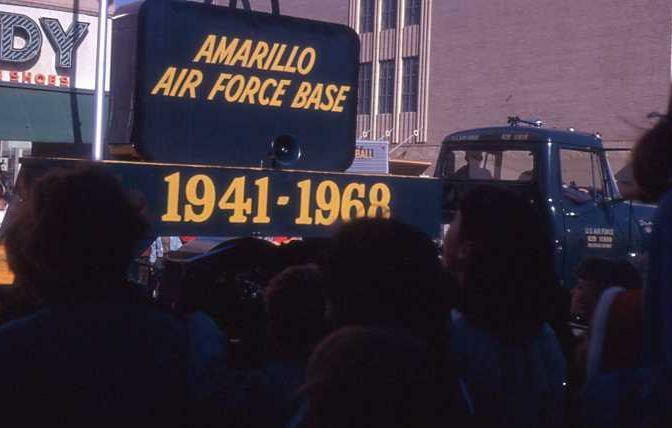 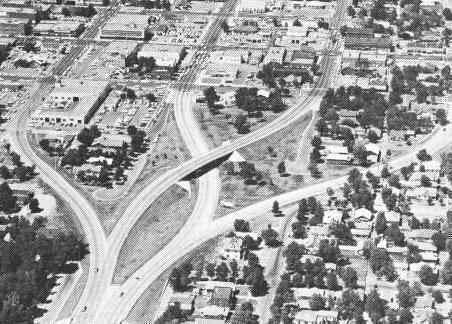 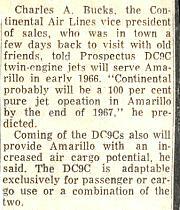 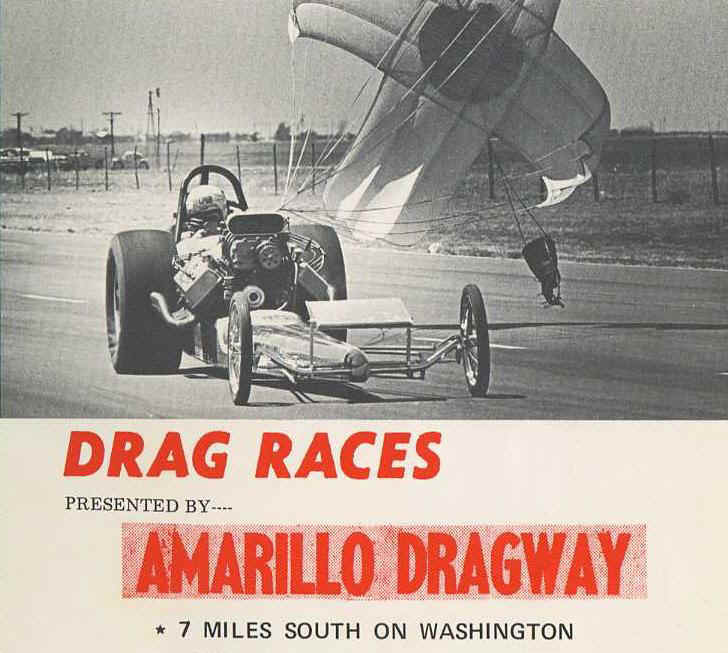 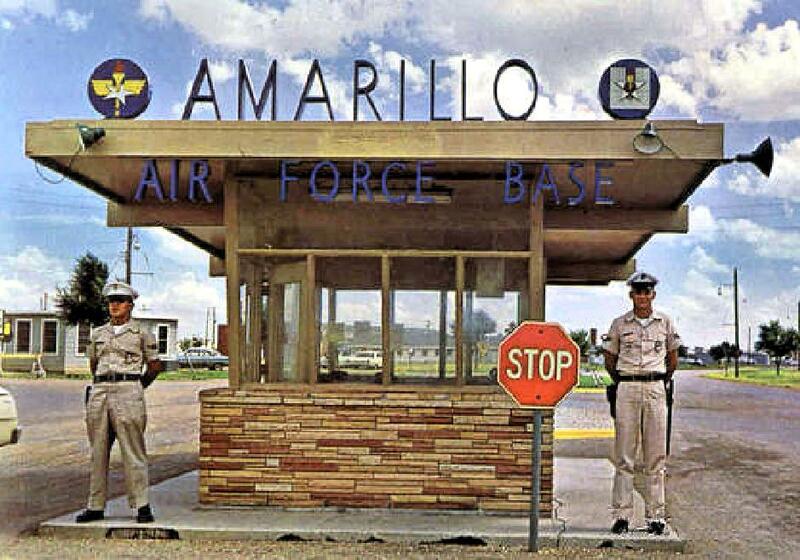 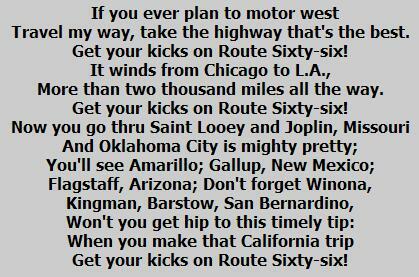 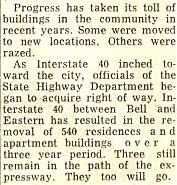 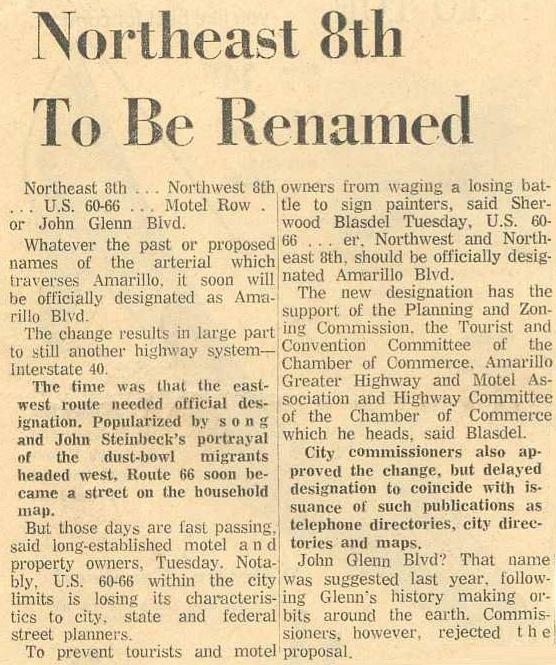 I-40 opened all the way across Amarillo November 15, 1968. 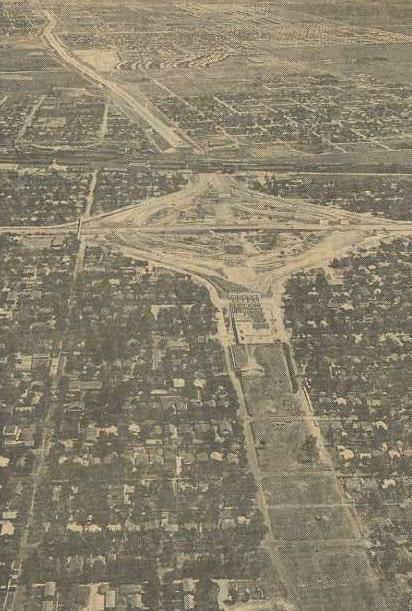 The open land beyond it was to be developed as a city zoological park. 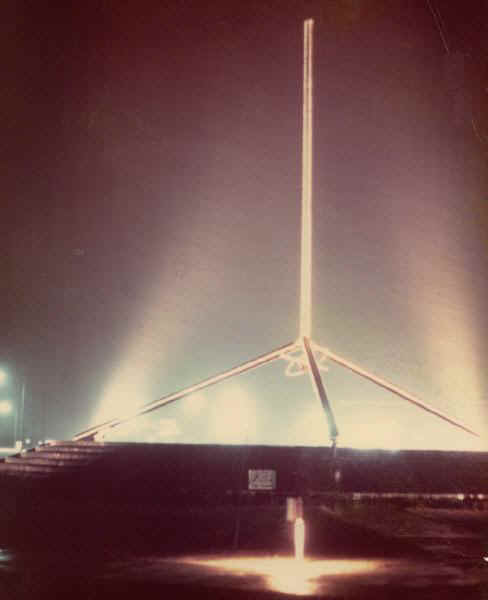 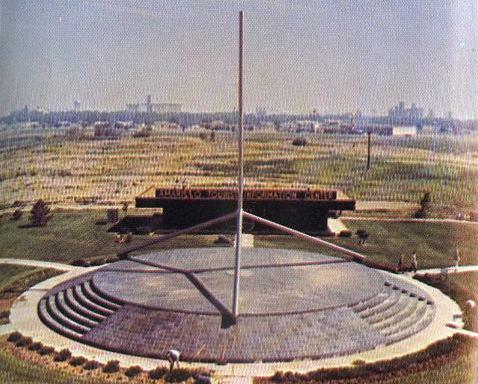 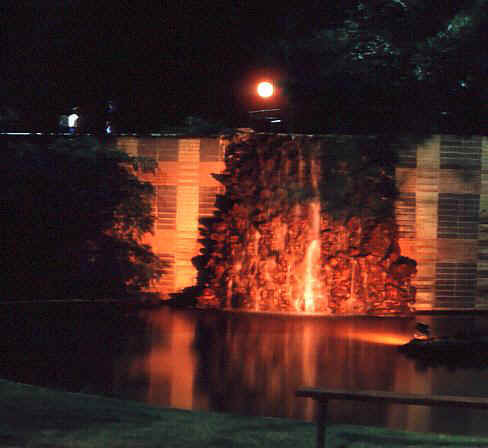 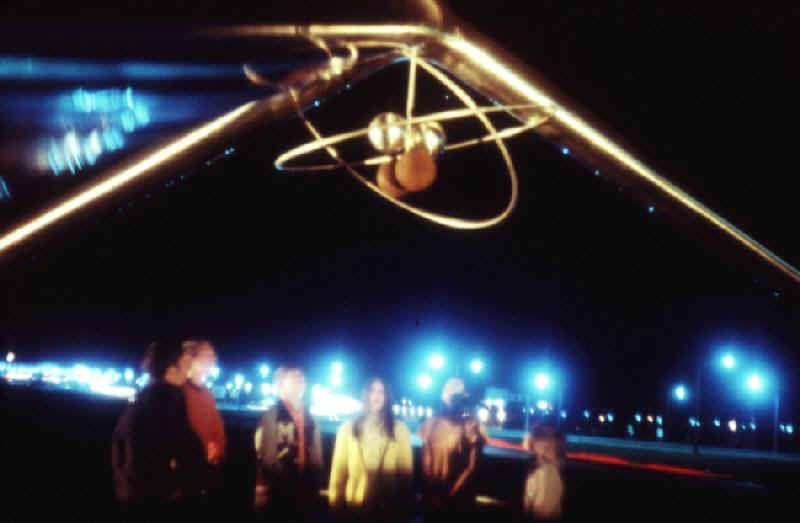 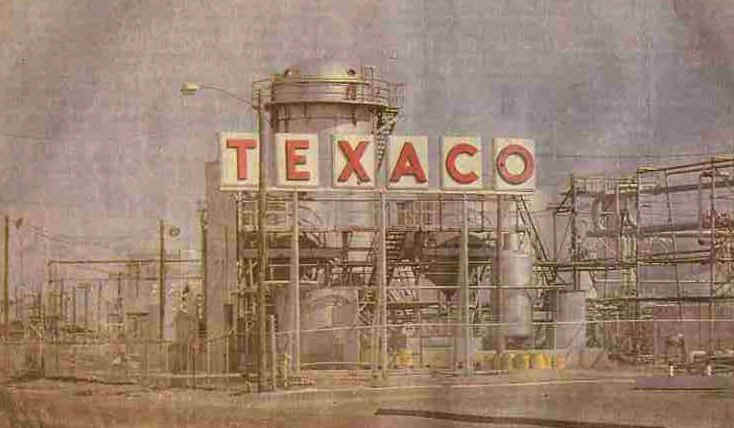 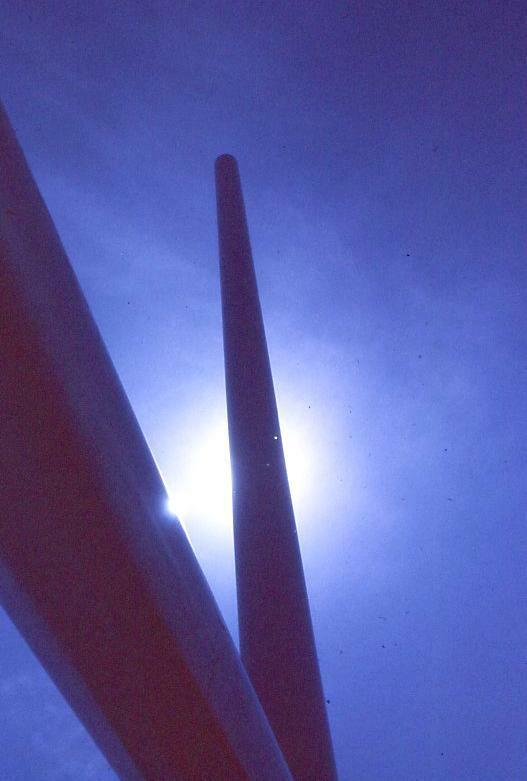 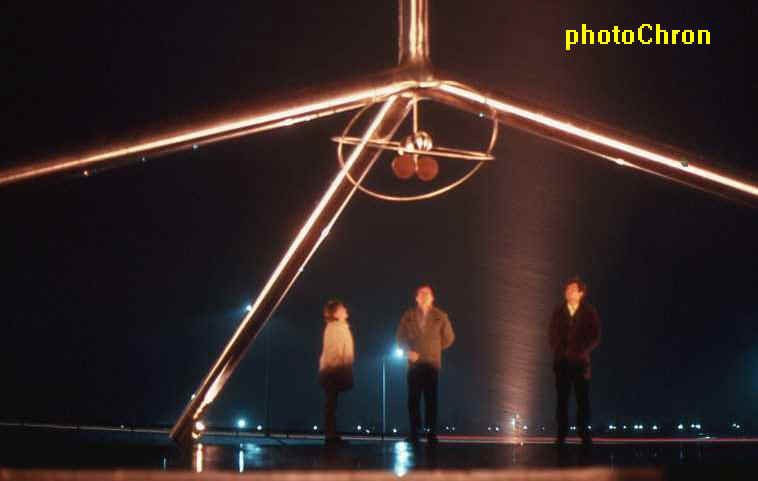 The HELIUM MONUMENT opened in 1968 at I-40 at Nelson St. 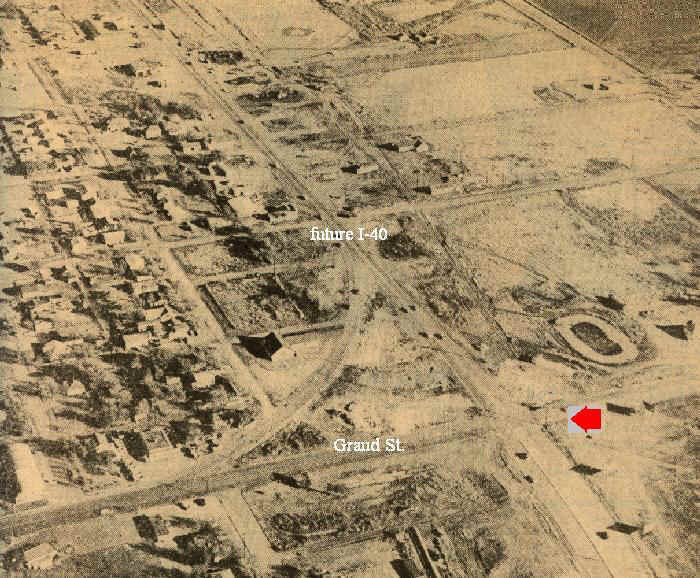 The American Quarter Horse Association headquarters building is now located on this site. 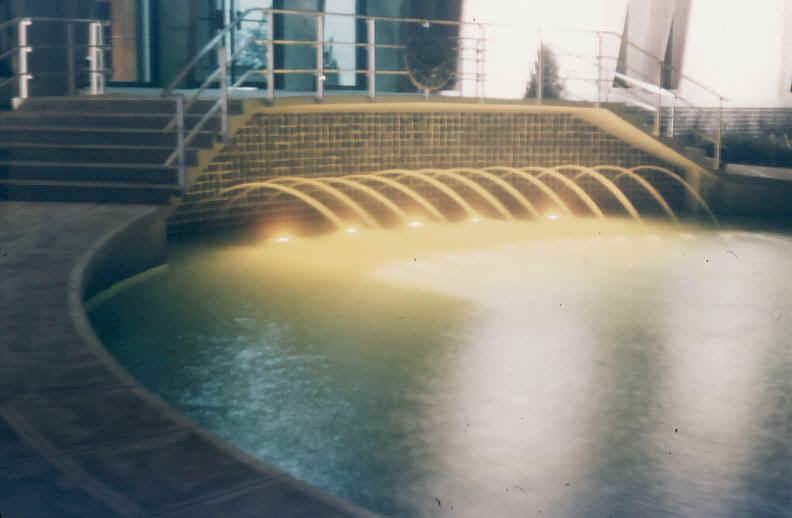 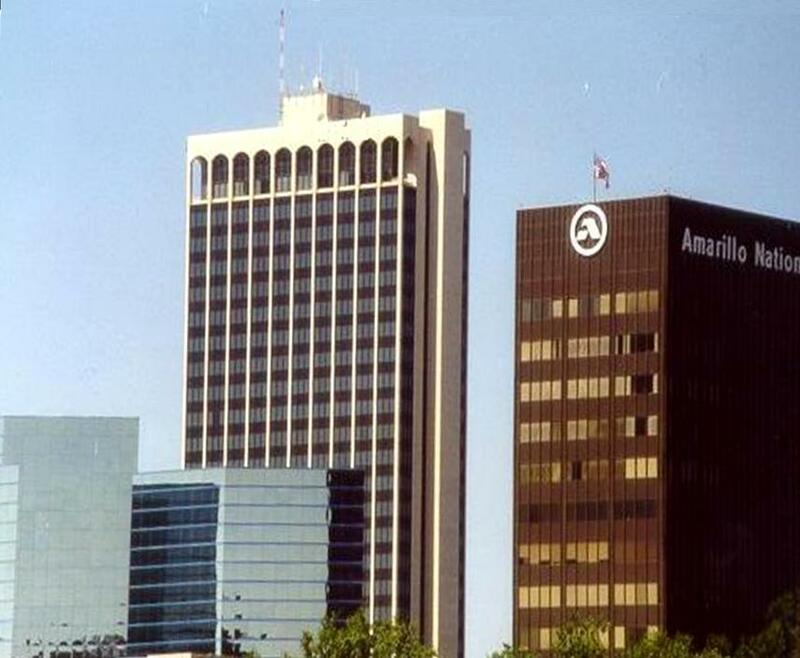 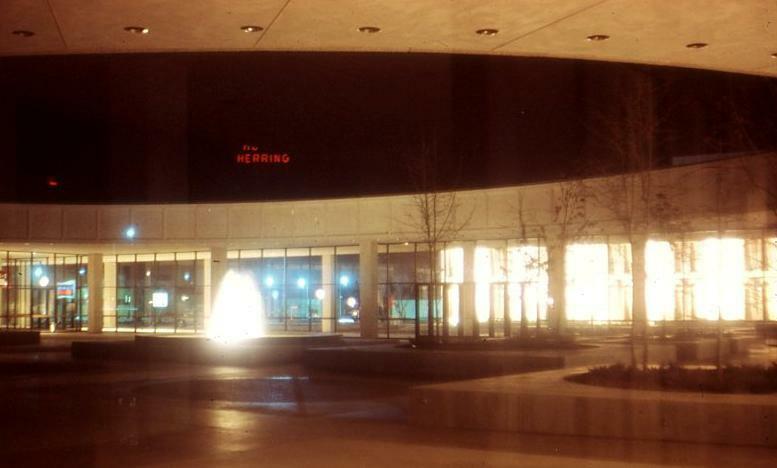 Amarillo Regional Medical Center on December 16, 1982. 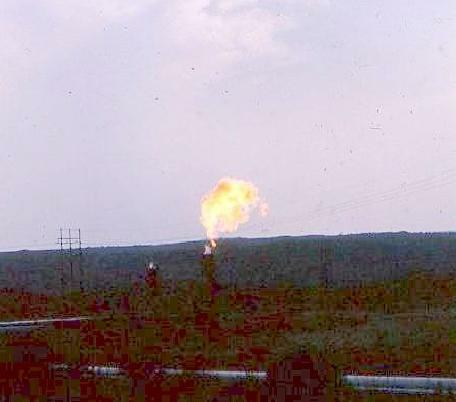 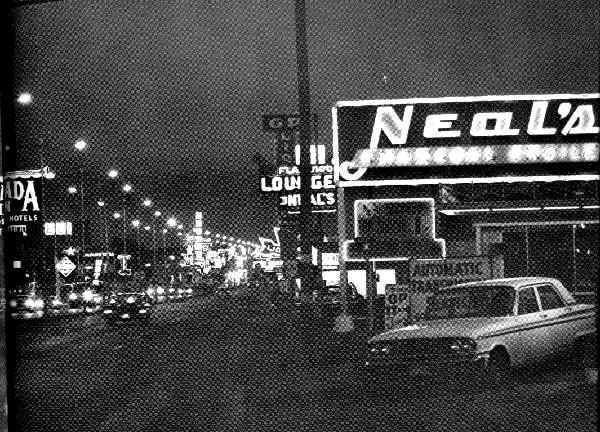 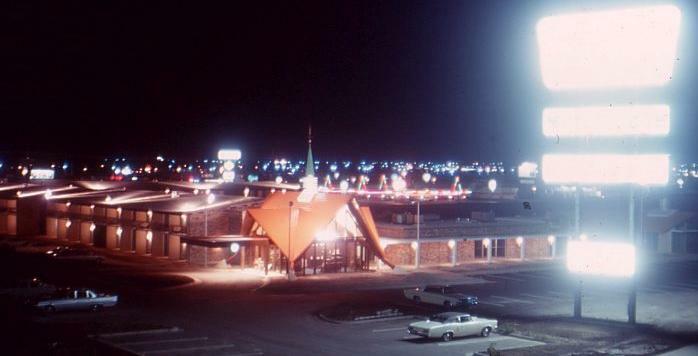 The flare along E. 3rd Ave.
Denny's operated Restaurants on Amarillo Blvd. 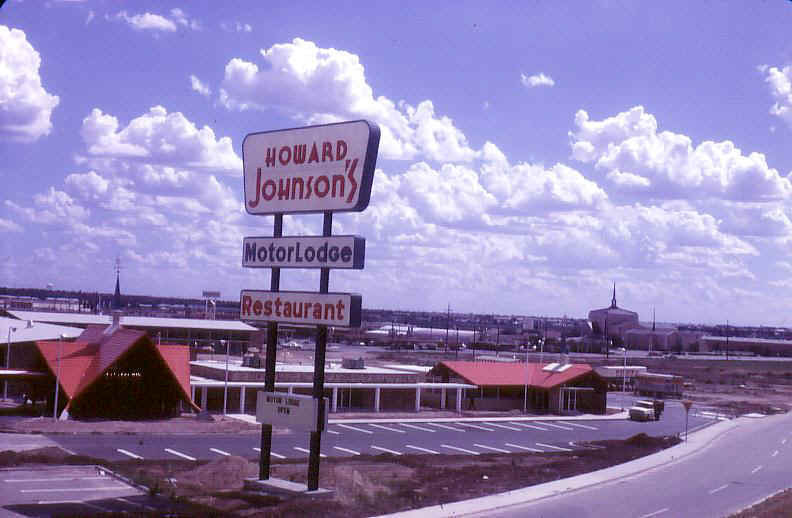 at Fillmore and on I-40 at Paramount Blvd. 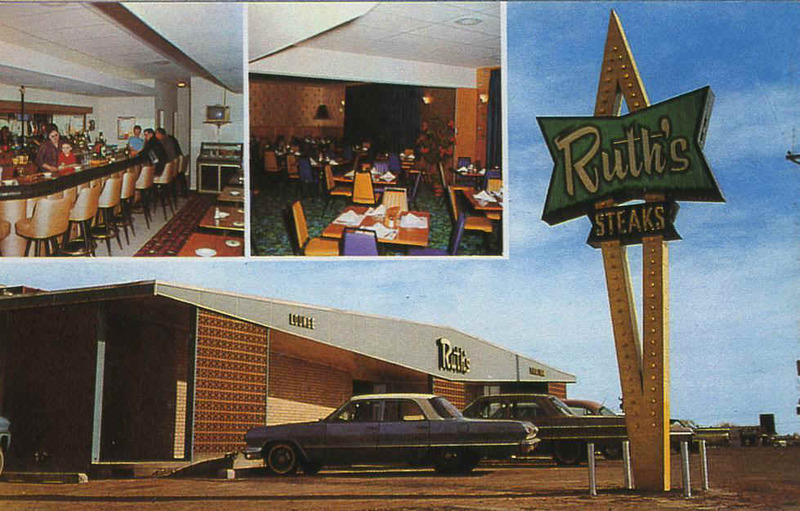 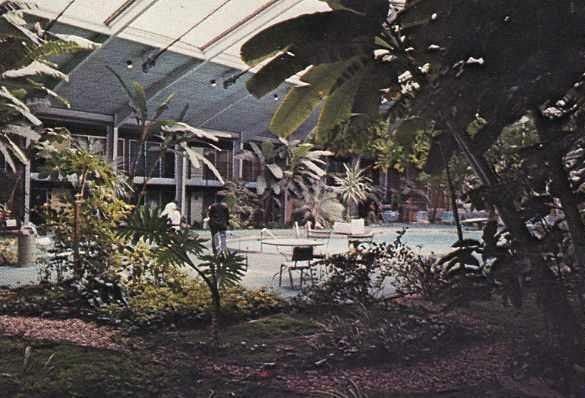 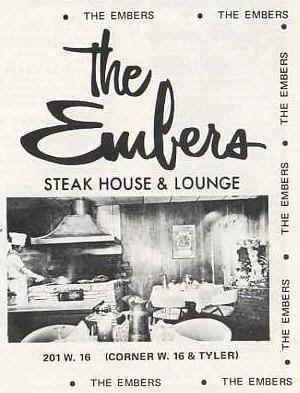 The Zuider Zee Restaurant on I-40 W. opened in 1967. 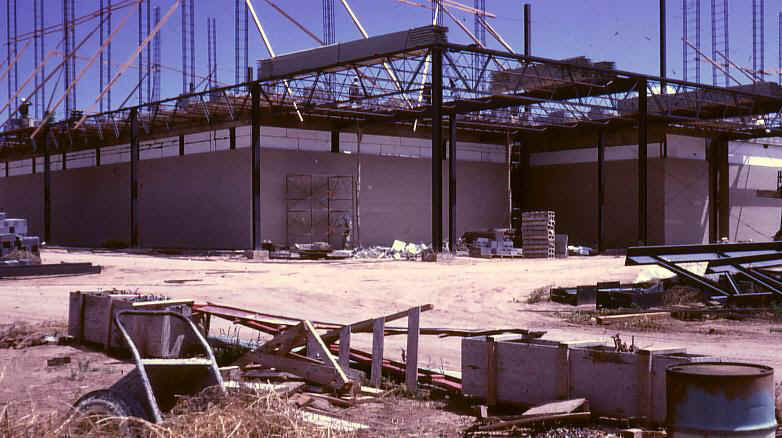 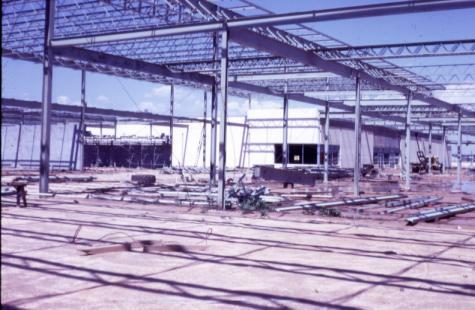 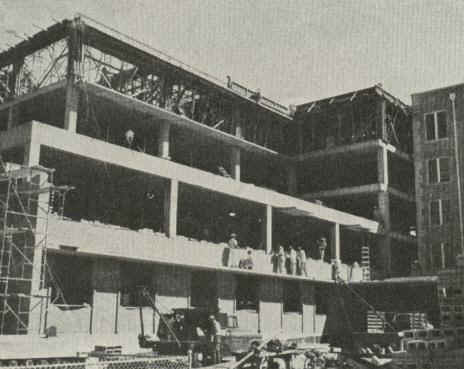 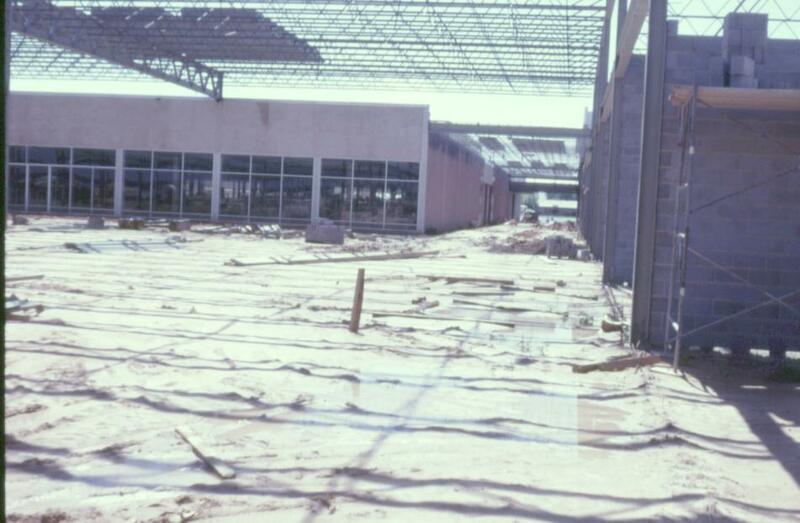 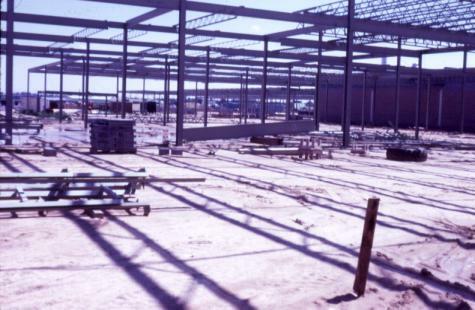 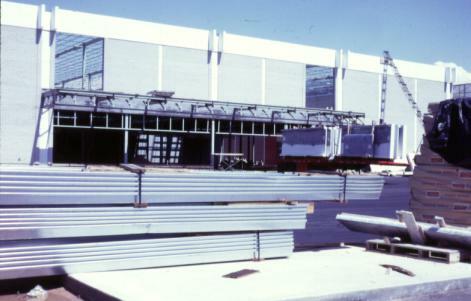 Construction of the Civic Center in 1967. 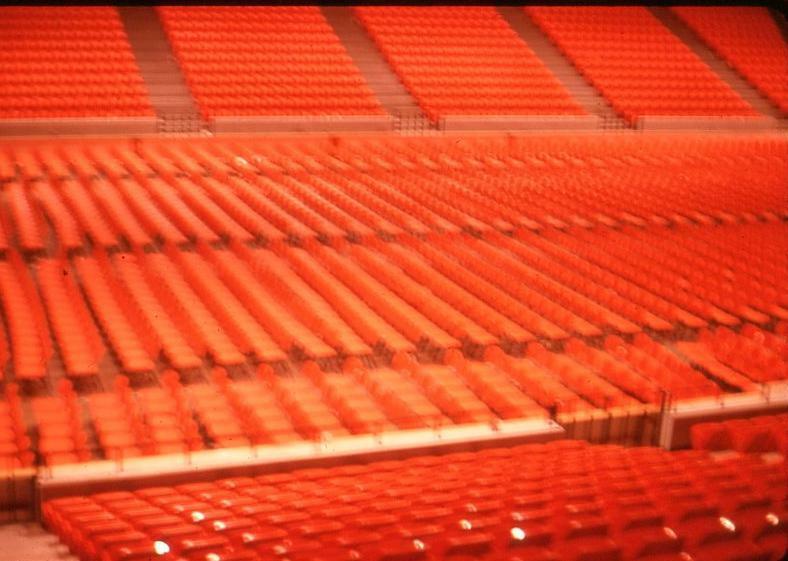 Thousands of brand new seats ready for the first Civic Center concert in 1968. 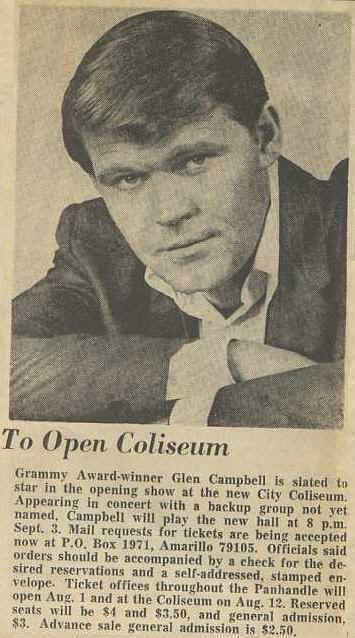 Glen Campbell's Show opened the Civic Center Sept. 3, 1968. 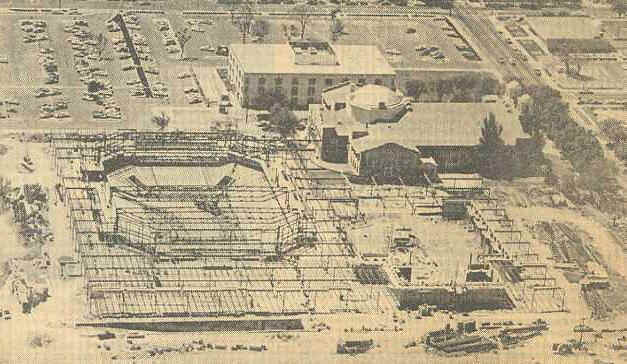 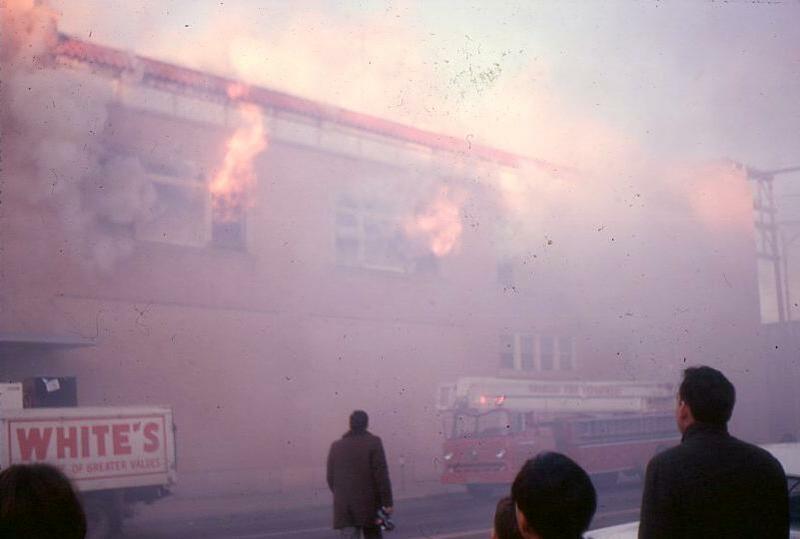 Civic Center Auditorium December 4, 1969. 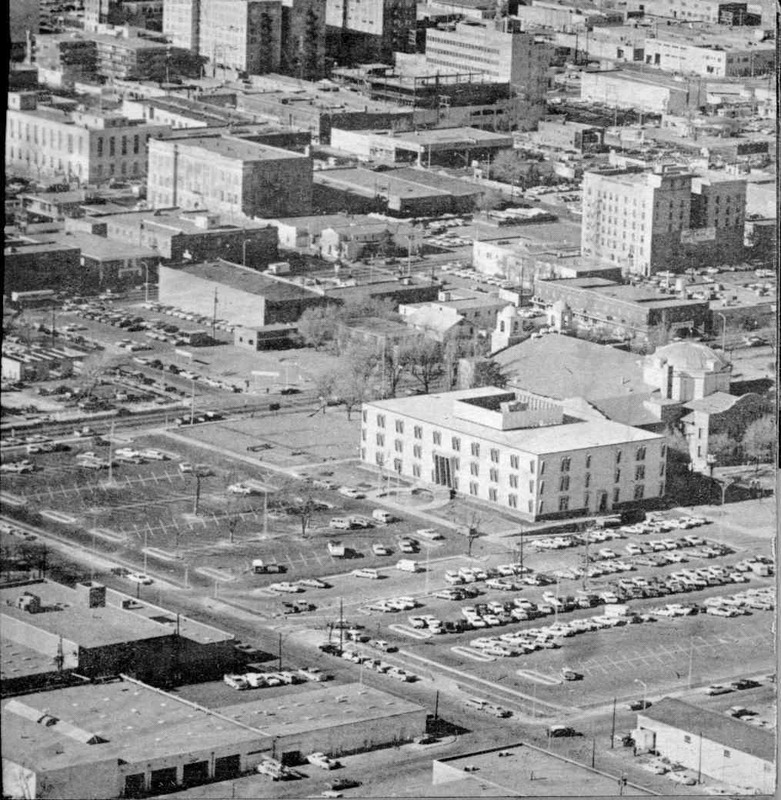 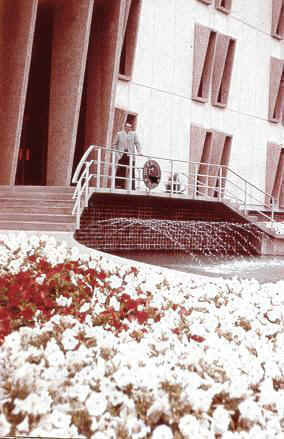 New City Hall and Downtown in 1966. 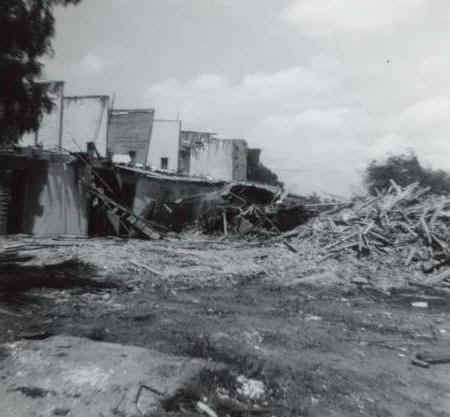 The old City Auditorium is still standing. 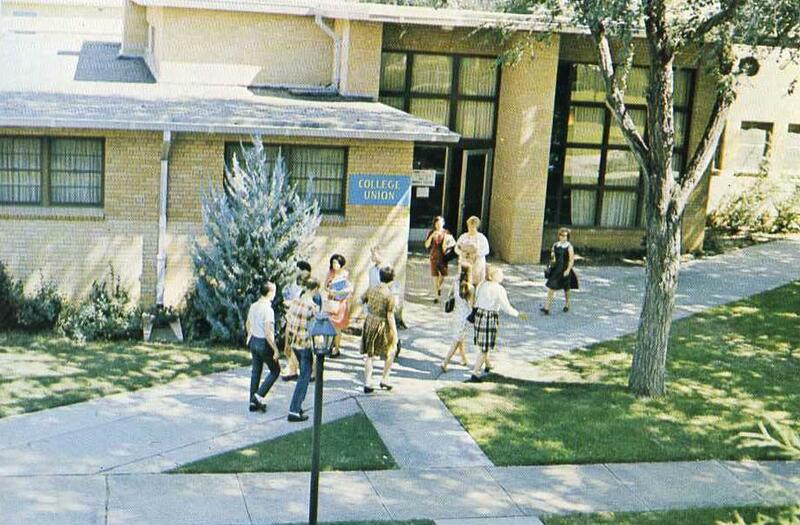 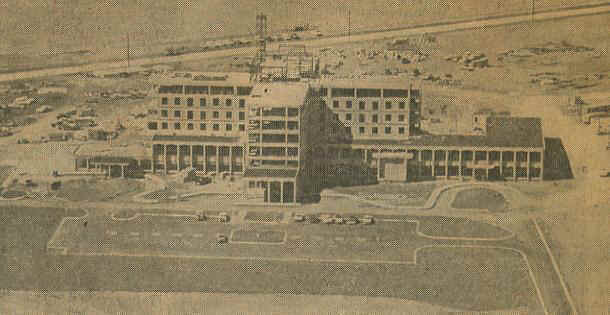 The Business Building and Parcells Hall construction at Amarillo College Washington St. Campus 1967. 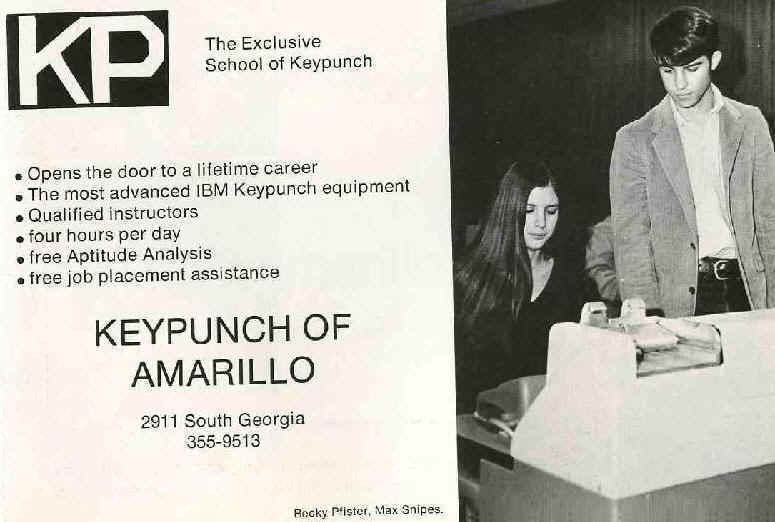 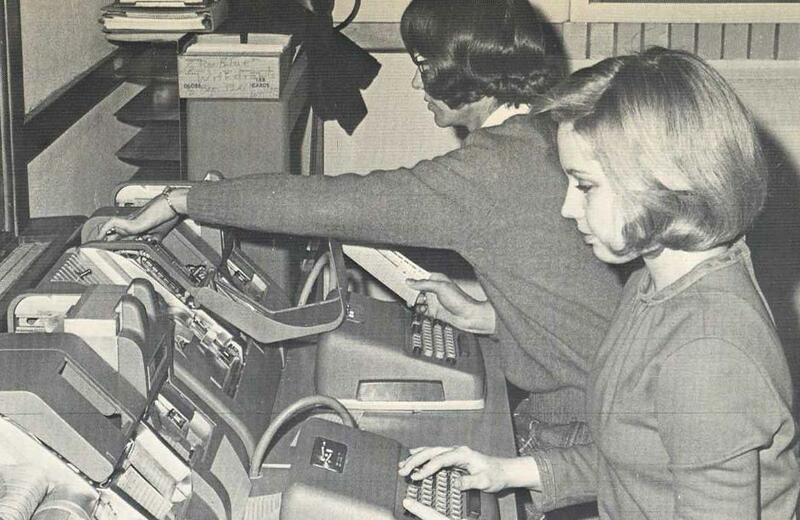 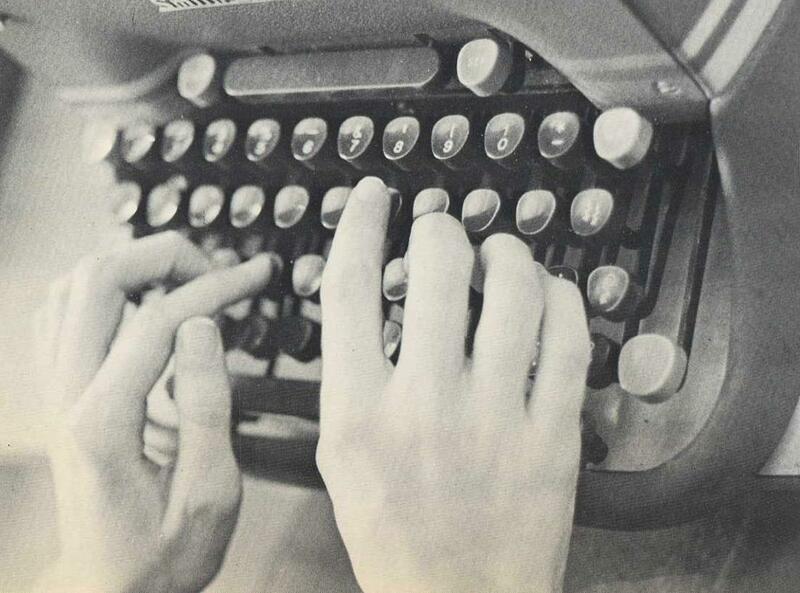 This state-of-the-art IBM computer was installed at Amarillo College in 1967. 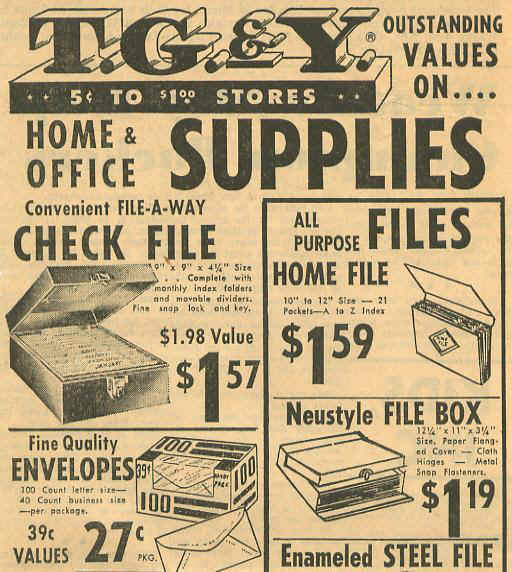 That SYSTEMS tray, which weighed about 10 pounds, would hold 800 to 1000 times less data than the average one ounce thumb drive you use today. 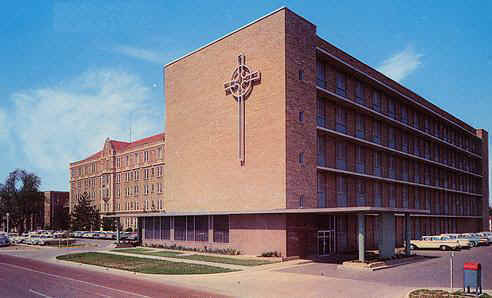 St. Anthony's Hospital built a major addition in 1960. 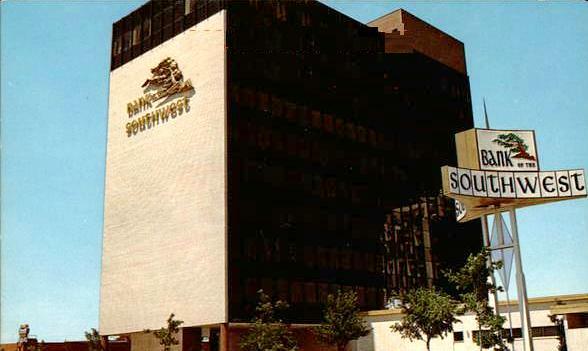 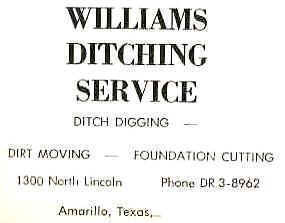 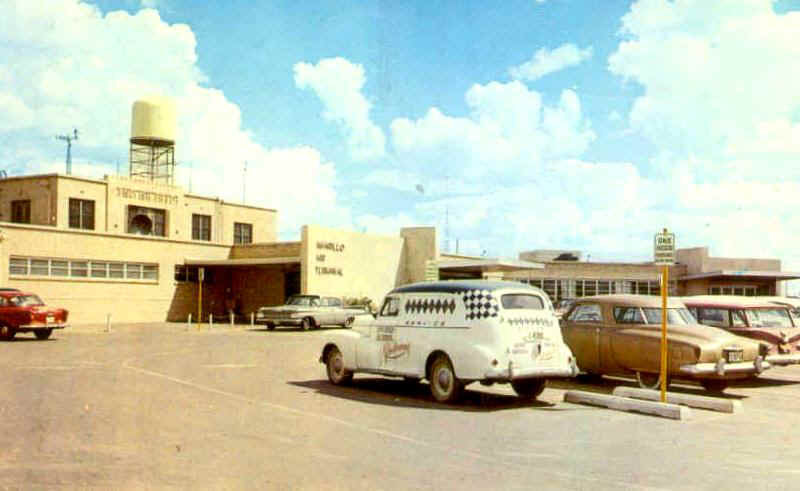 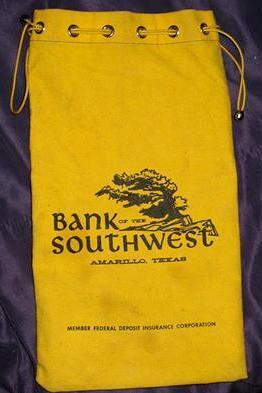 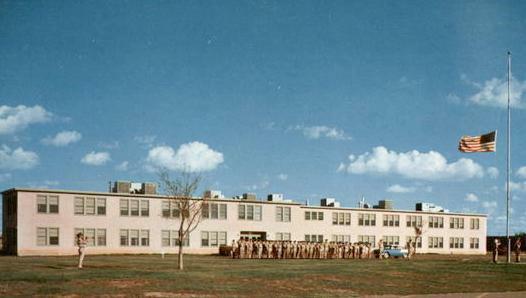 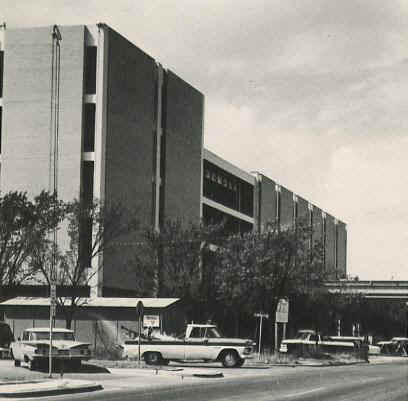 Northwest Texas Hospital moved to a new facility in The Amarillo Harrington Regional Medical Center in 1982. 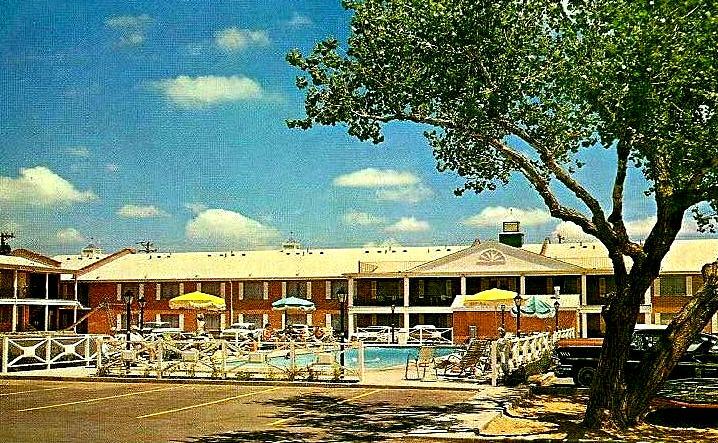 This building is now a retirement center. 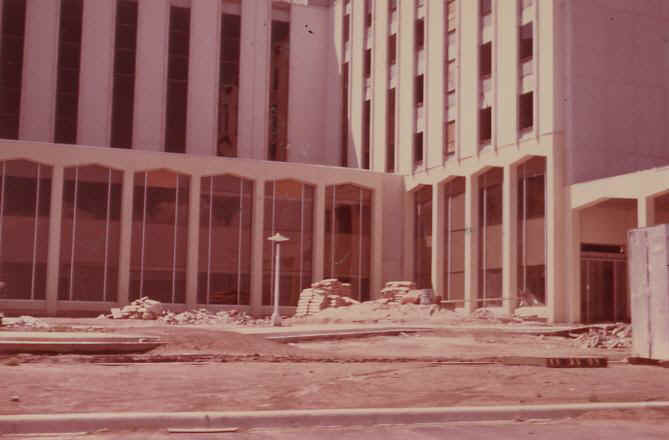 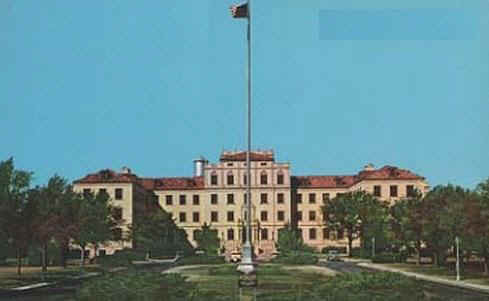 The Medical Center still looked very barren in 1969. 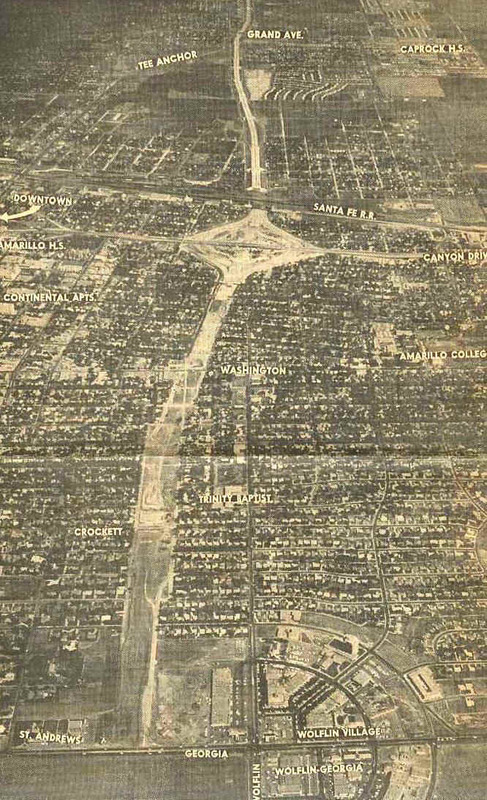 That's Wallace Blvd on the right. 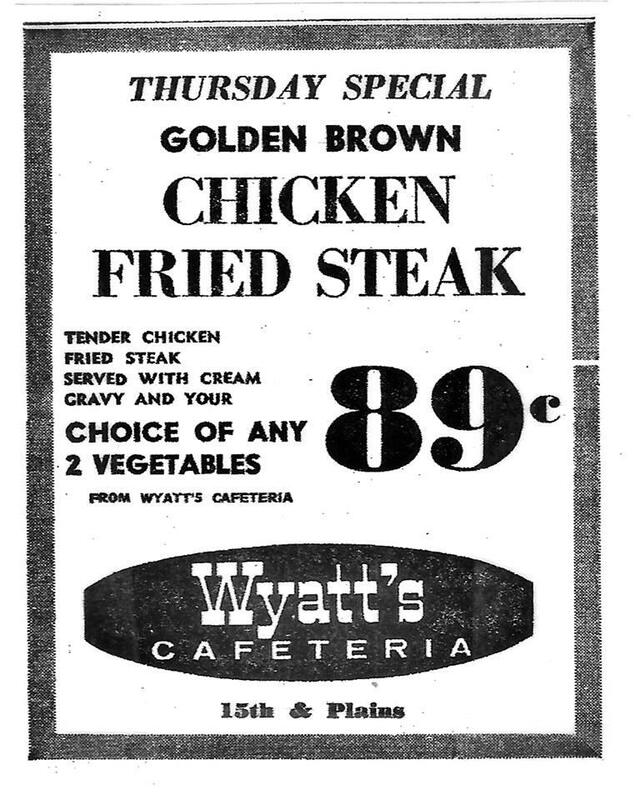 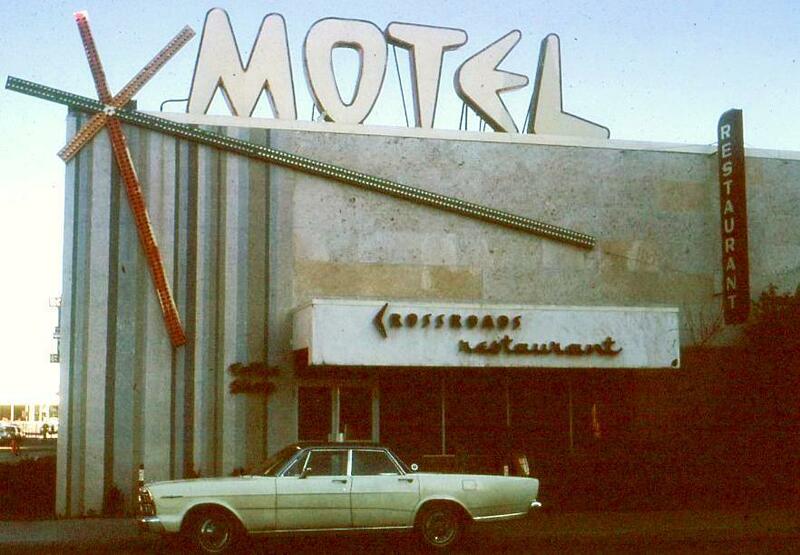 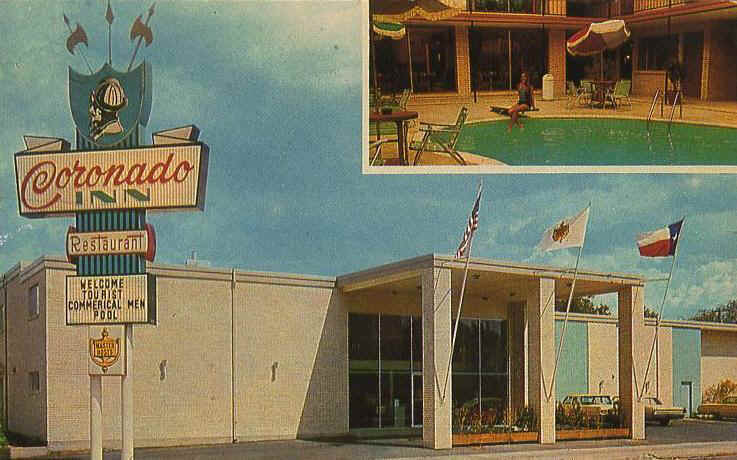 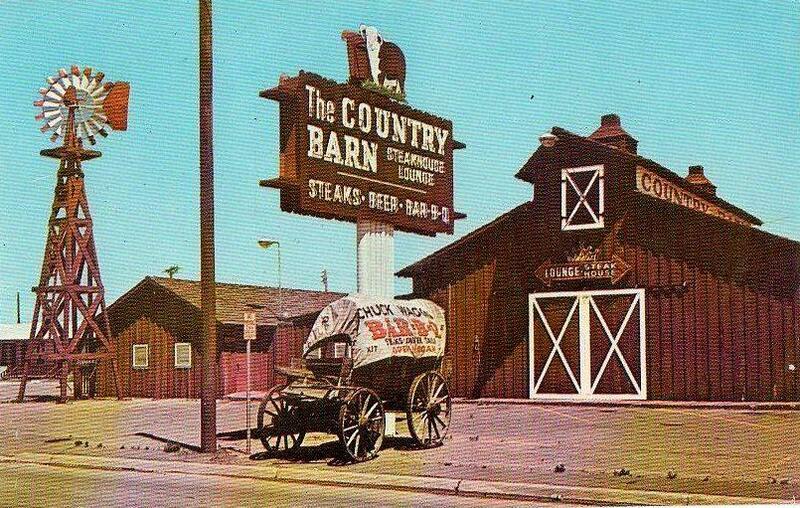 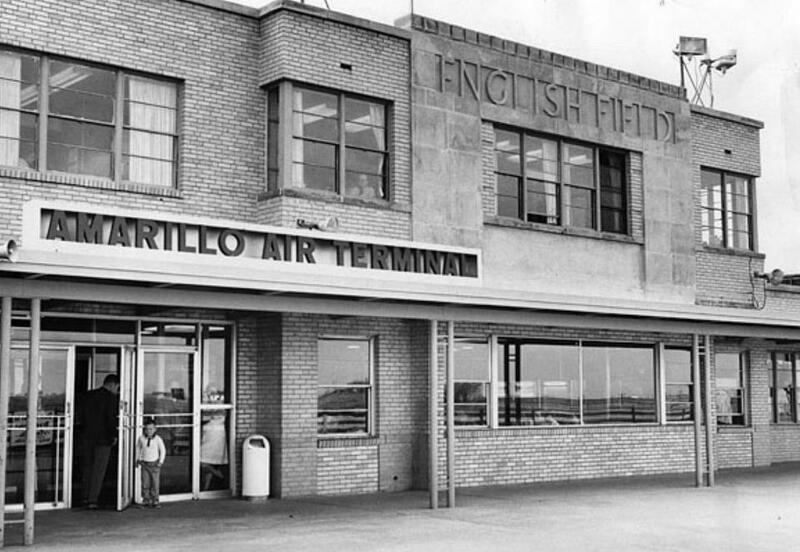 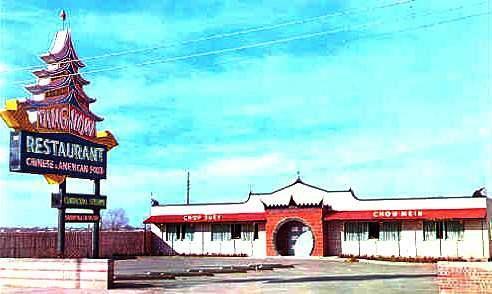 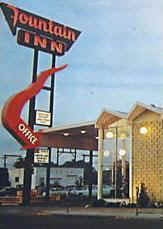 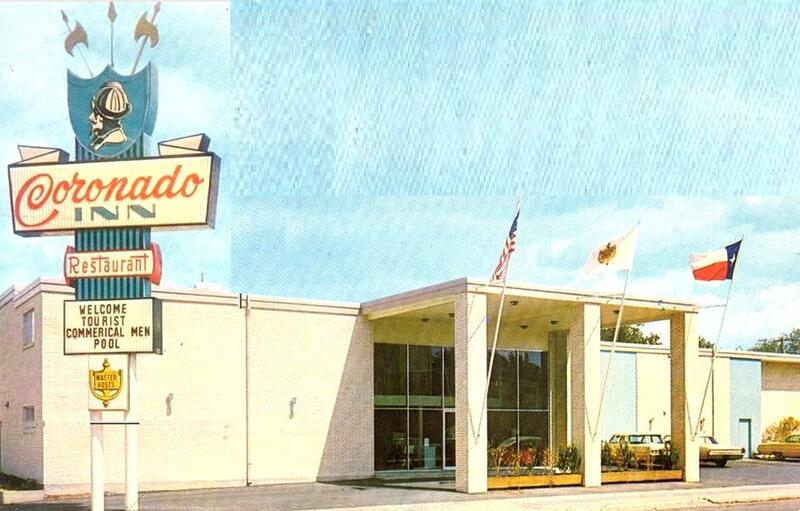 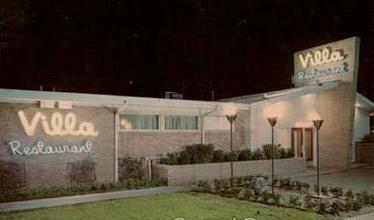 The Coronado Inn & Restaurant at 7th and S. Pierce Downtown made the world's best chicken fried steak (1965-1977). 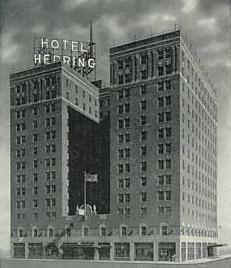 The grand old Herring Hotel (3rd and S. Pierce) is still waiting to be saved. 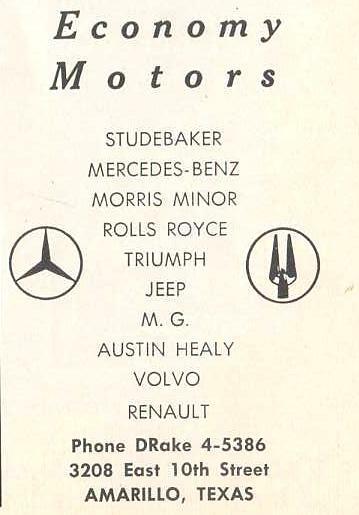 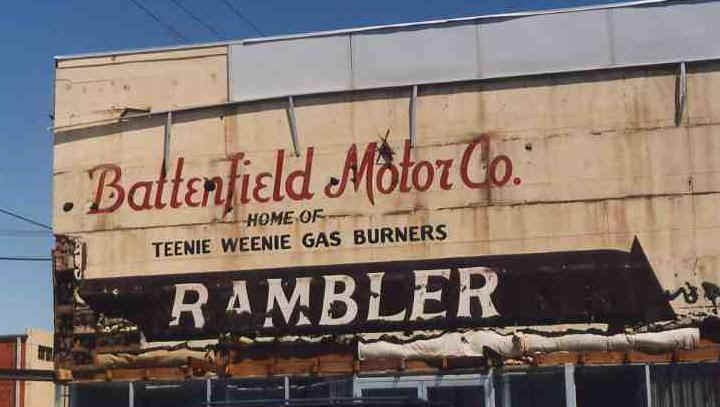 Battenfield Motors at 2nd and S. Polk sold the Rambler line of cars. 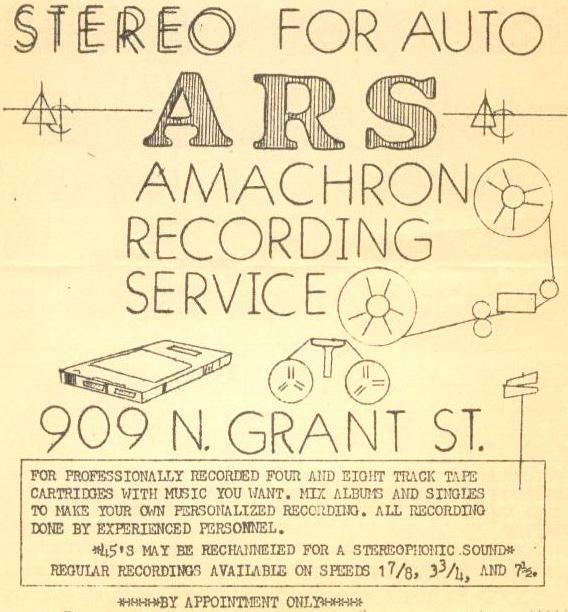 AmaChron at the Fair link at the bottom of this page. 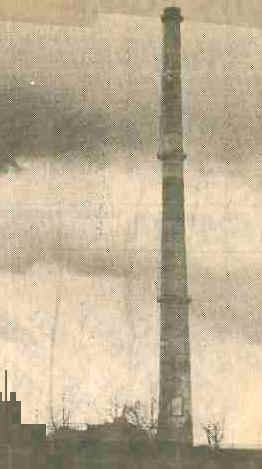 The smokestack at the old Zinc Smelter was a landmark for decades. 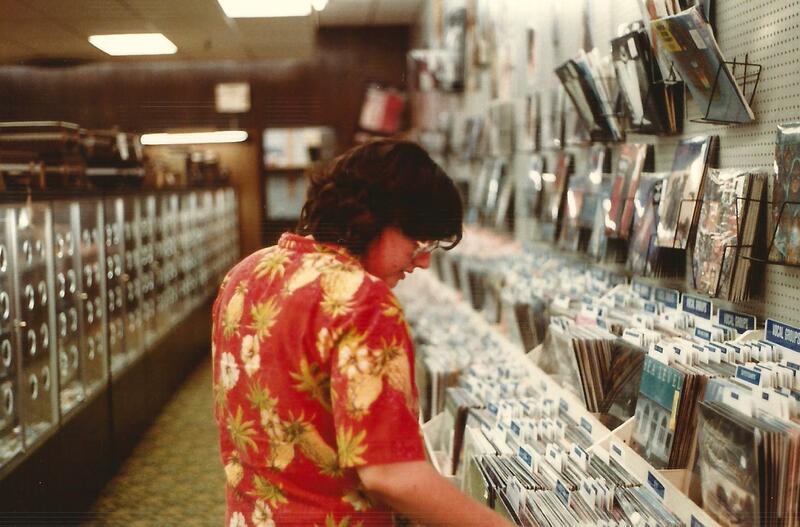 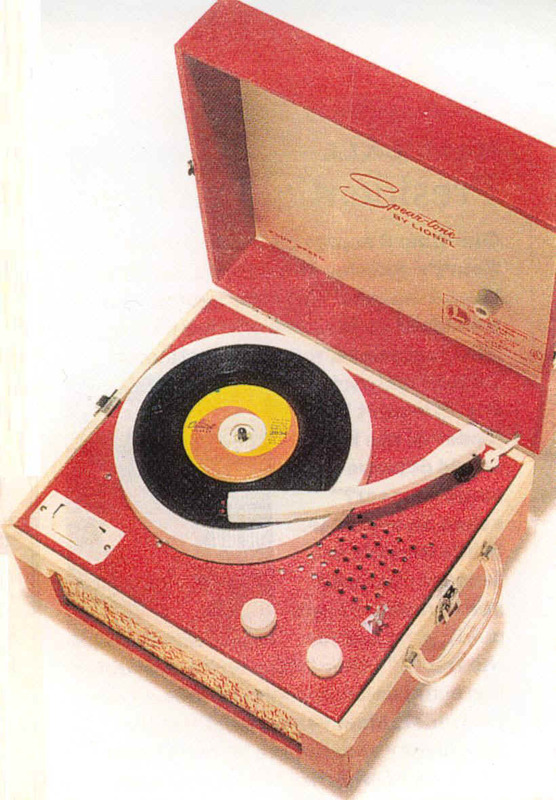 How you played your first records. 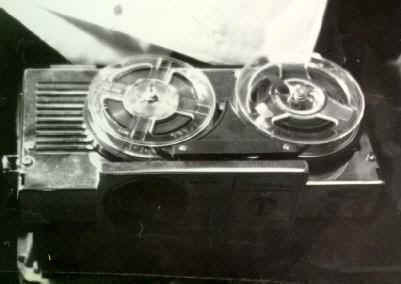 Might have been your first tape recorder. 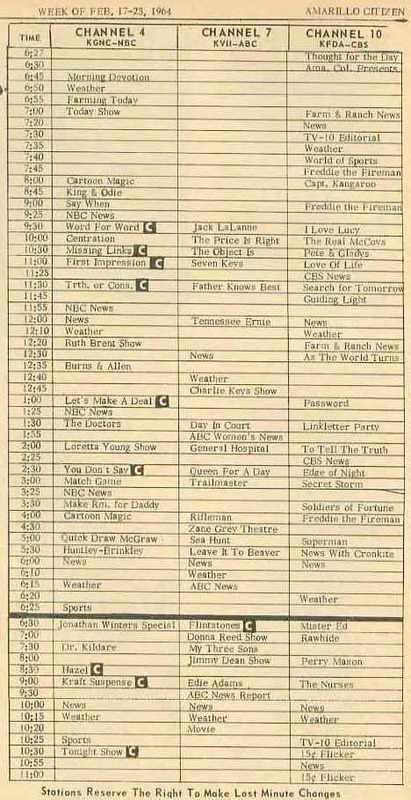 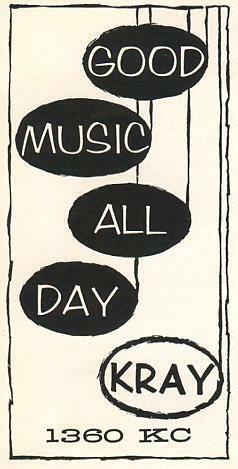 It was a very simple TV Schedule in 1964. 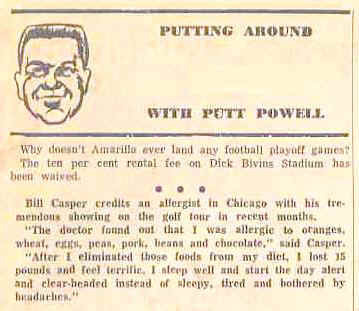 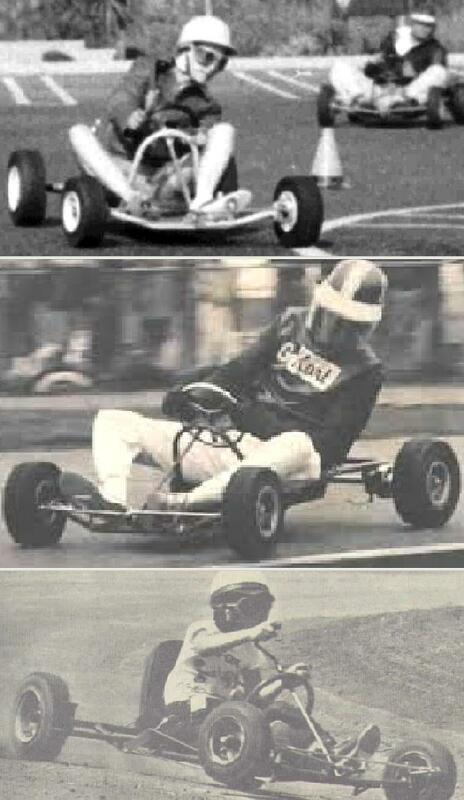 Putt Powell was a legend. 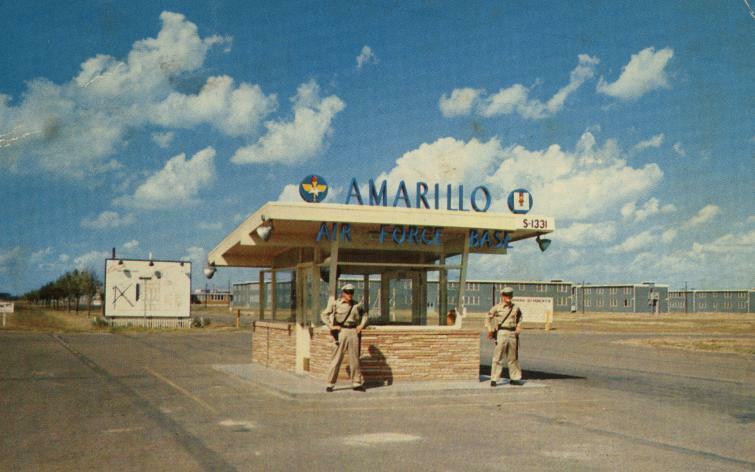 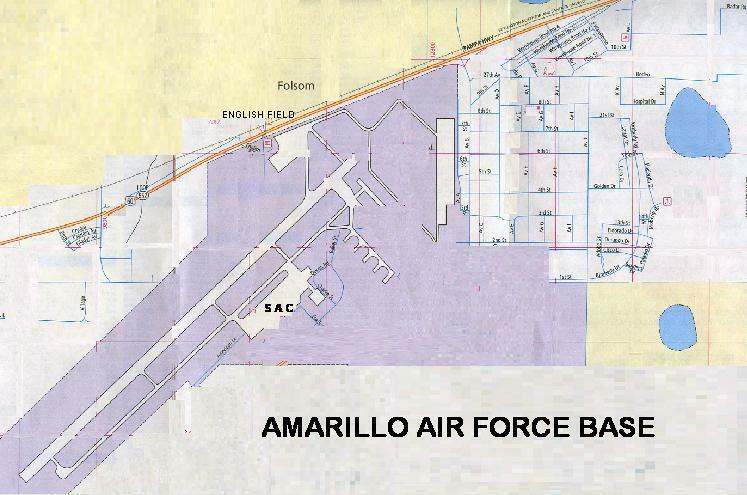 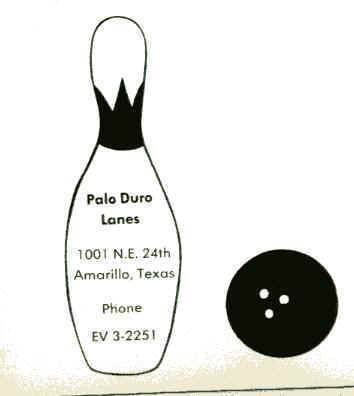 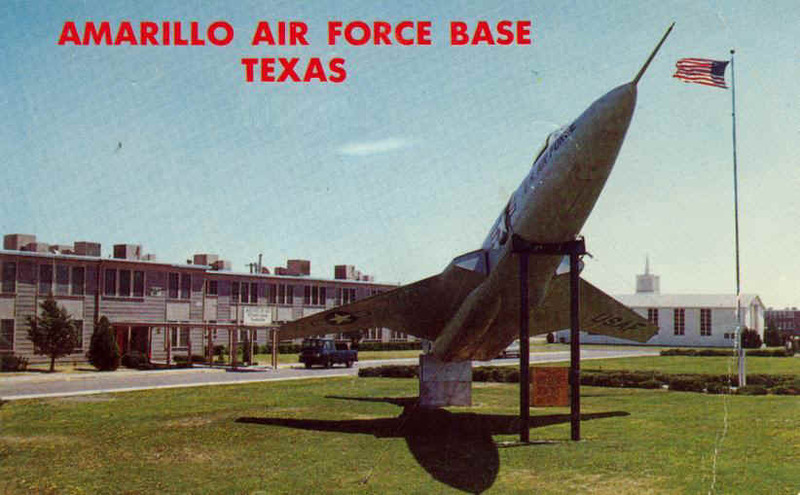 The Amarillo Bowl has been demolished and replaced with a parking lot. 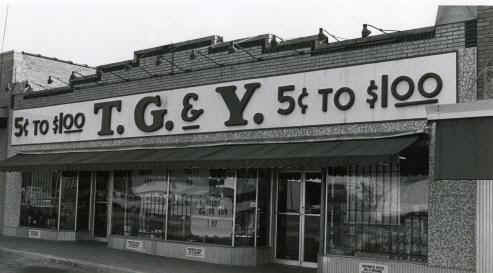 A glass of iced tea would cost you 29¢ more. 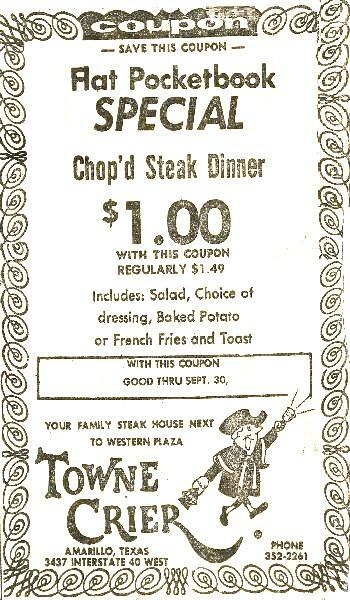 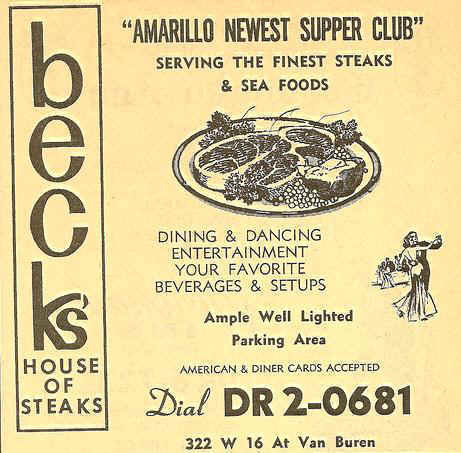 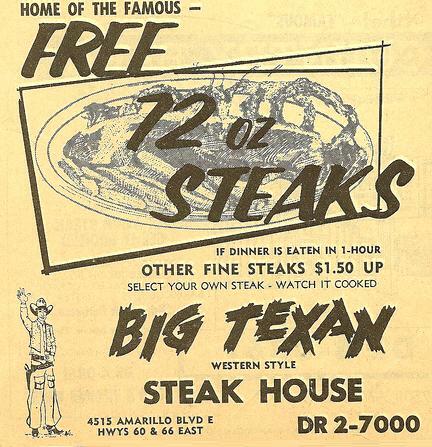 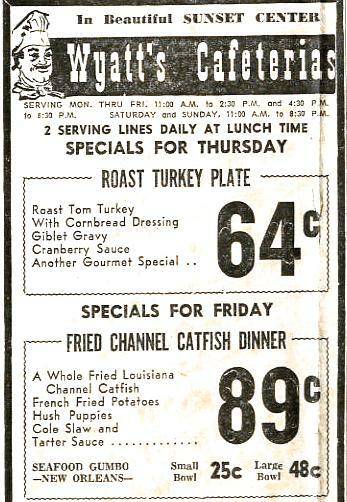 Steak for a buck in 1968. 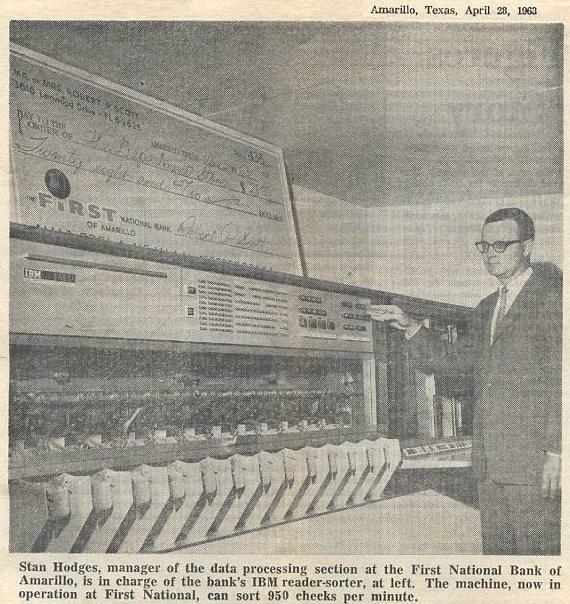 First National Bank's 1963 IBM check processor. 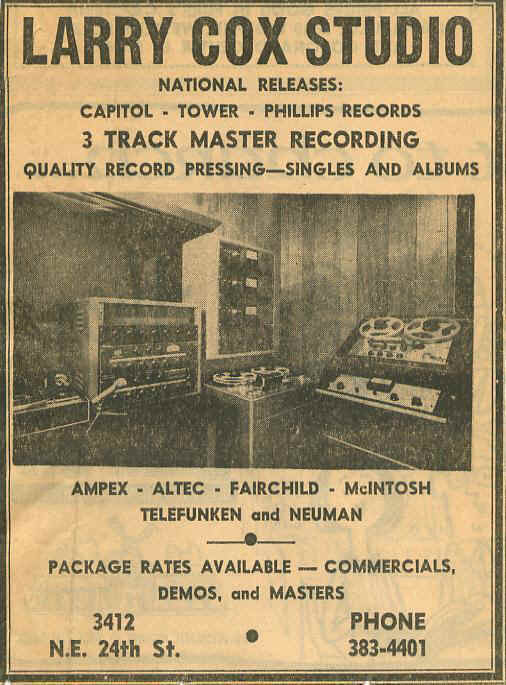 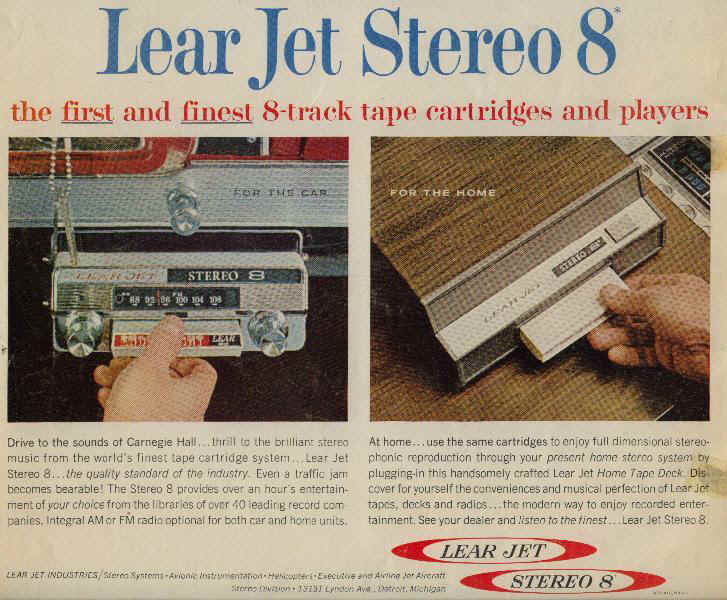 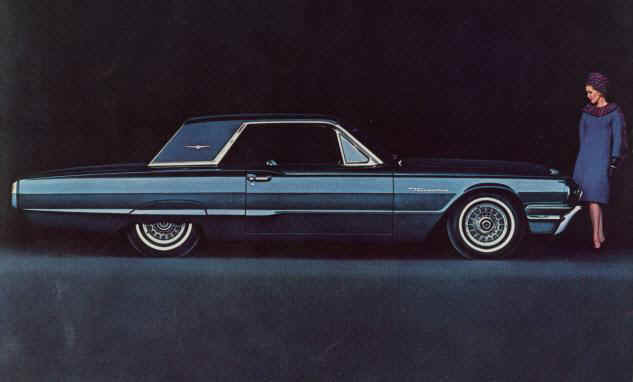 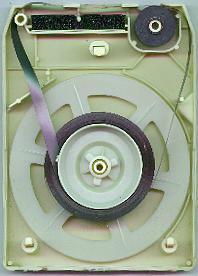 4-track and later 8-track tape was the first practical way to listen to the music of your choice in a car. 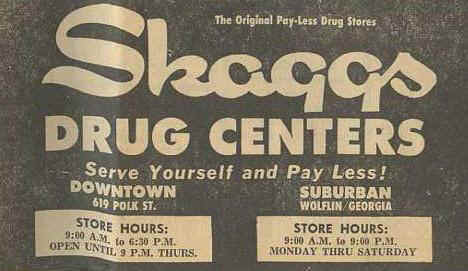 The Downtown Skagg's operated until 1970. 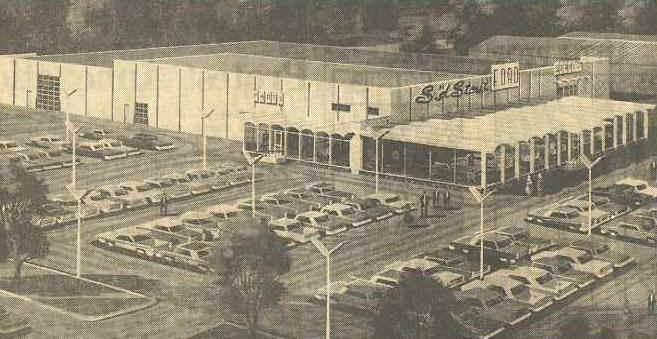 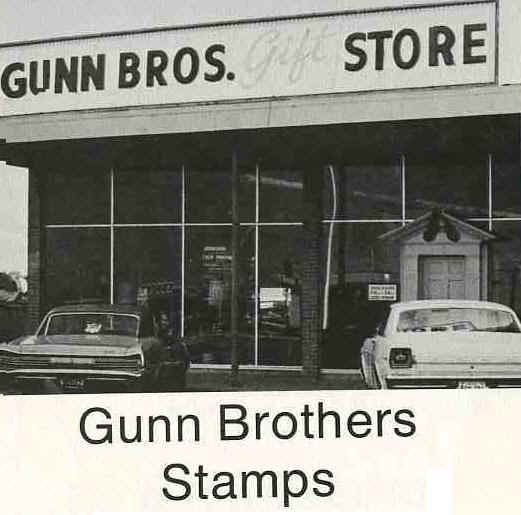 It was one of the busiest stores in town. 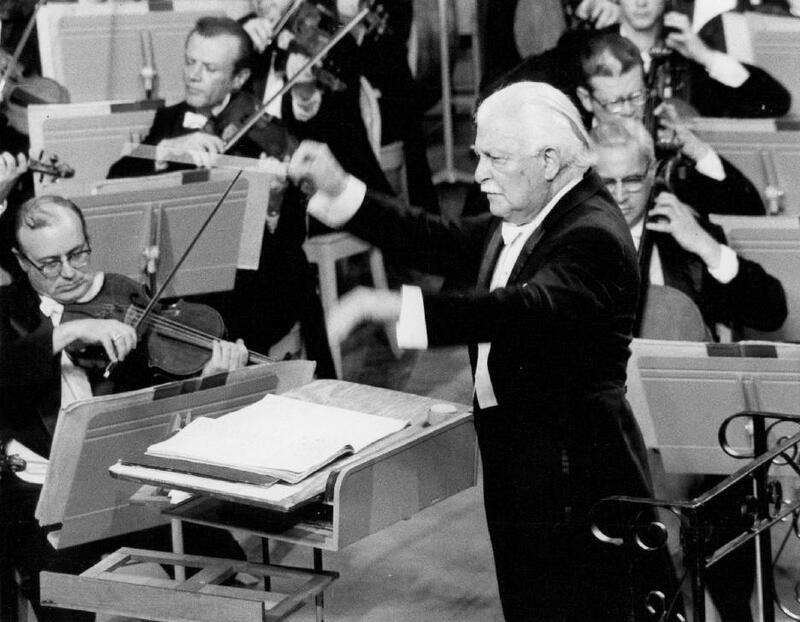 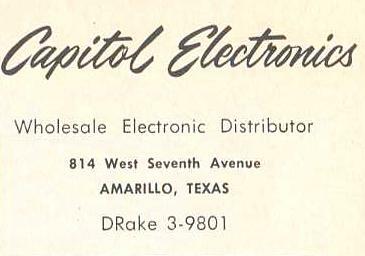 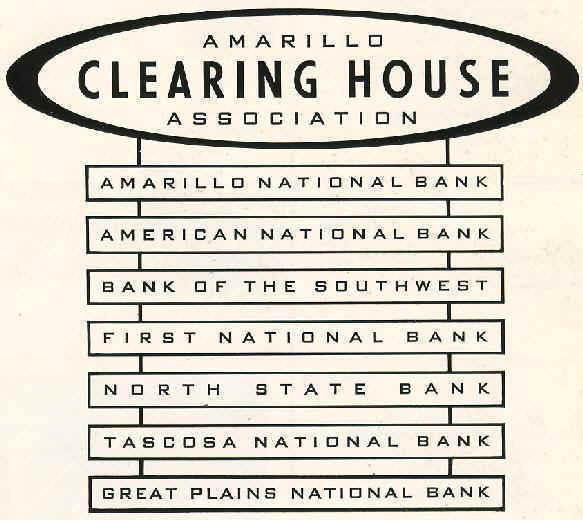 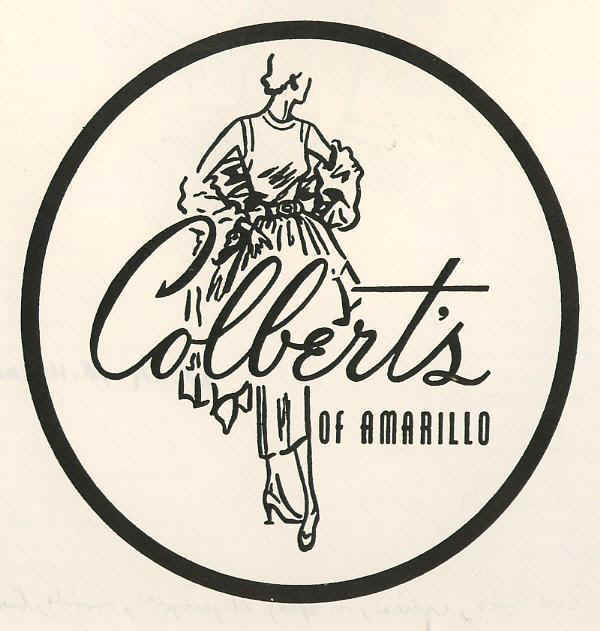 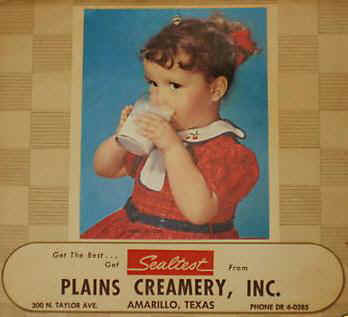 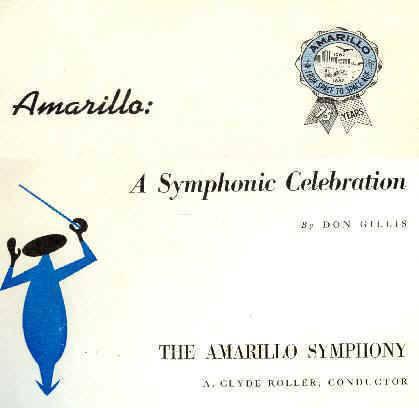 The Amarillo Symphony recorded an album in 1962. 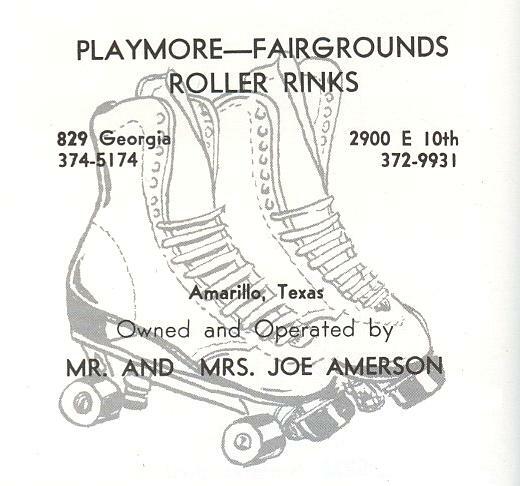 Wranglers Ice Hockey came to the Civic Center ice rink in 1968. 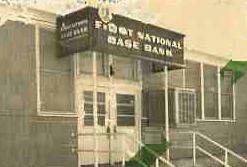 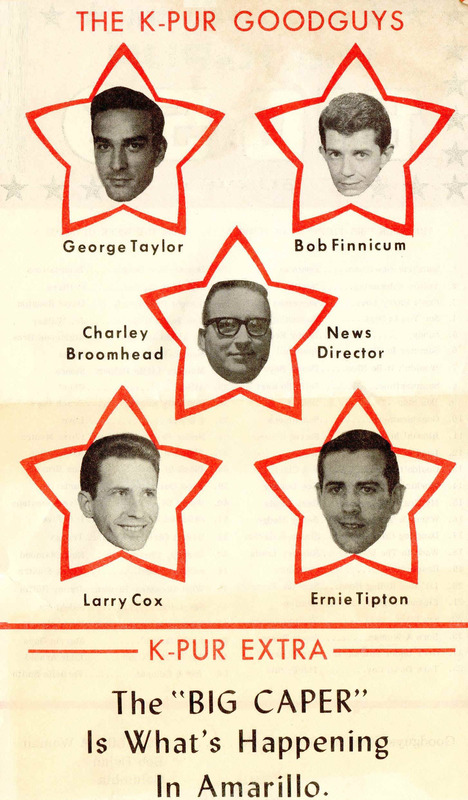 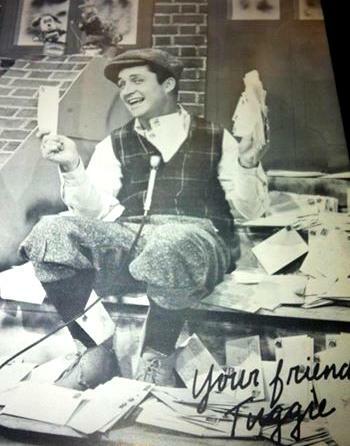 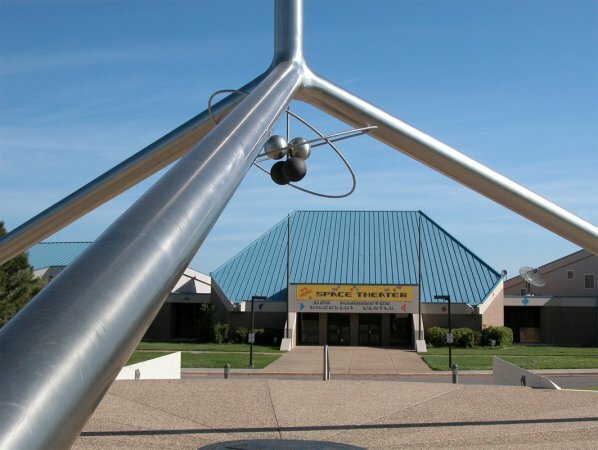 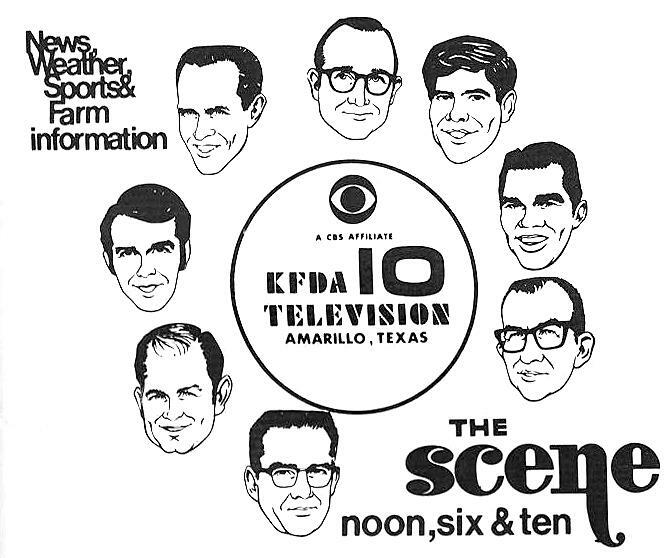 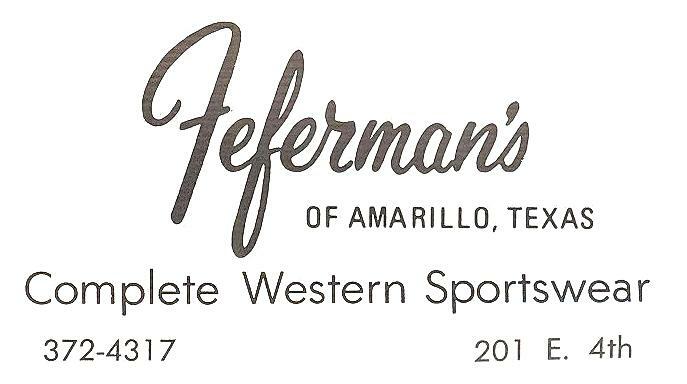 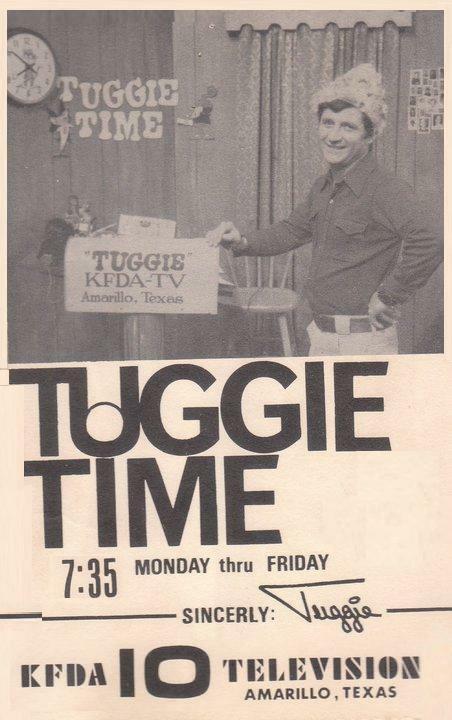 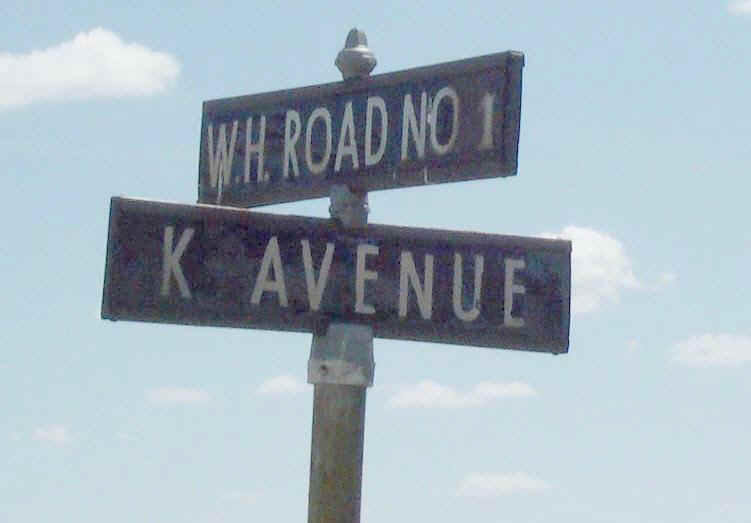 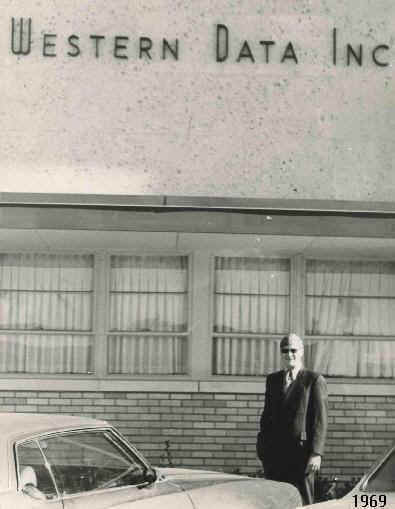 KFDA 1440 AM Radio was renamed on September 1, 1966 and George Taylor signed on the station with the new call letters KPUR ("The Big Caper"). 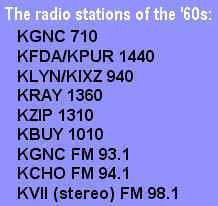 If you weren't listening to KPUR you were probably listening to KIXZ 940 AM. 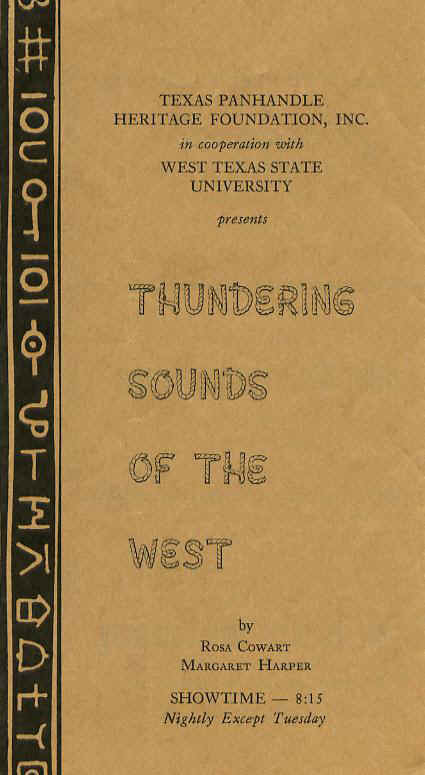 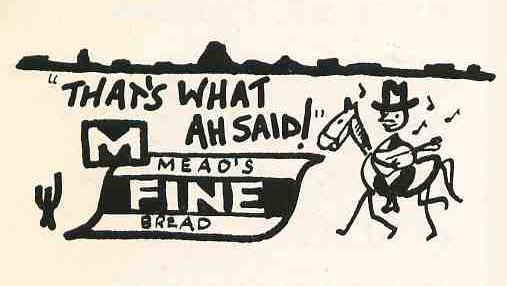 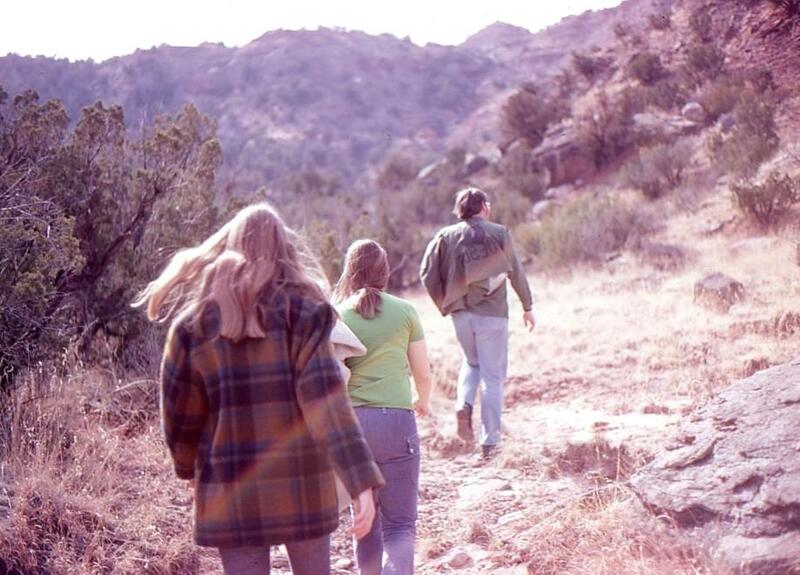 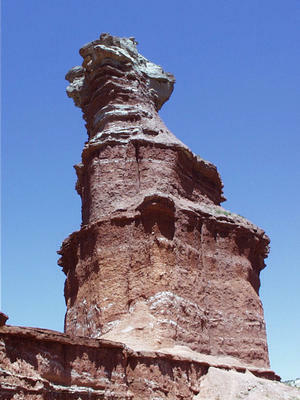 The year before the play "TEXAS" opened in the Palo Duro Canyon amphitheater "THUNDERING SOUNDS OF THE WEST" was presented (1965). 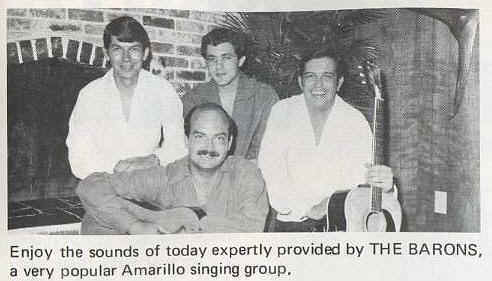 Jimmy Gilmer and The Fireballs? 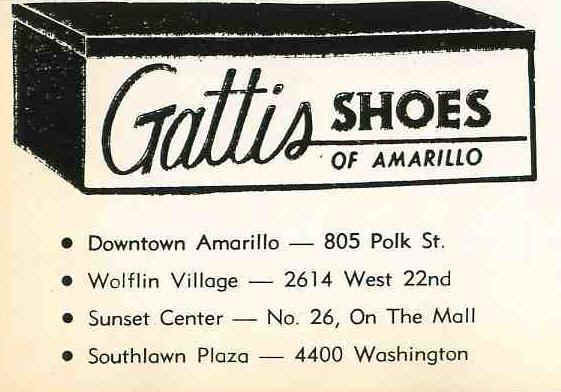 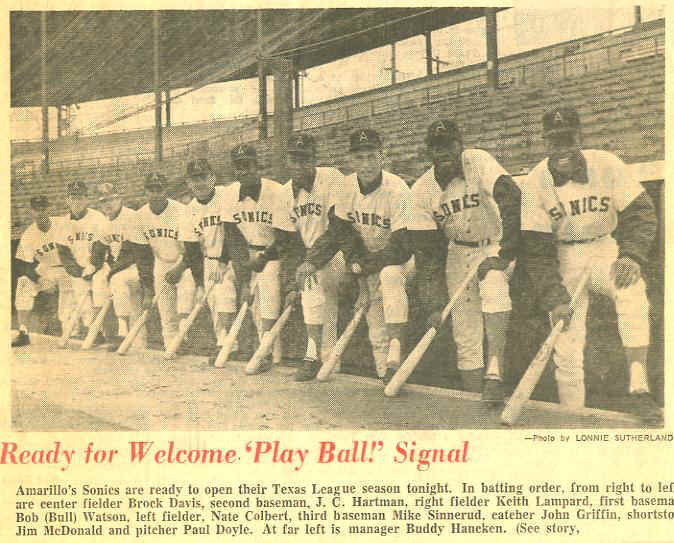 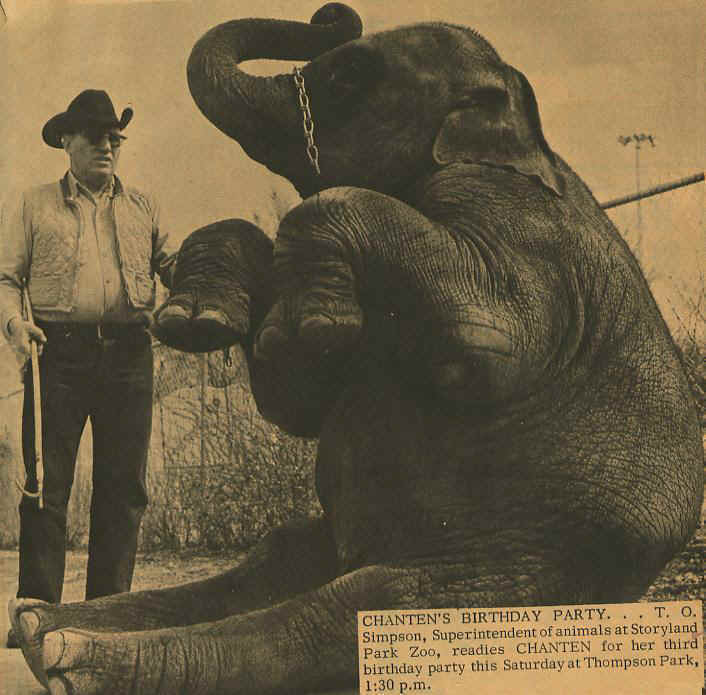 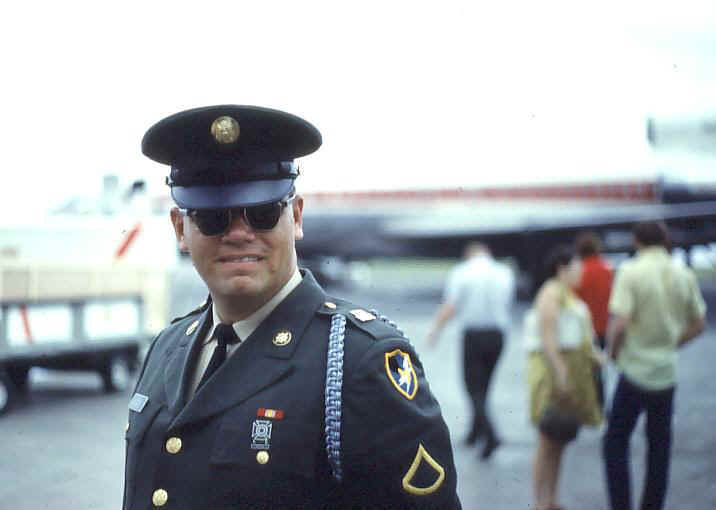 Jimmy Gilmer was born in Chicago but grew up in Amarillo. 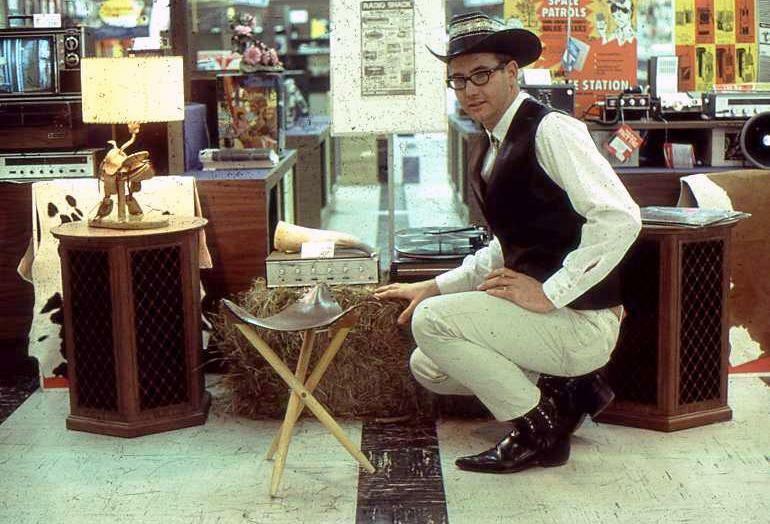 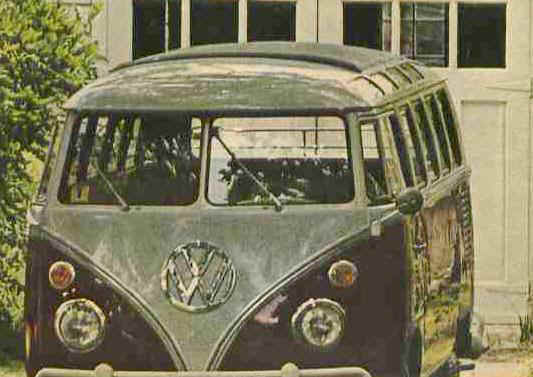 "Sugar Shack" was the #1 selling record of 1963. 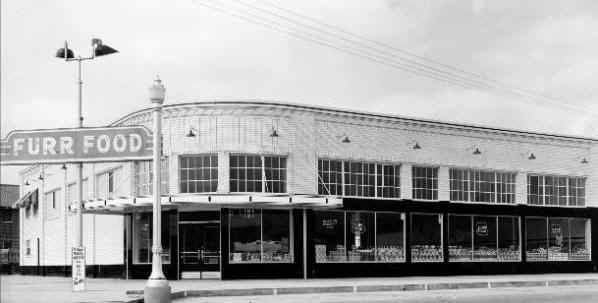 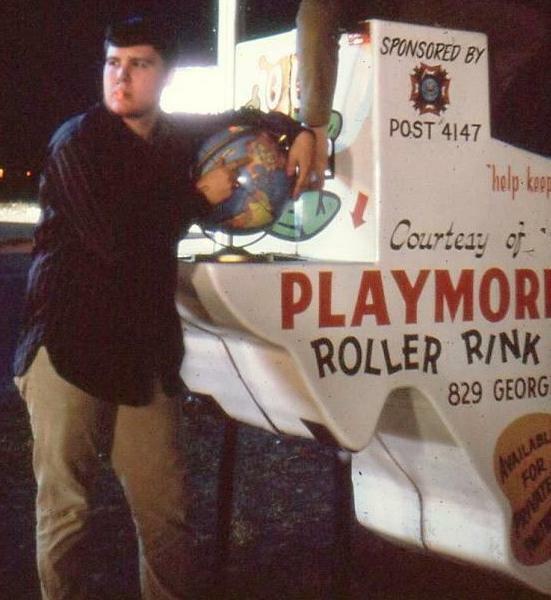 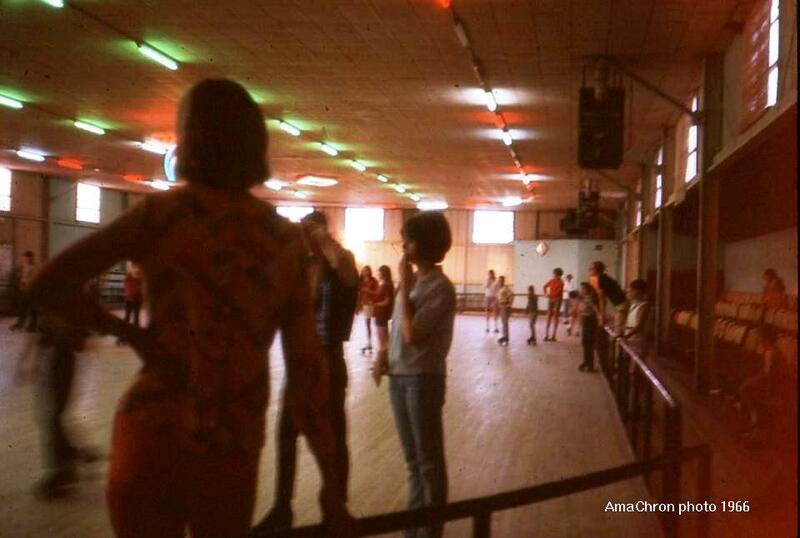 The Sugar Shack teen club, inspired by the song, opened in the Trades Fair Shopping Center on NE 24th Ave that year. 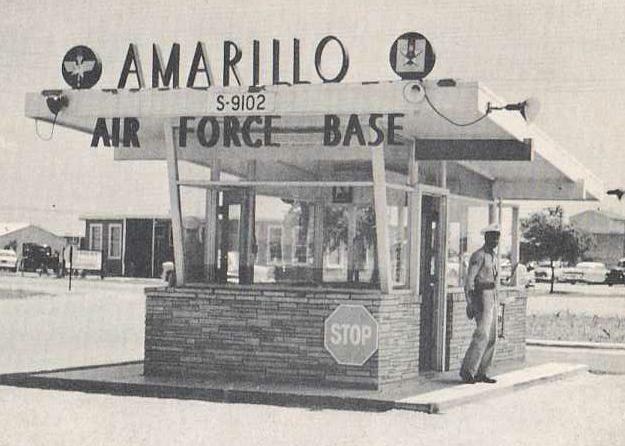 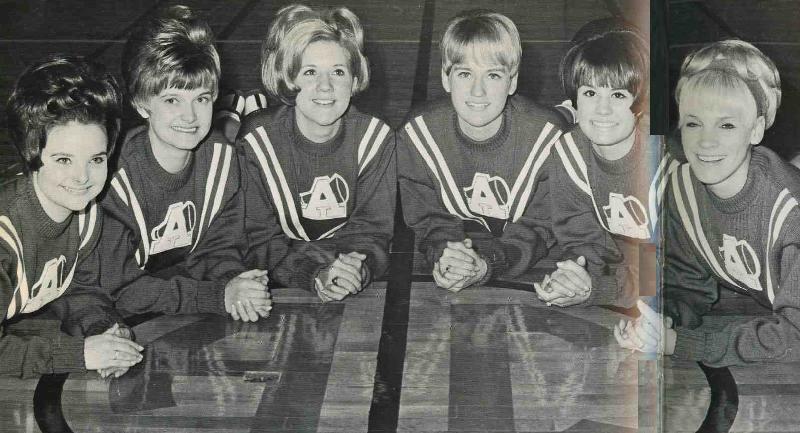 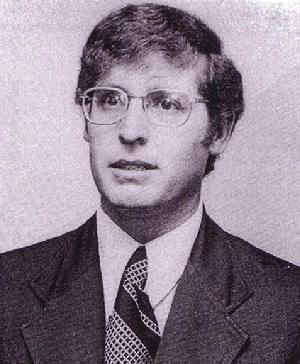 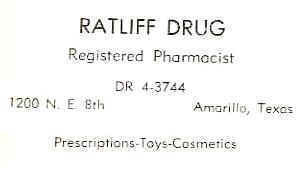 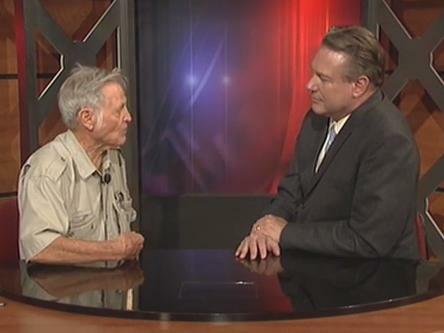 Terry Stafford graduated from Amarillo's Palo Duro High School in 1960. 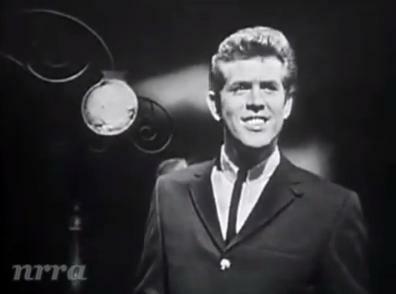 He had Top 40 hits "Suspicion" and "I'll Touch A Star" in 1964. 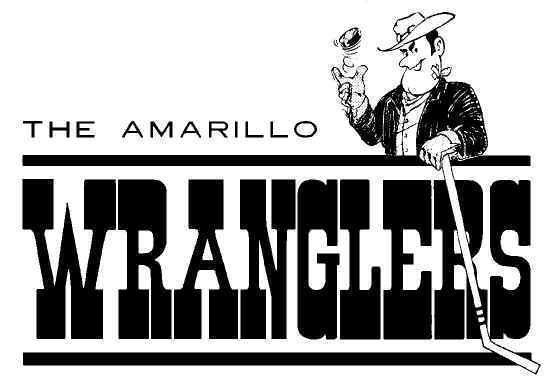 In 1971 he wrote the song "Amarillo By Morning" which George Strait recorded in 1982. 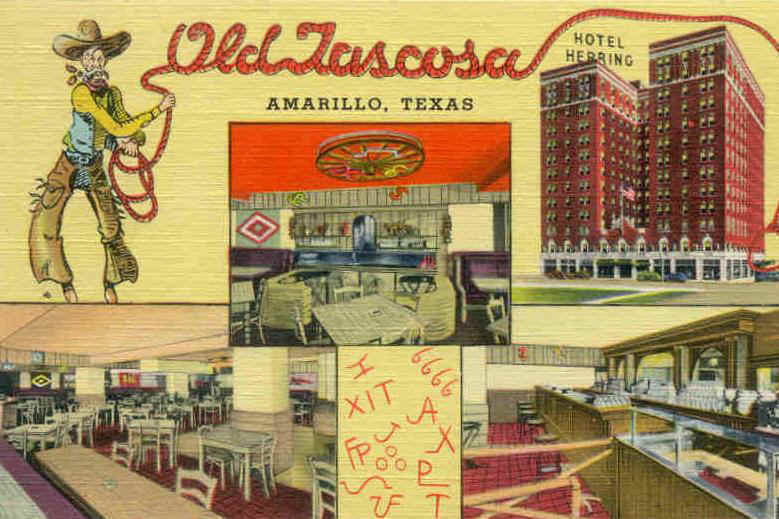 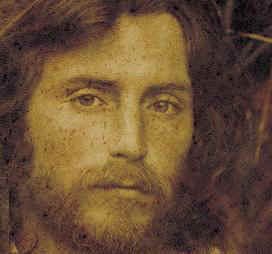 Noted singer-songwriter J. D. Souther was raised in Amarillo and graduated from Tascosa High School in 1964. 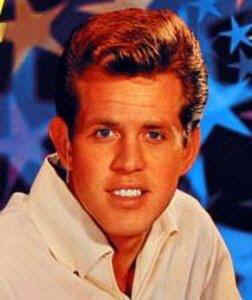 He was associated with The Eagles, Linda Ronstadt, and several other recording artists. 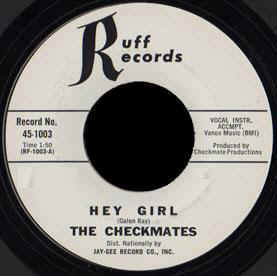 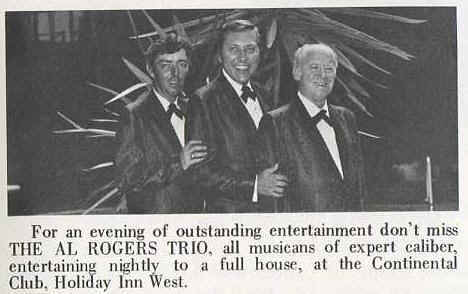 J. D. was also in a local band with Charlie Bates and Steve Dodge. 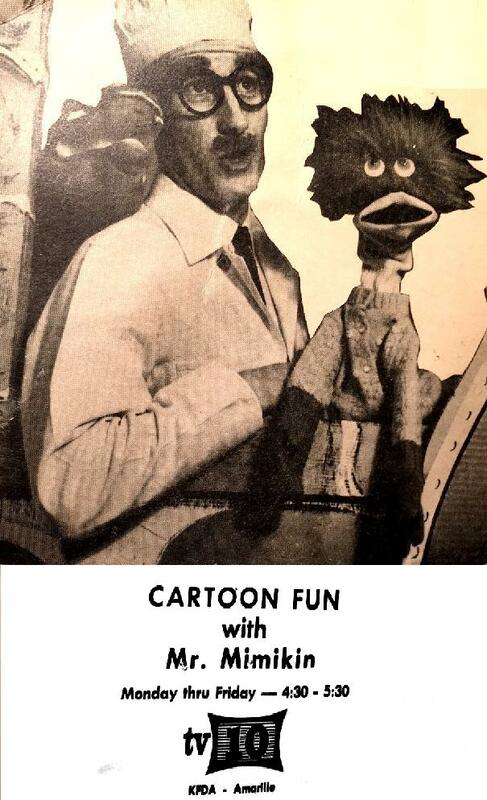 Click the image below for details. 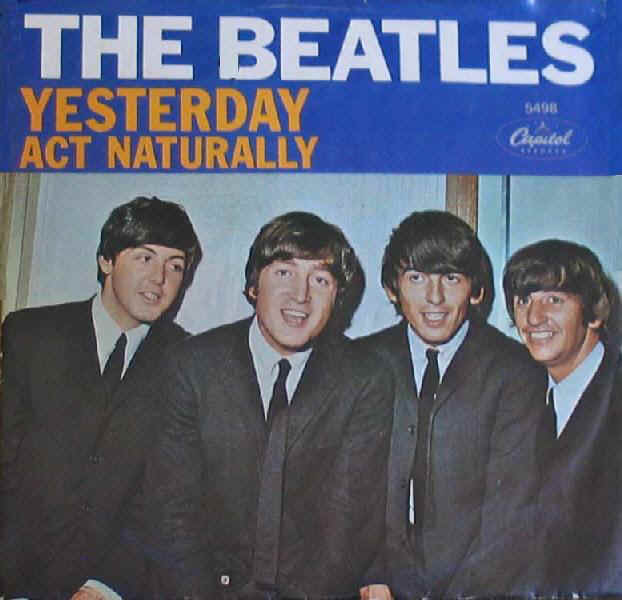 "Yesterday" is the most recorded song in history with more than 3,000 covers so far. 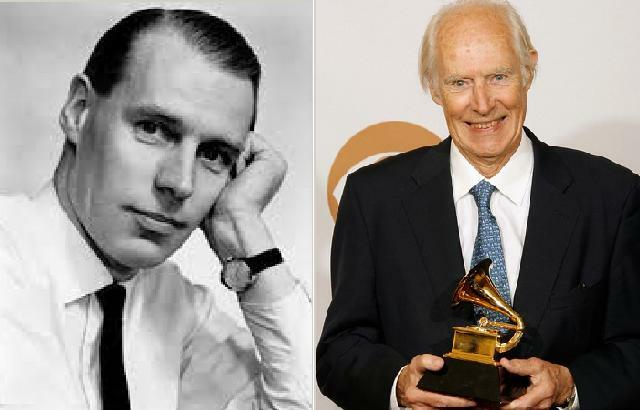 George Martin, the Beatles legendary mentor-producer, aka "The 5th Beatle". 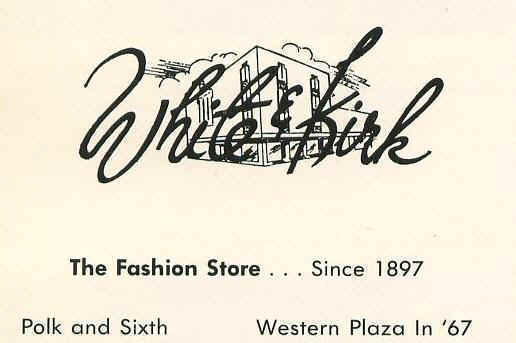 . . .Thank you for visiting. 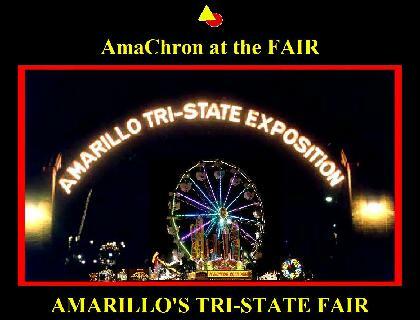 . .
New photos and information are added regularly so stop by often. 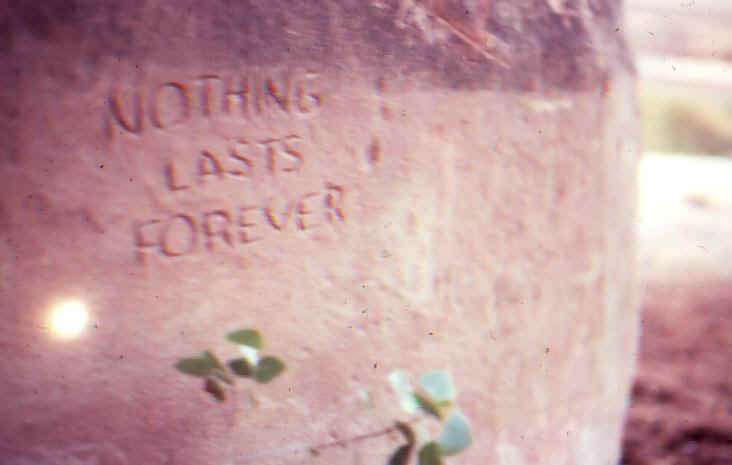 "It is the doom of men that they forget."